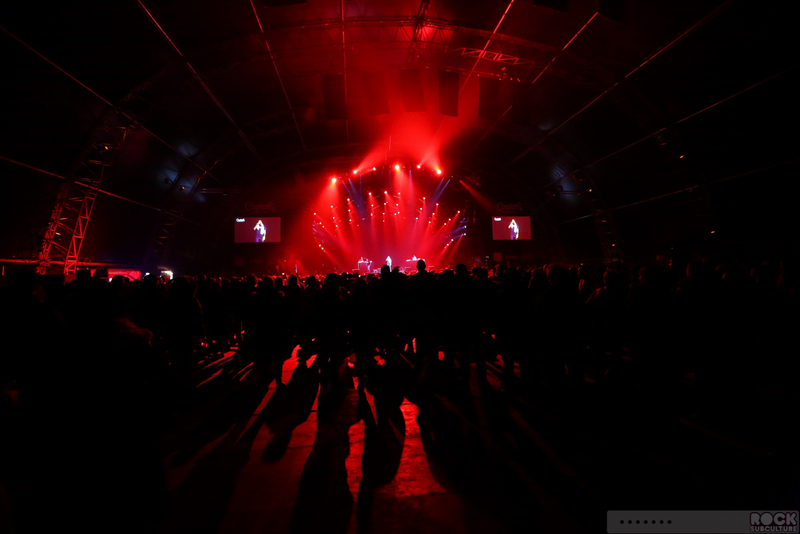 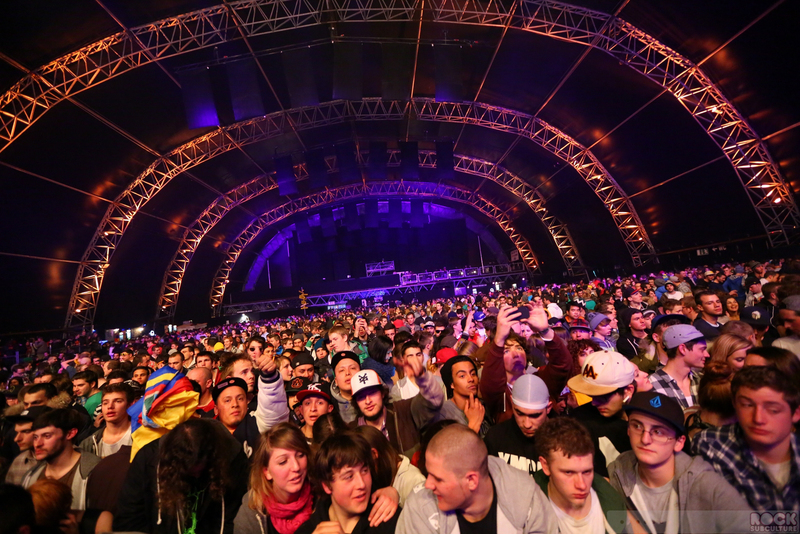 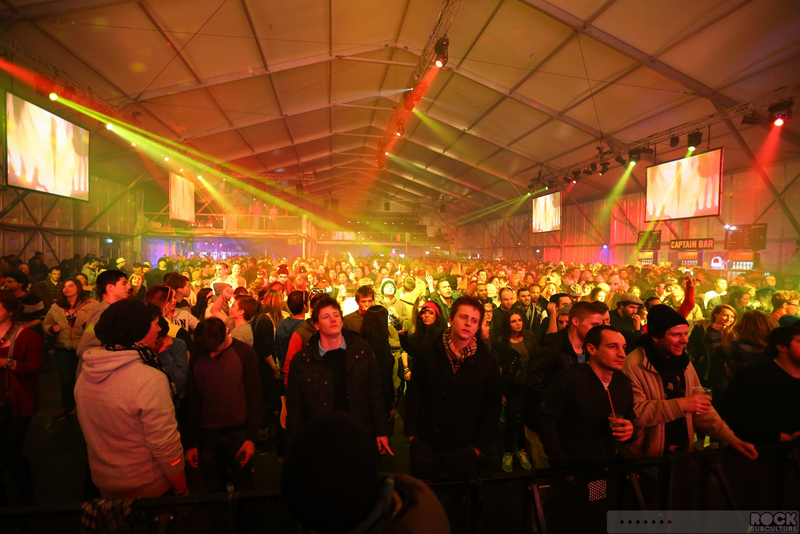 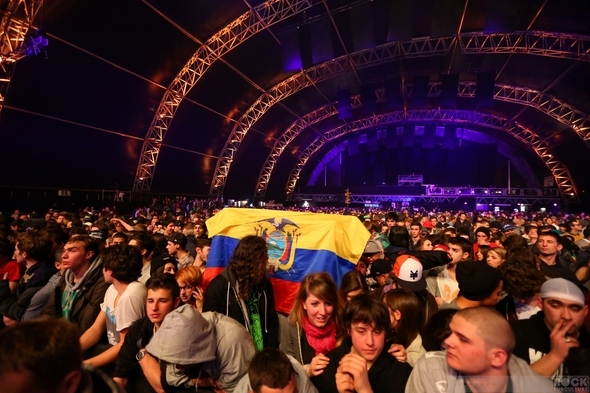 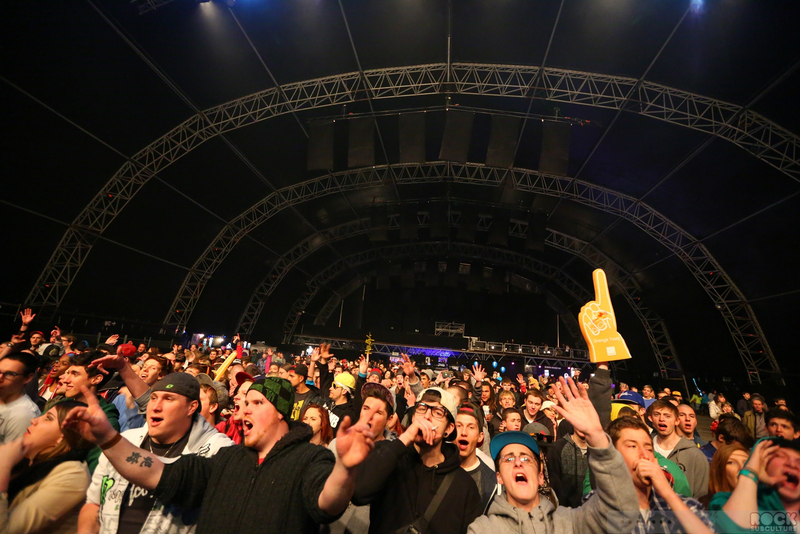 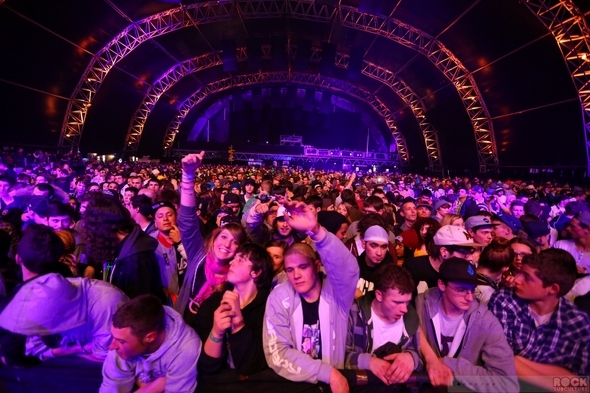 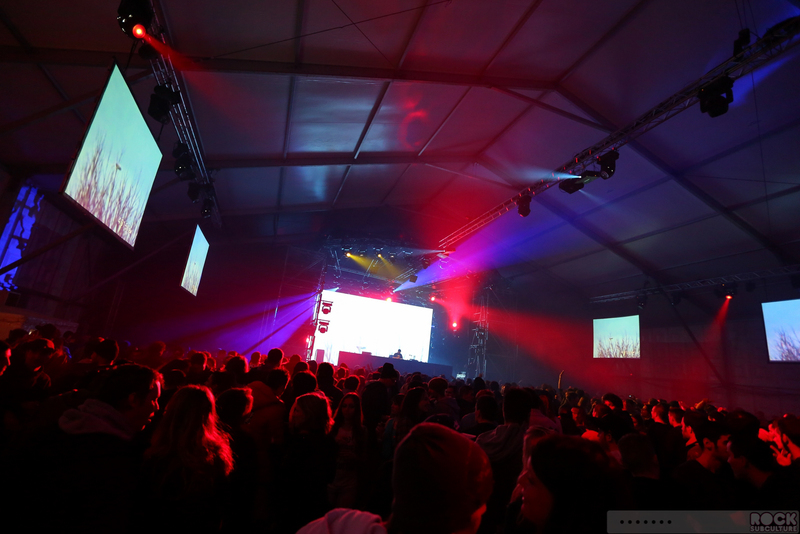 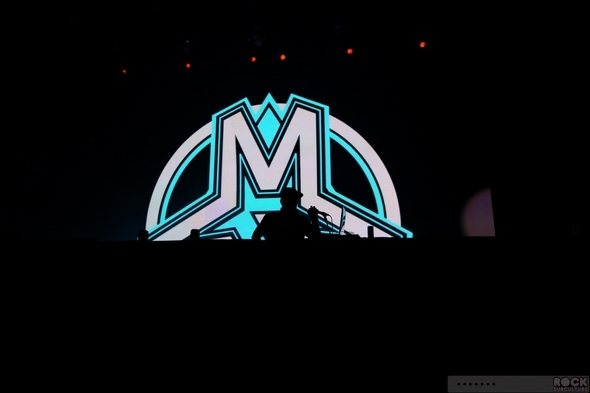 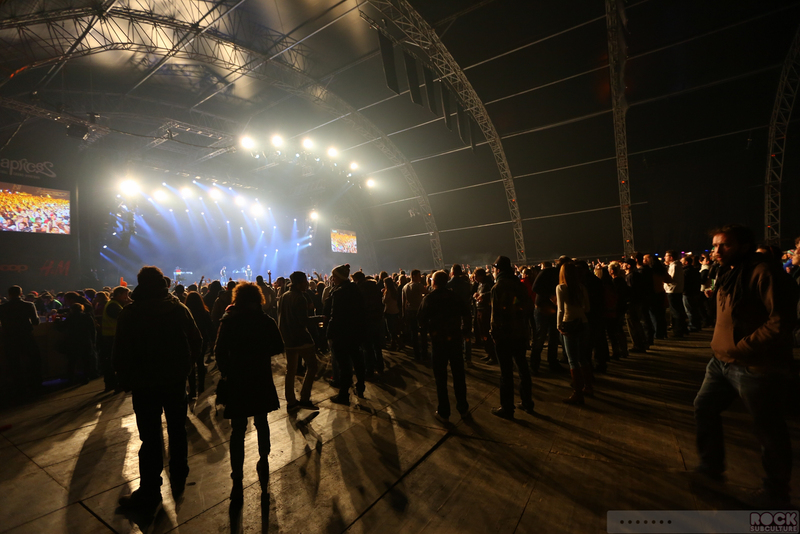 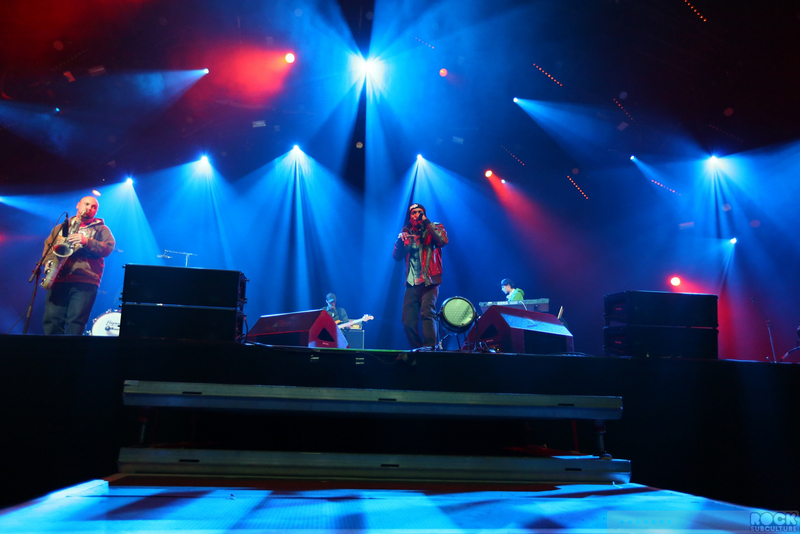 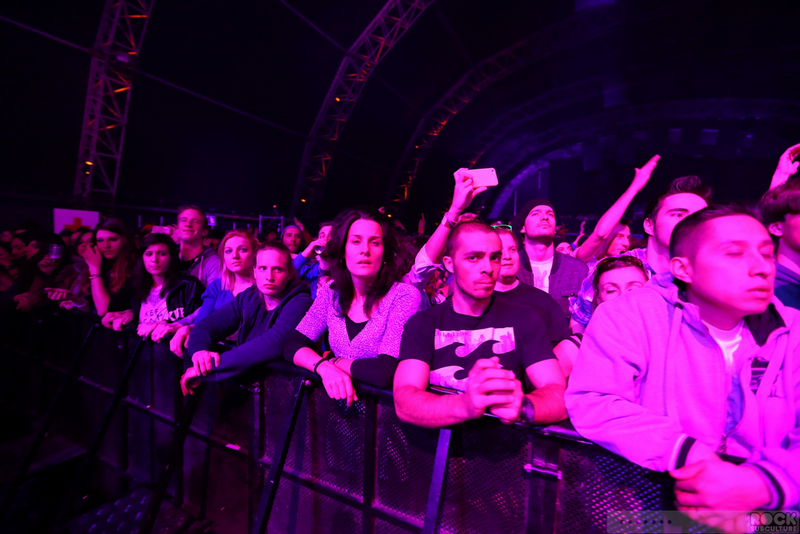 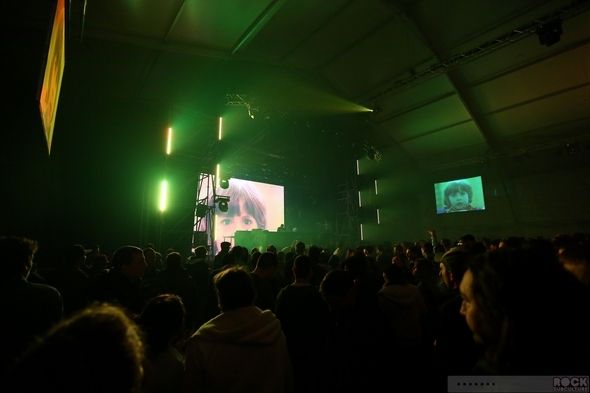 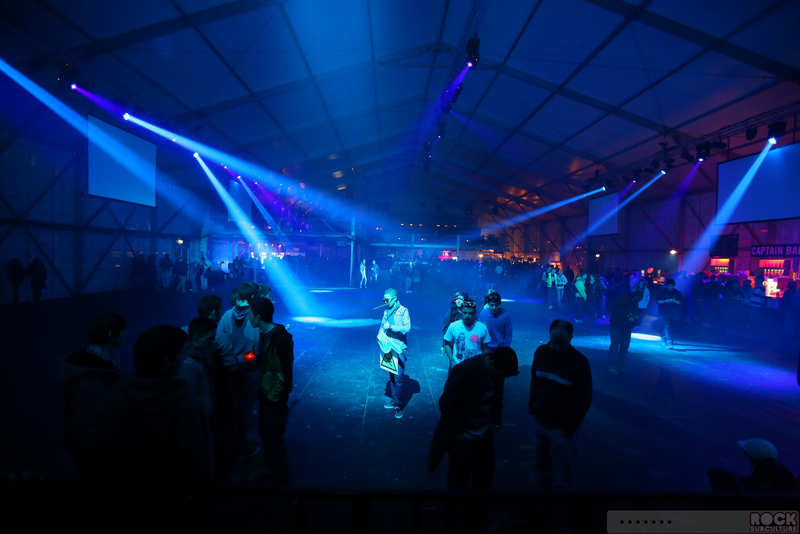 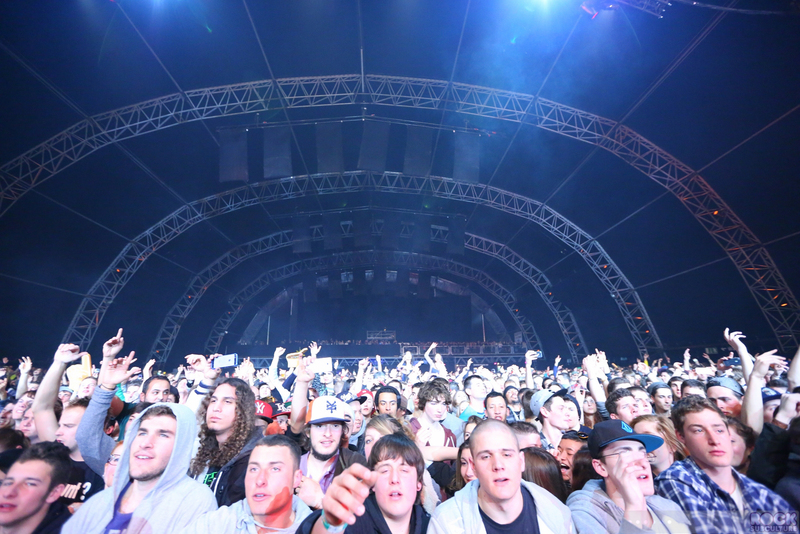 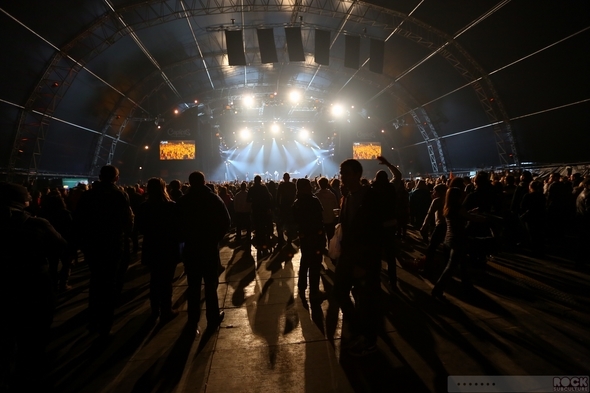 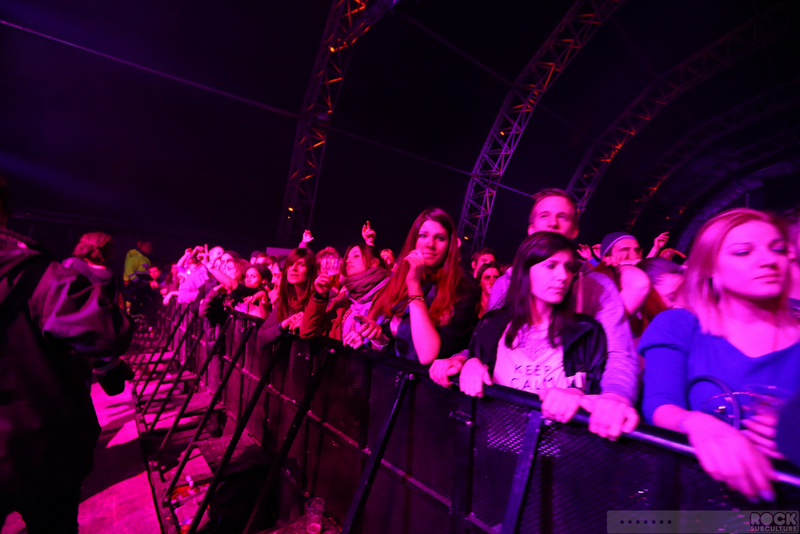 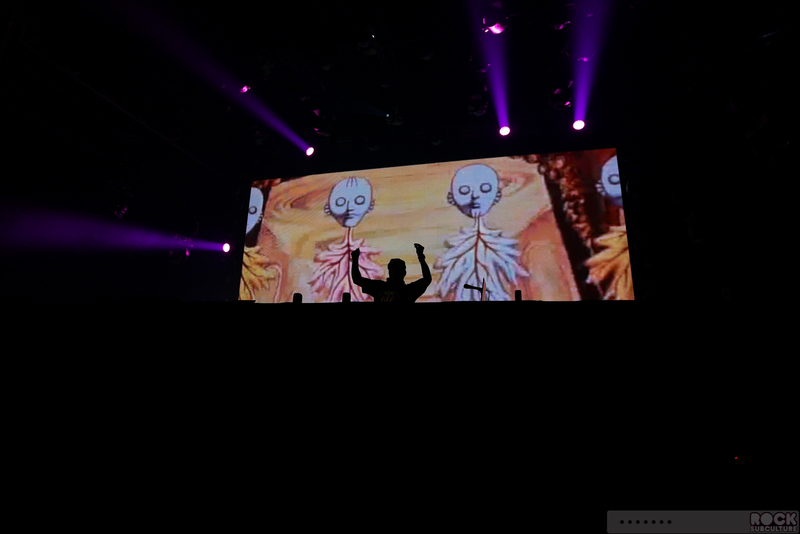 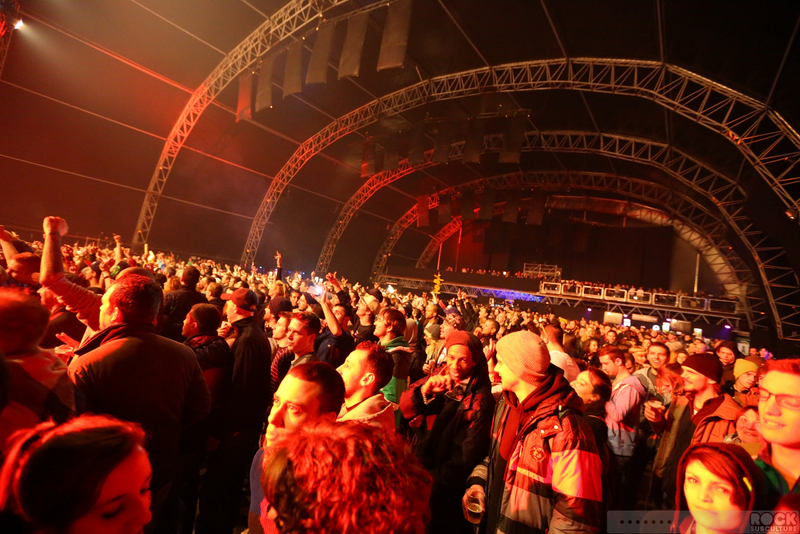 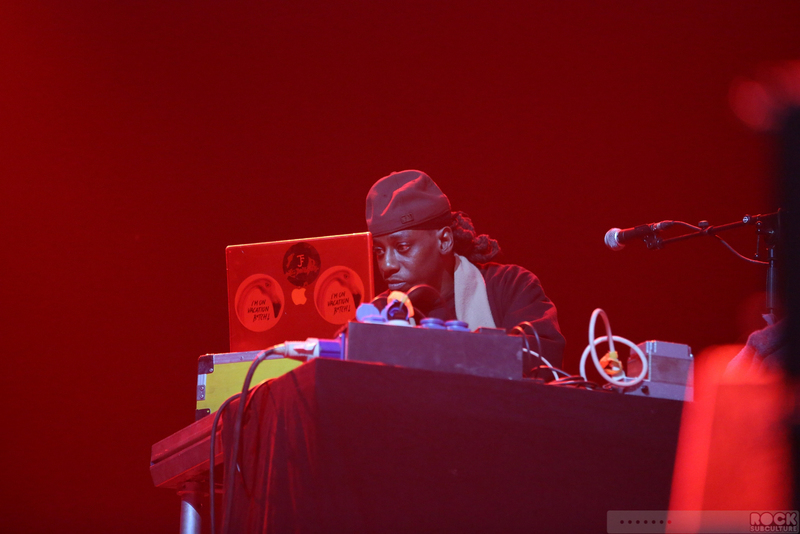 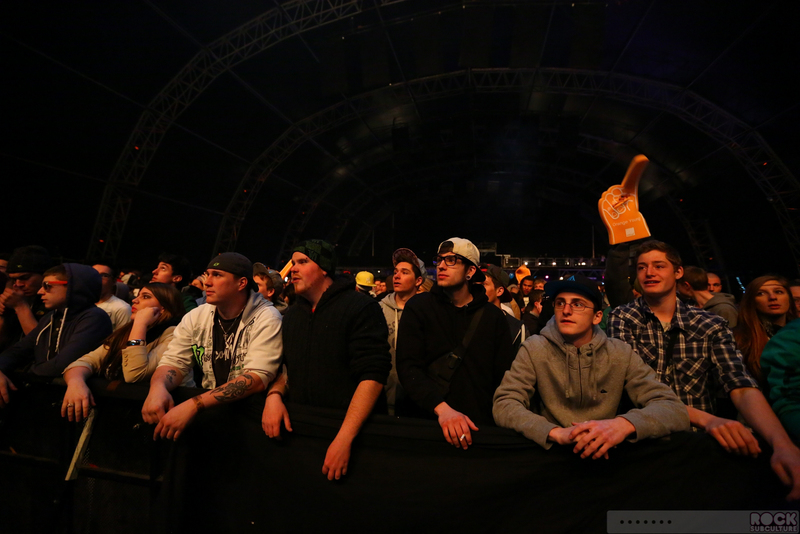 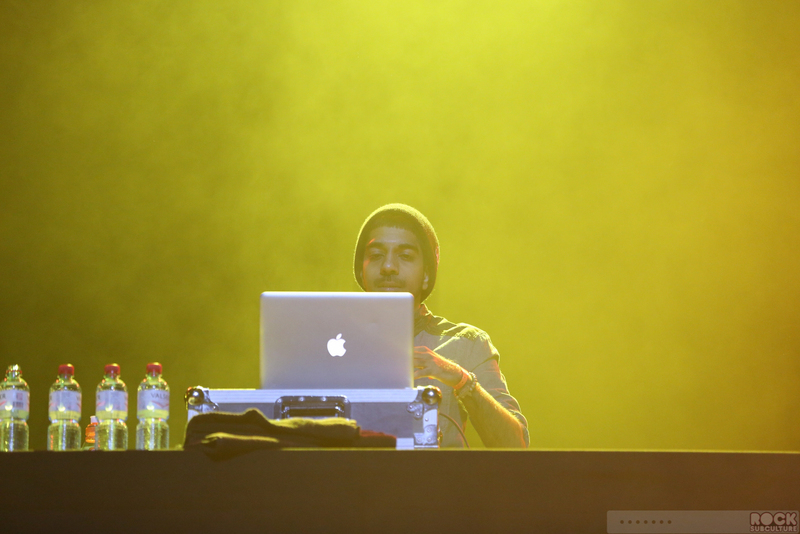 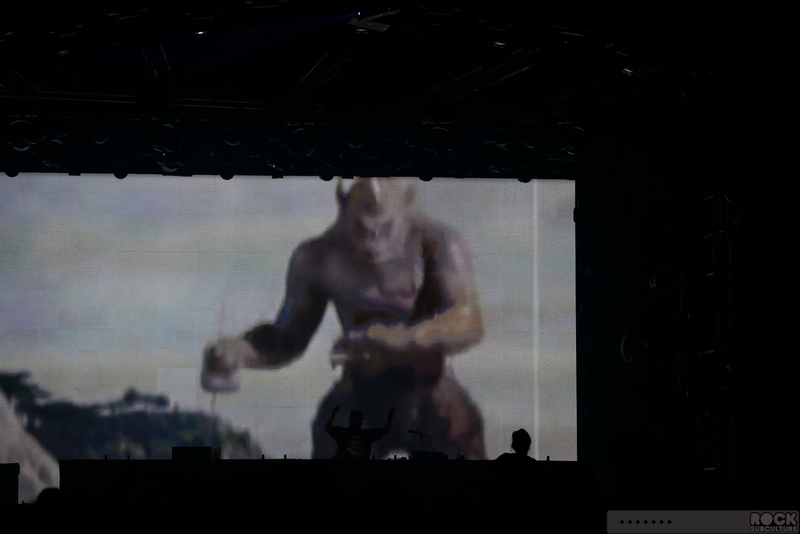 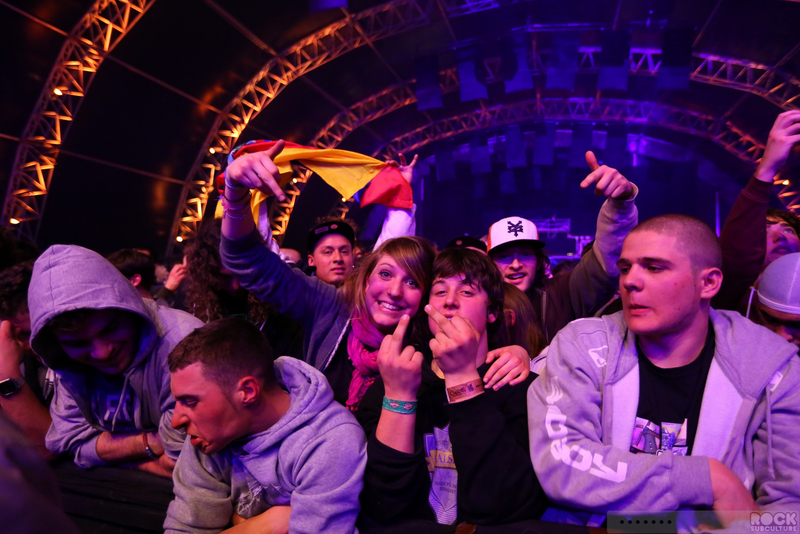 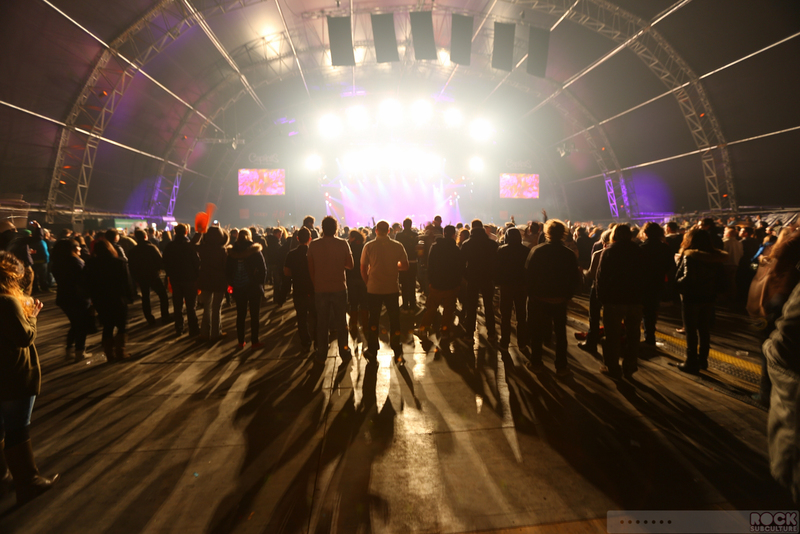 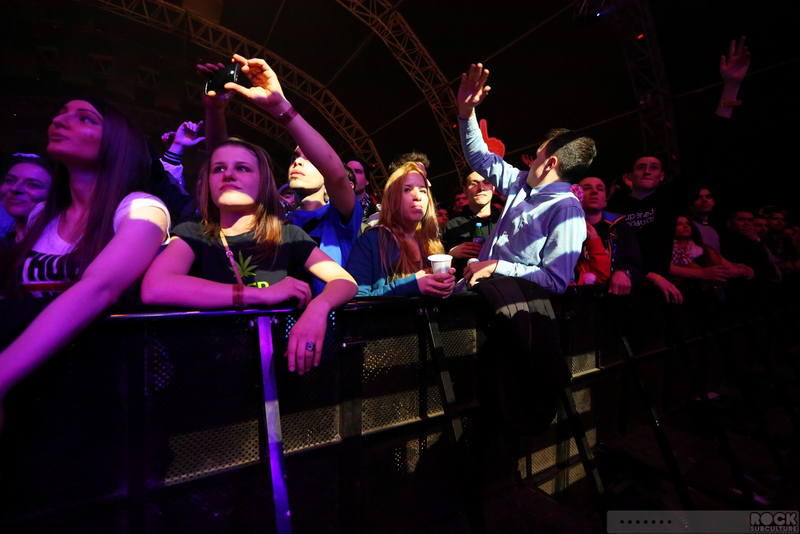 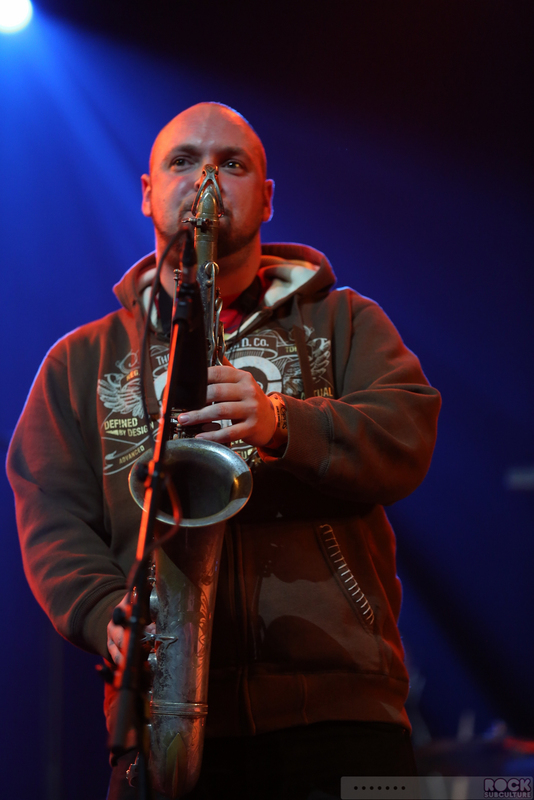 Day 9 of Caprices Festival in Crans-Montana, Switzerland… it was the final one for the incredible series of a wide-ranging line-up of artist from a variety of music genres that drew thousands upon thousands to the resort area in the Swiss Alps. 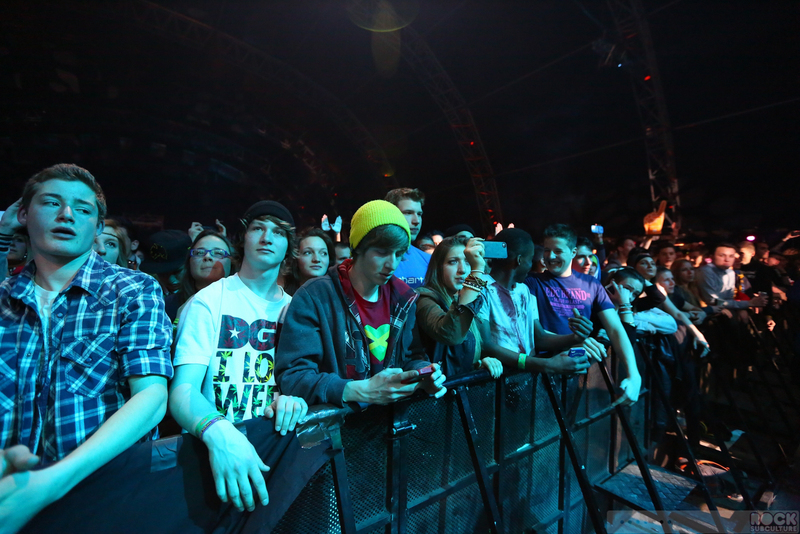 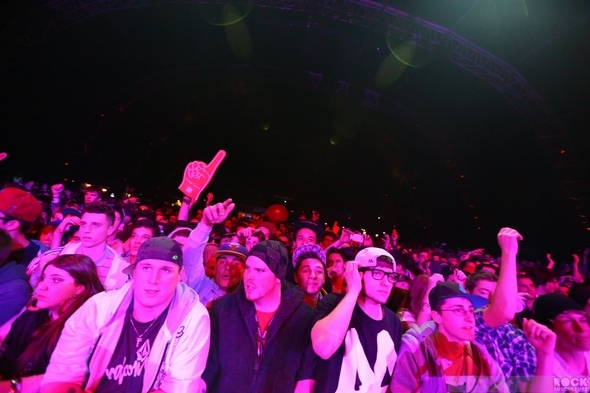 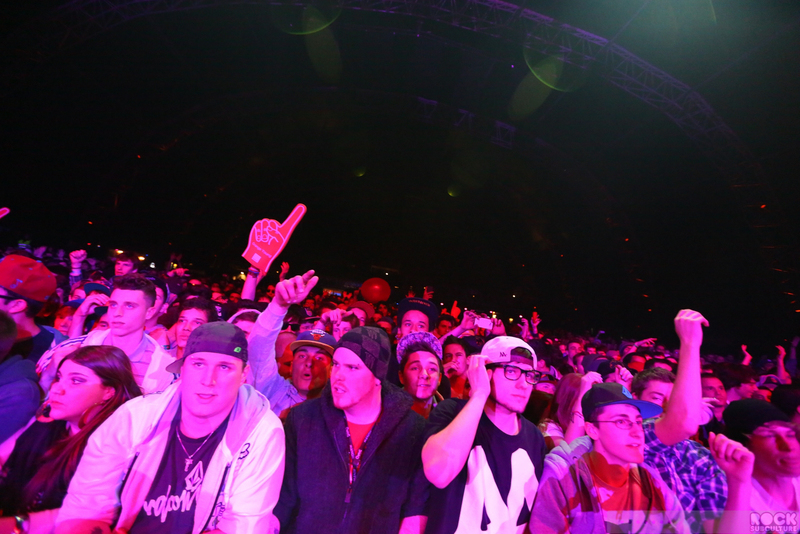 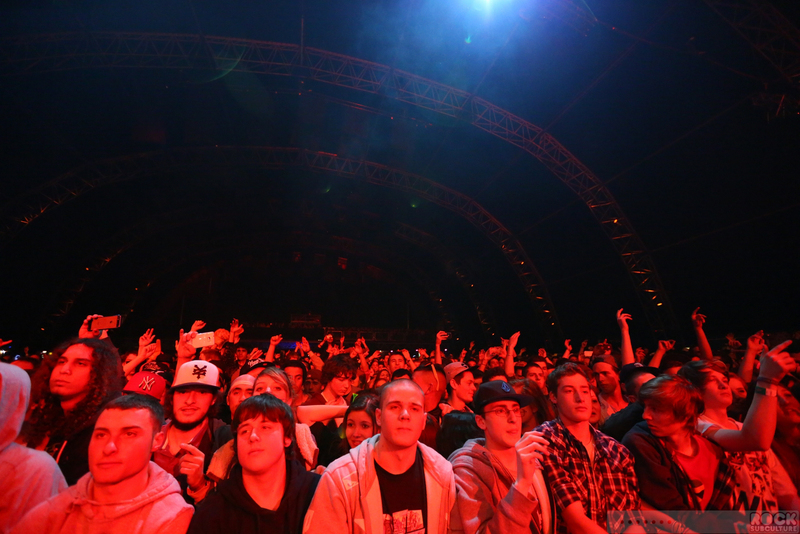 The themes for the final night, which drew one of the largest and most energetic crowds, was rap music and, well, a marijuana culture. 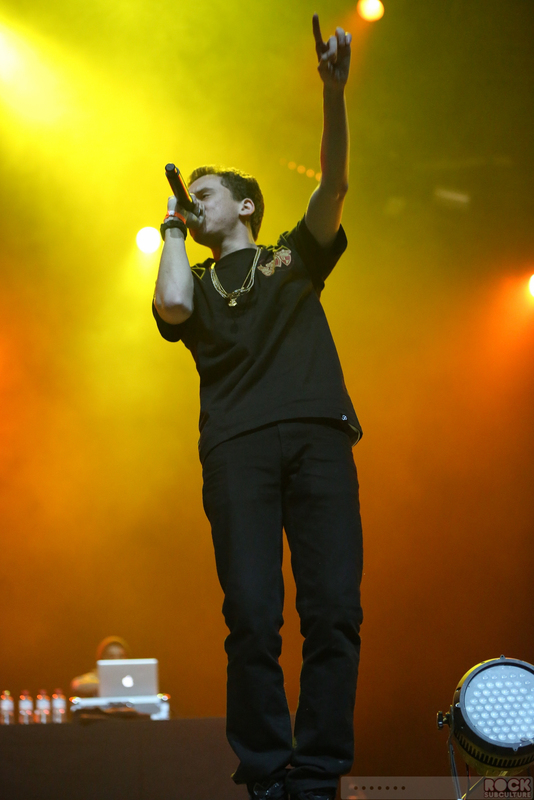 I would have to rate the night near the top as far as high performance and crowd enthusiasm go, regardless of how one might feel about either of those things, as the artists collectively put out more energy than probably any other night’s show – they were each really amazing in their own ways, and gave fans what they wanted as well as probably cultivated some new ones for themselves. 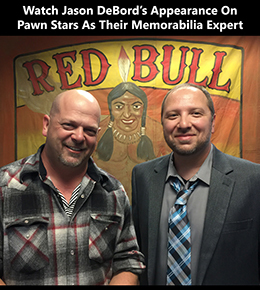 Really impressive stuff. 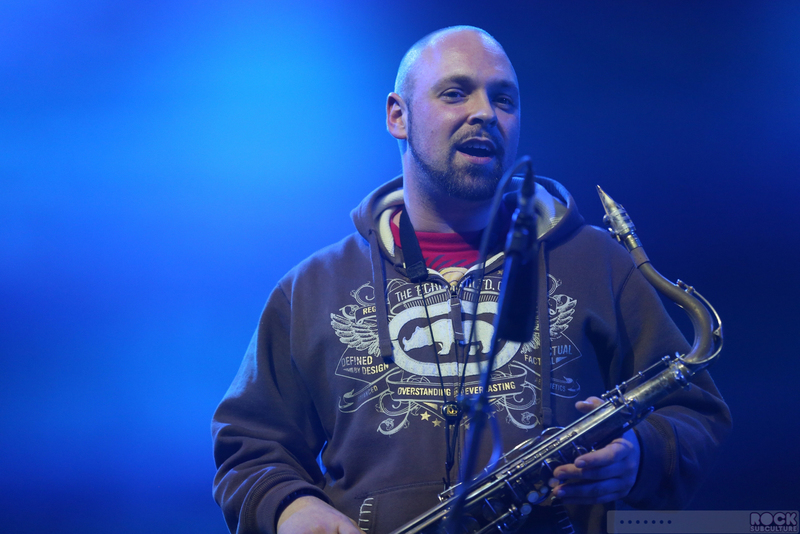 If you want a general overview of this special festival, check out my ongoing coverage as well as the official site as www.Caprices.ch. 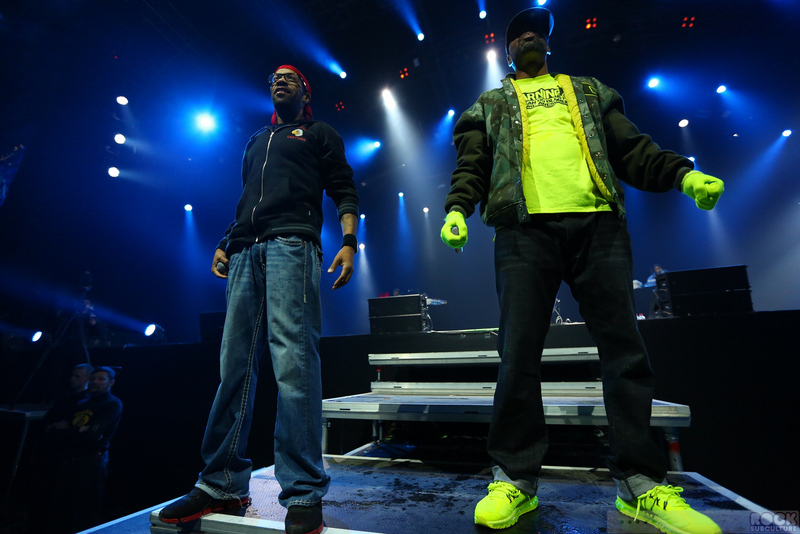 Artists listed in order of appearance (first to last). Rootwords was one of the finalists for the Orange New Talent Contest, and honestly, you wouldn’t know it from his performance… you would think that he was there just as any other artist was there… he was really amazing, and I came away extremely impressed with his music and stage performance. 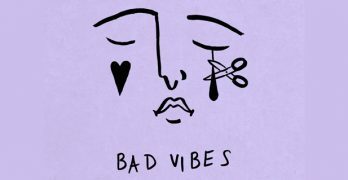 A real international artist, he was born in the U.S., grew up in Switzerland, and spent time in London and Australia during school. 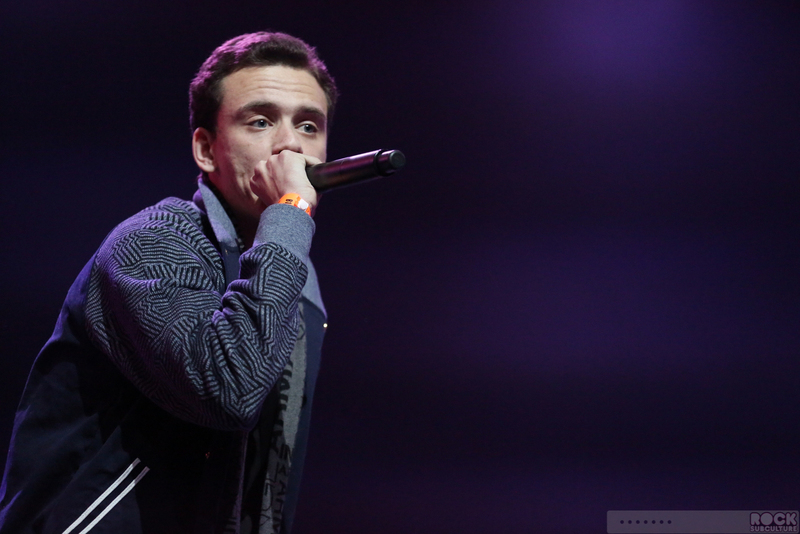 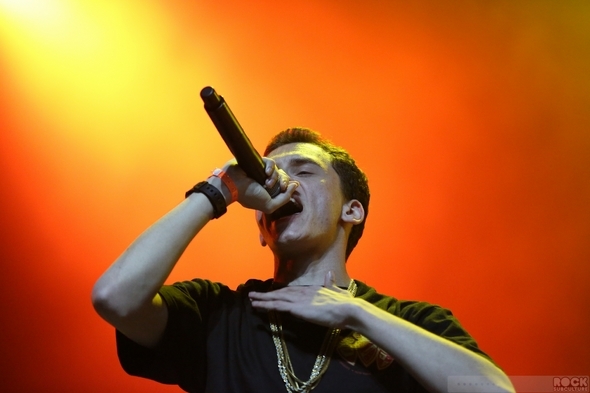 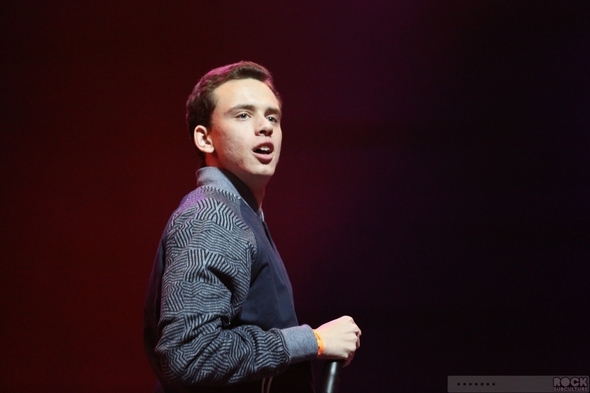 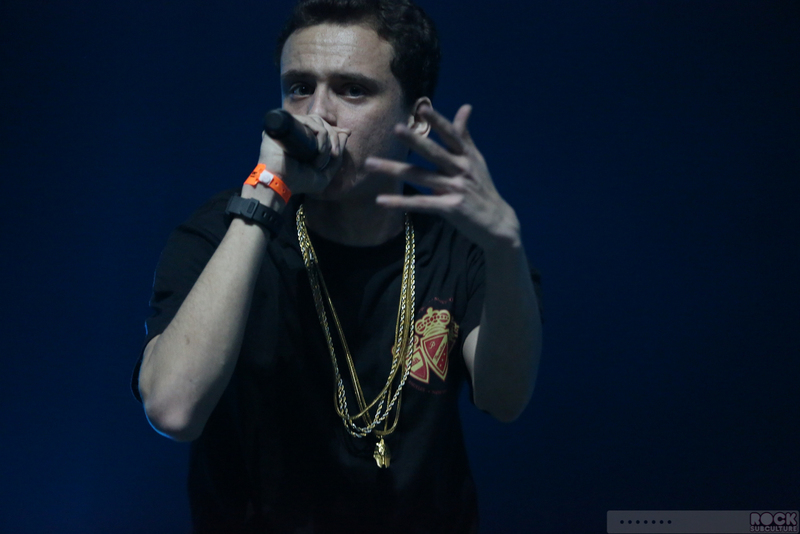 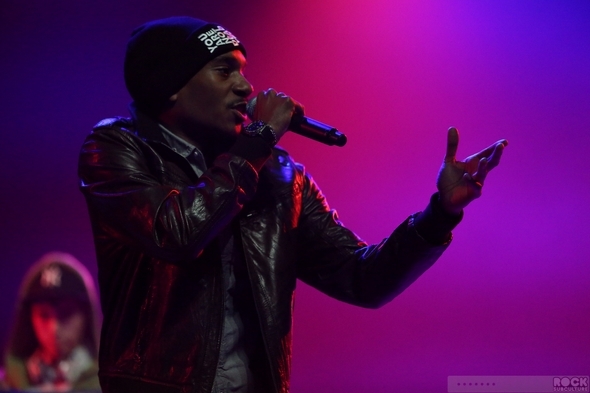 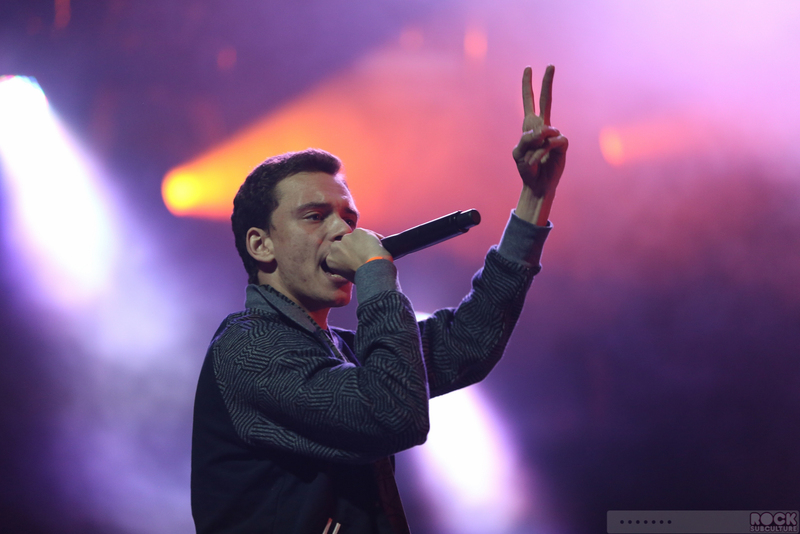 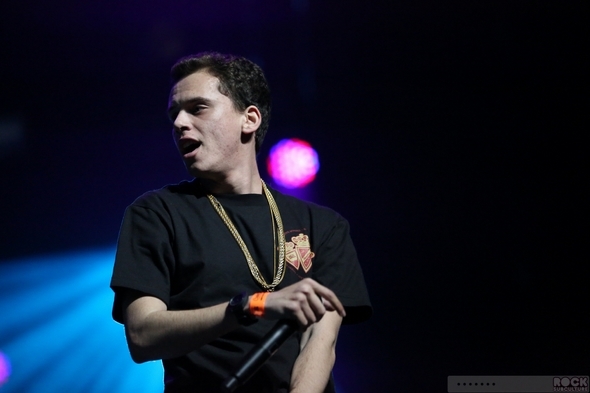 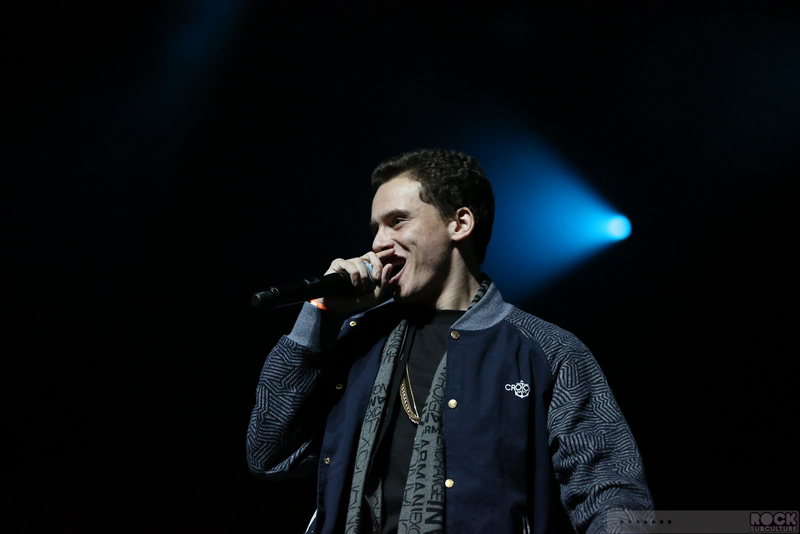 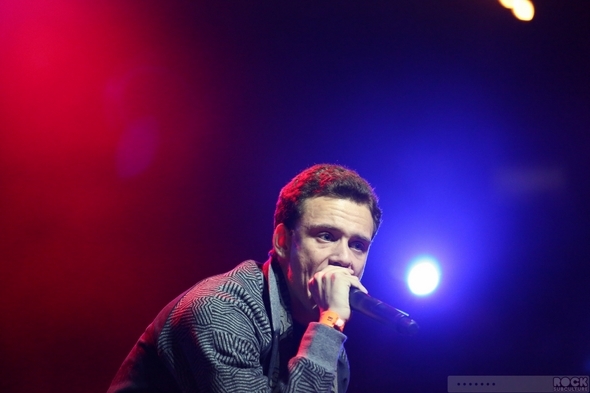 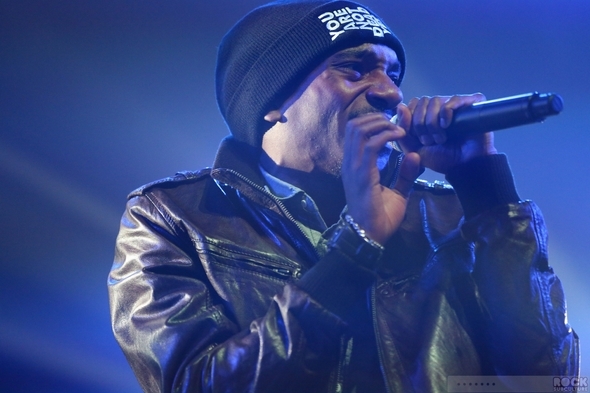 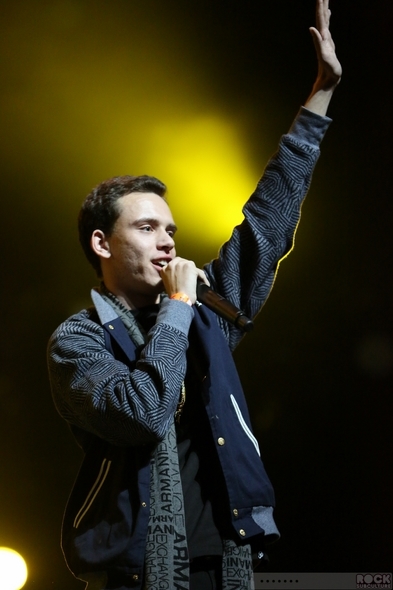 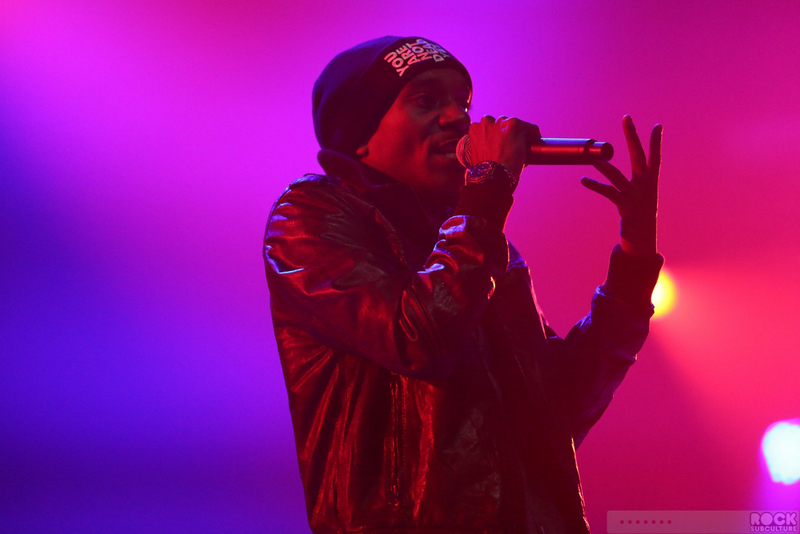 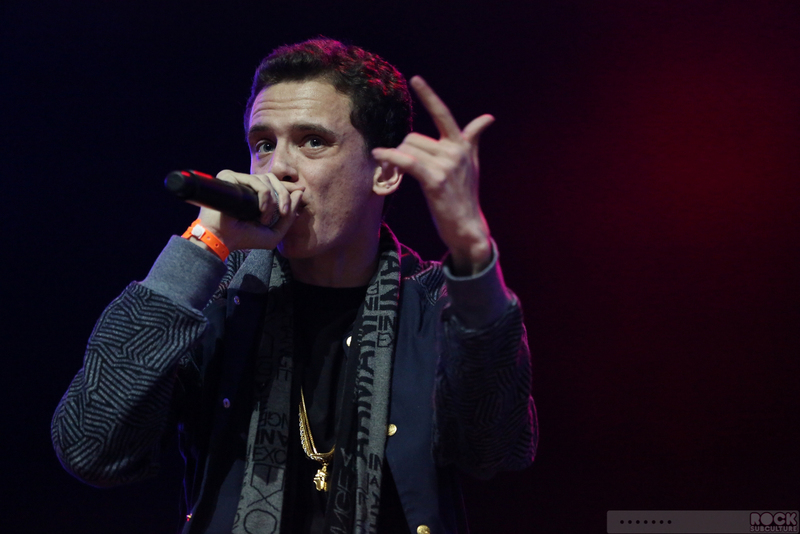 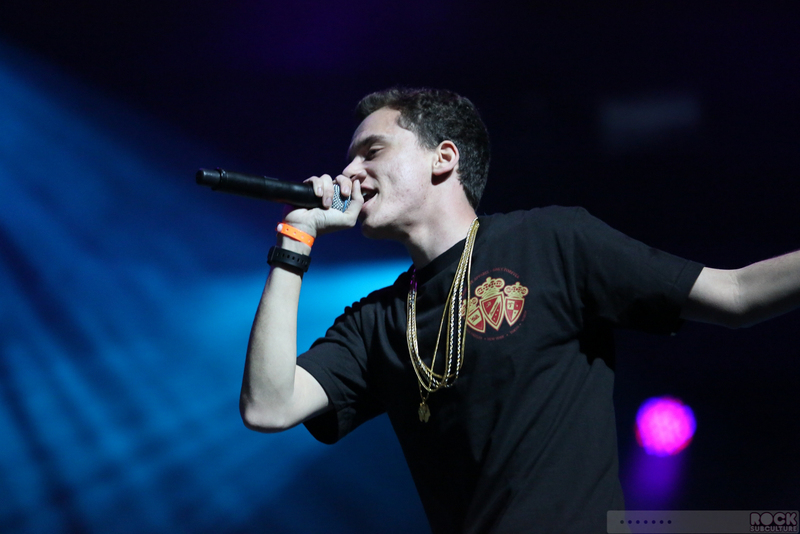 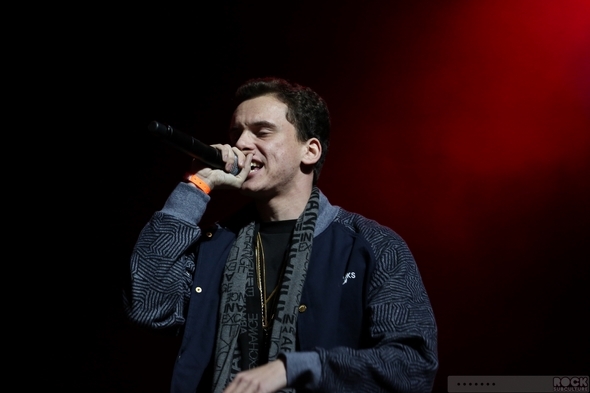 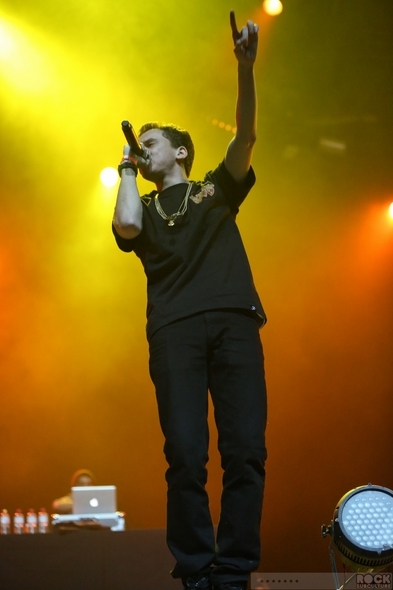 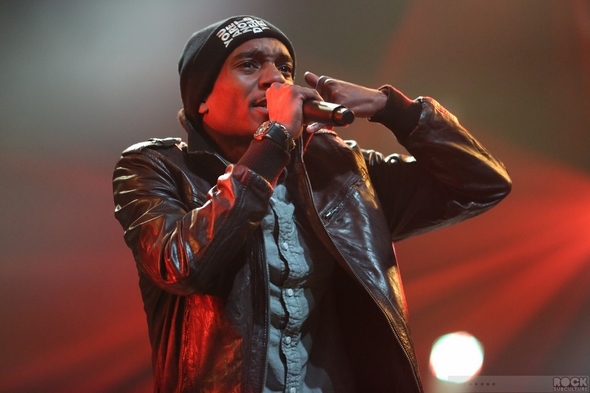 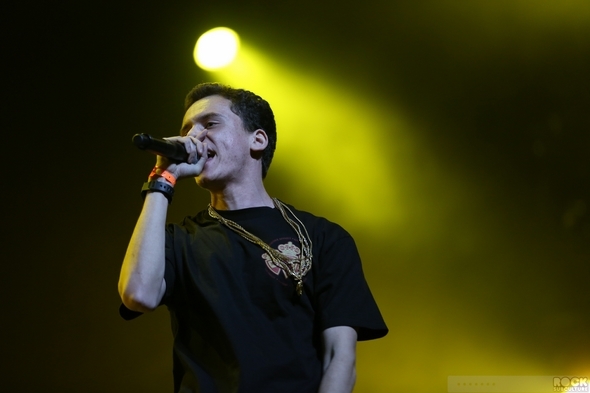 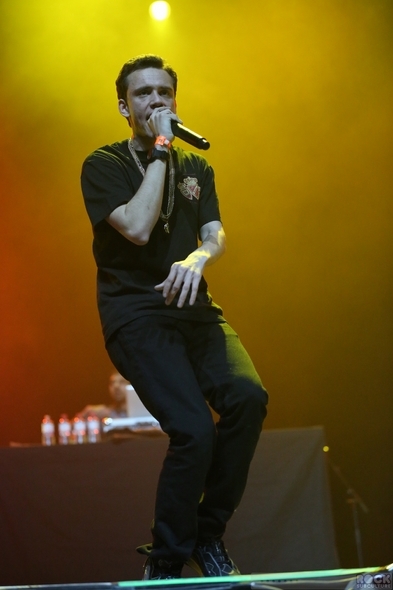 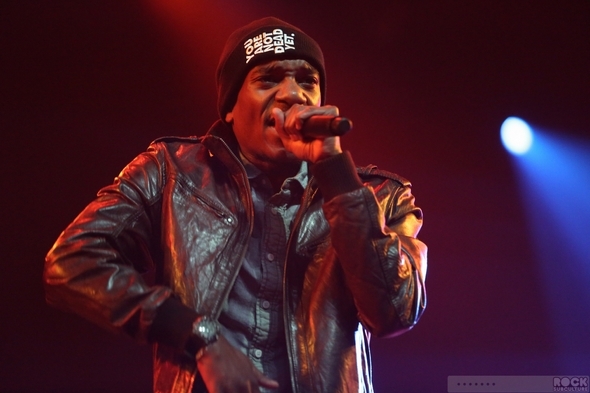 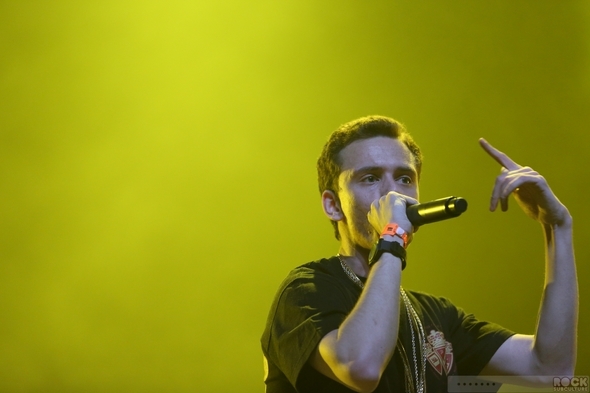 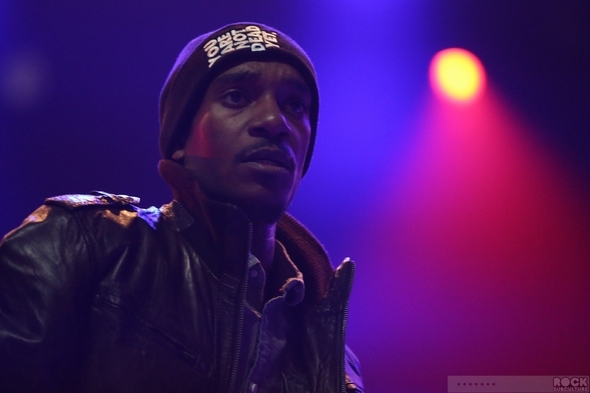 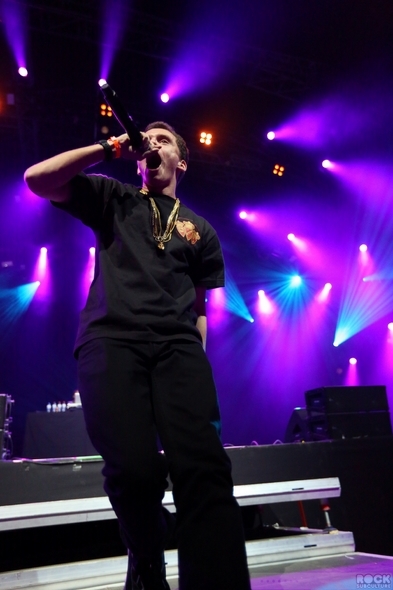 A funny thing about the performance… while he rapped with an American accent, when he spoke between songs, he sounded very natively French, so he really draws from his real life experiences across countries and cultures. 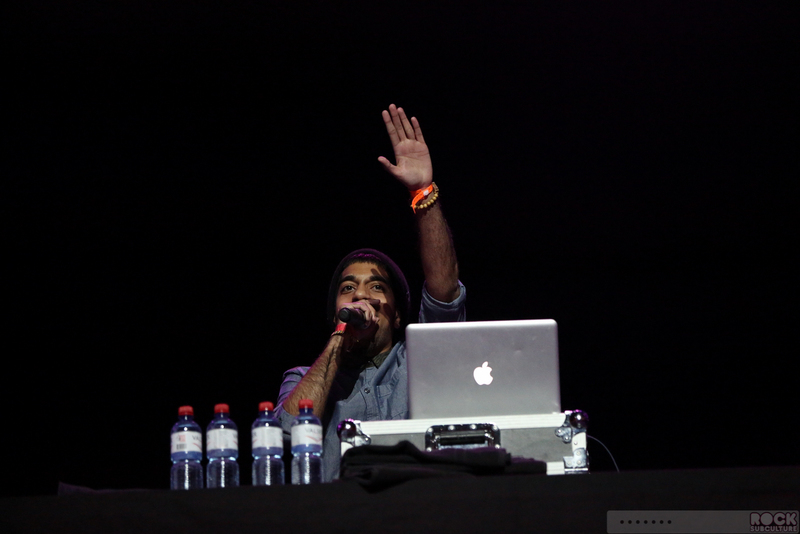 You can sample his work on his official site at www.rootwords.ch, though I would recommend checking him out live, as he has tremendous energy and his work comes alive event more on stage. 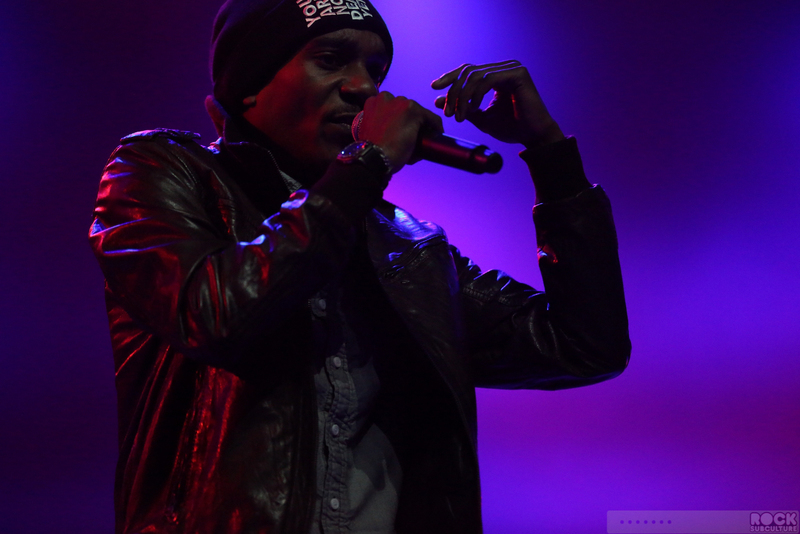 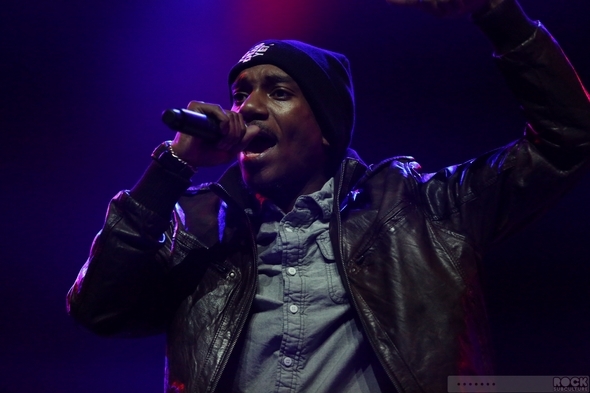 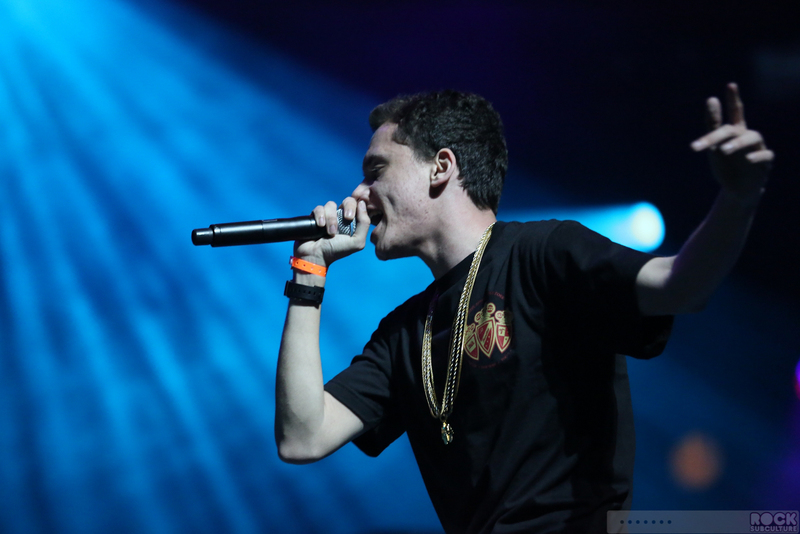 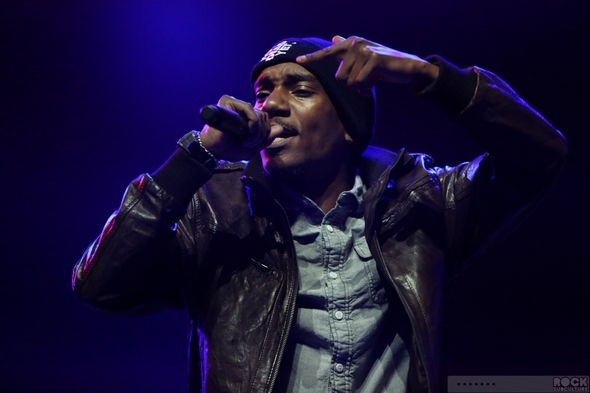 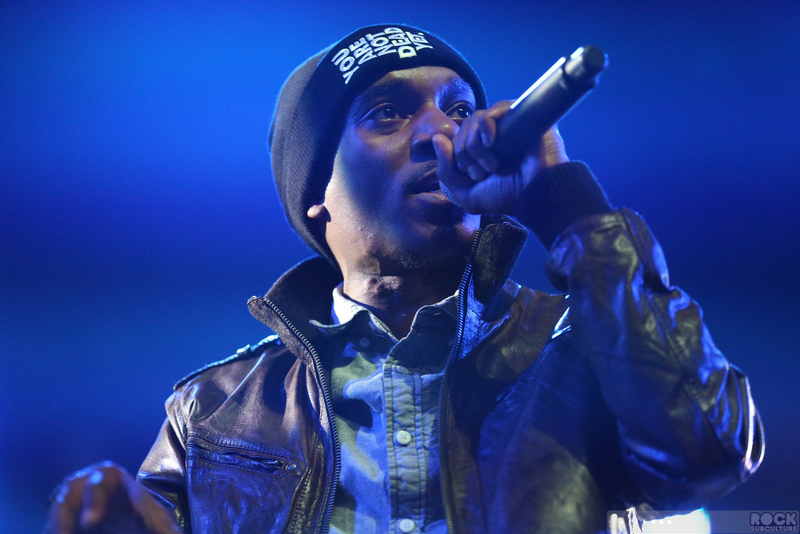 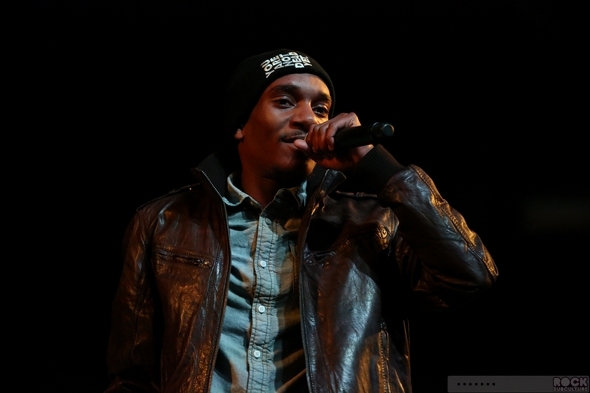 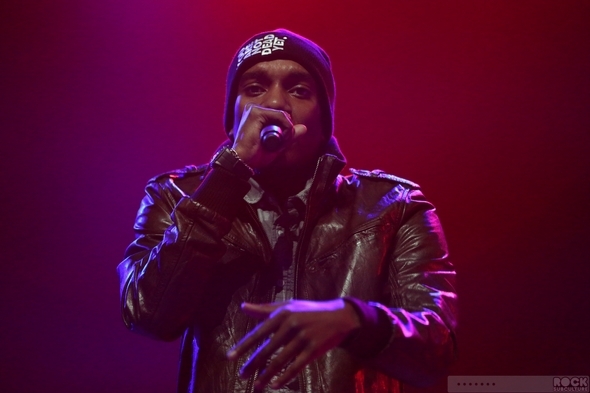 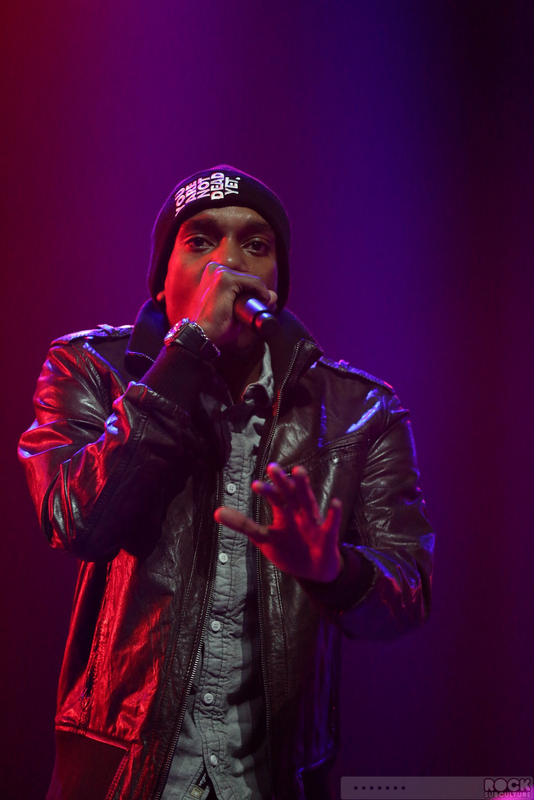 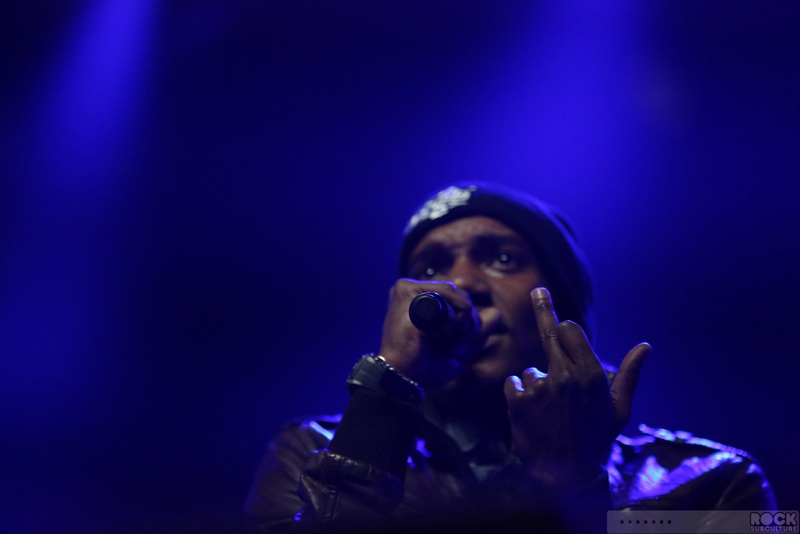 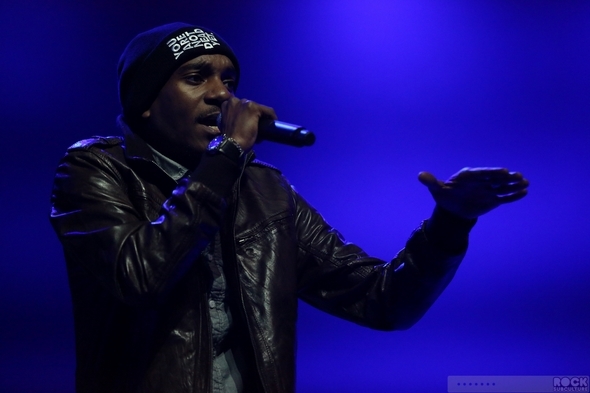 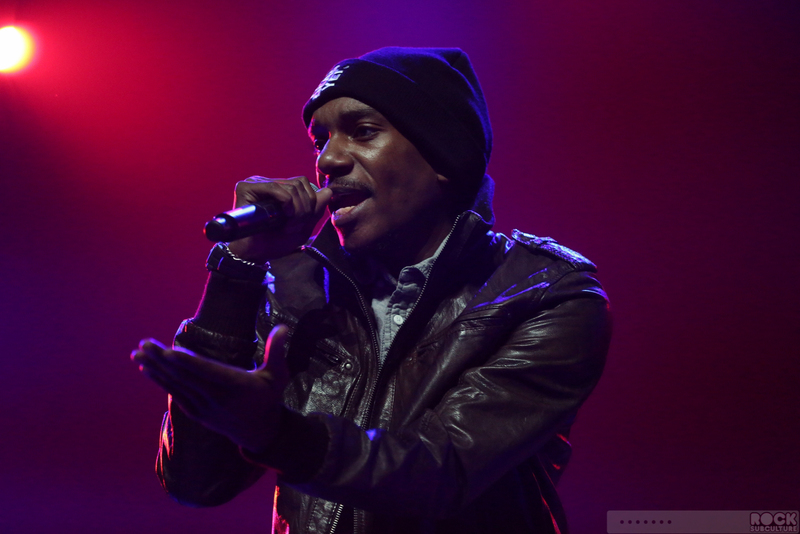 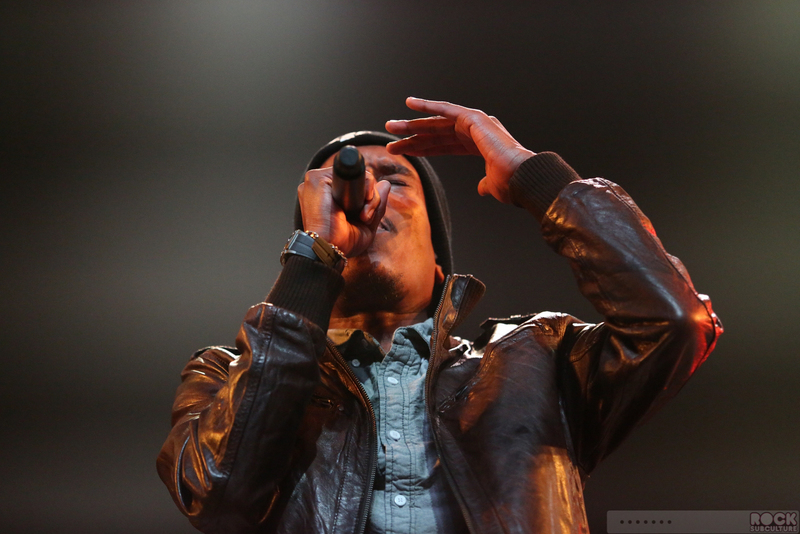 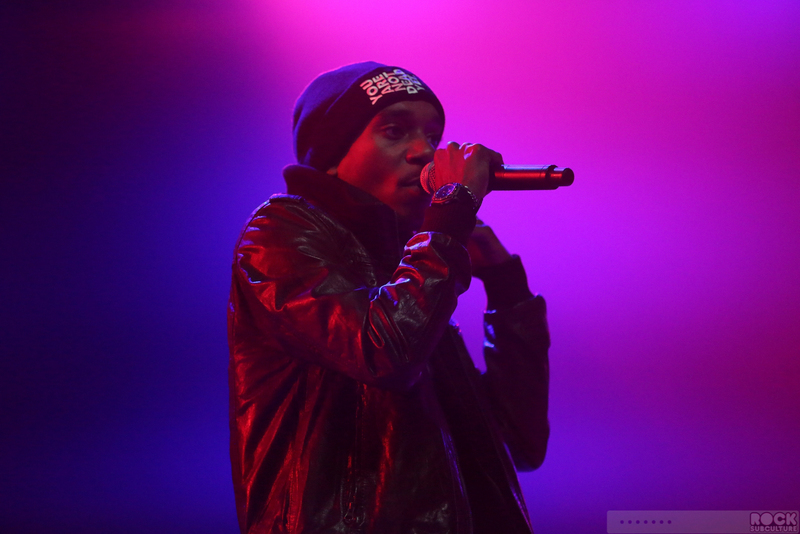 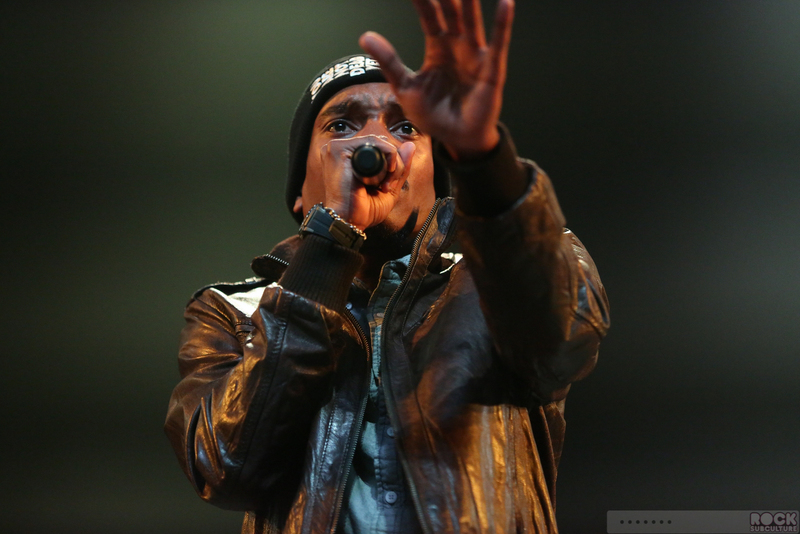 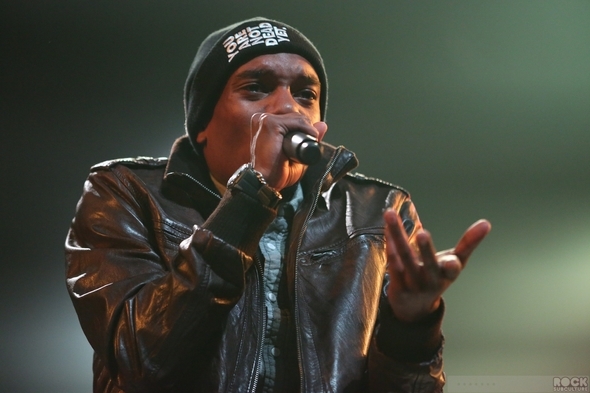 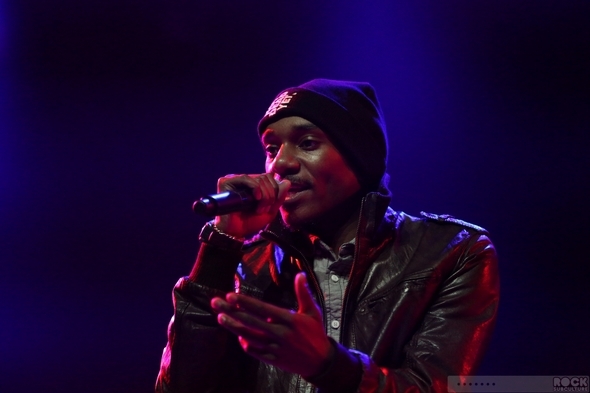 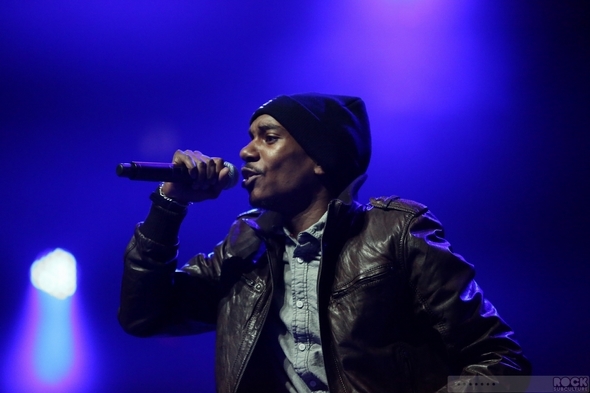 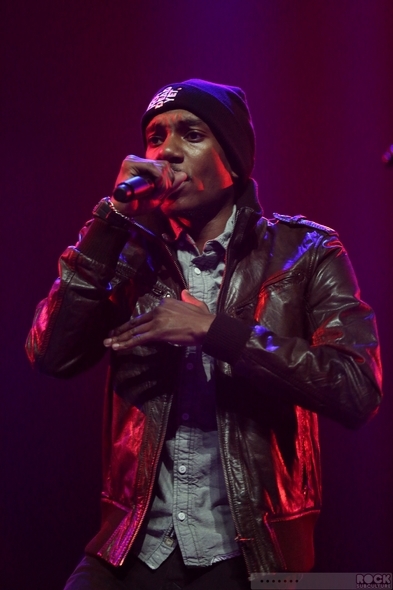 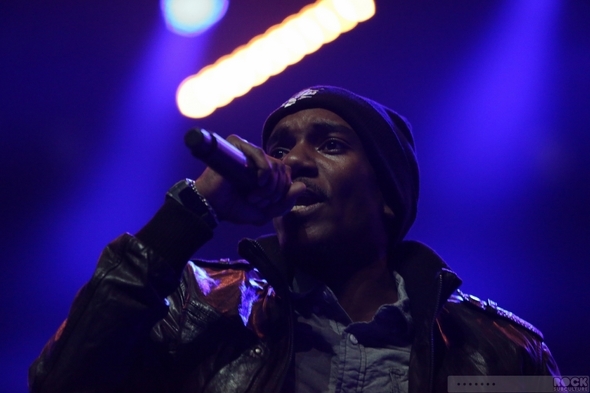 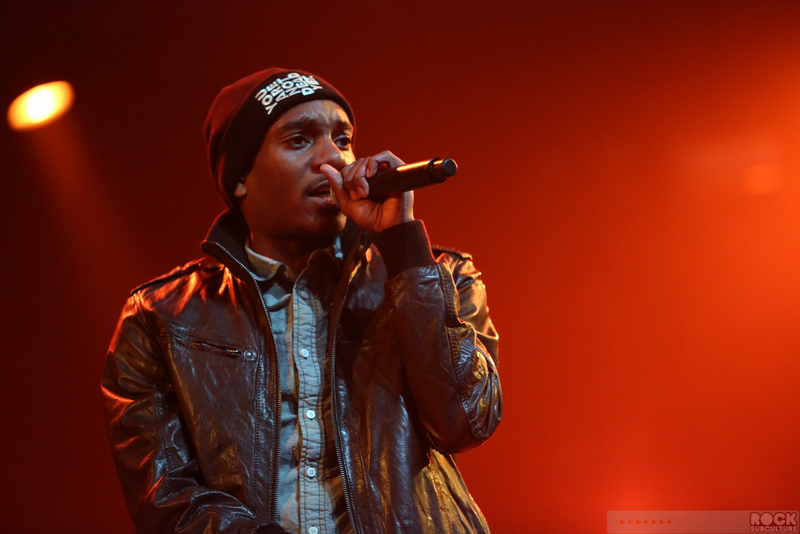 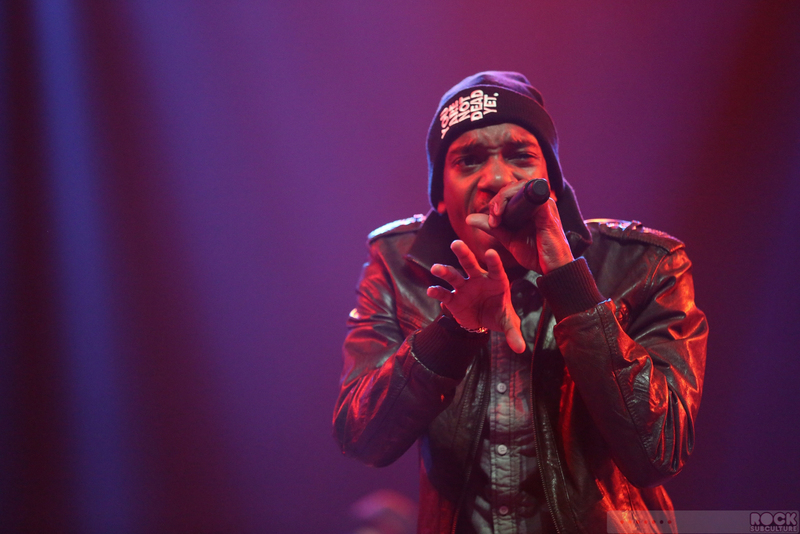 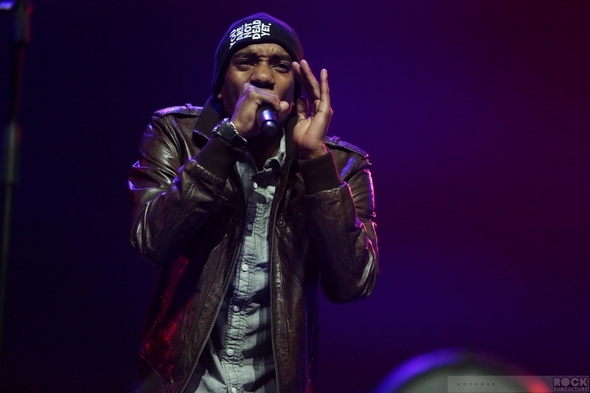 This 22-year old rapper/hip hop artist from Maryland wins the award for the festival for fasting moving subject to photograph… the guy was all over the stage as a consistently speedy pace, and this matched the delivery of his rhymes as well. 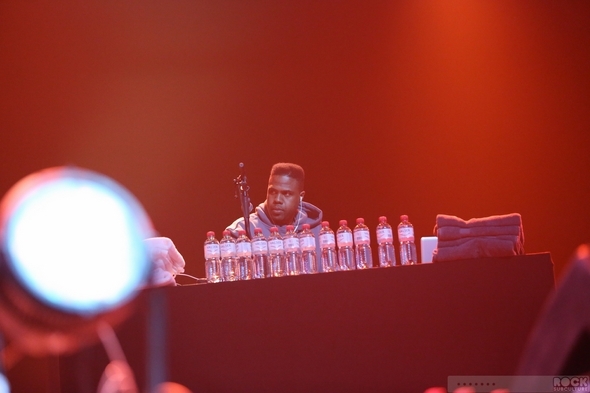 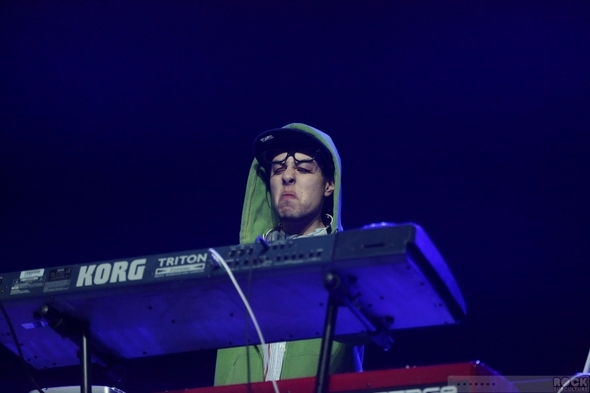 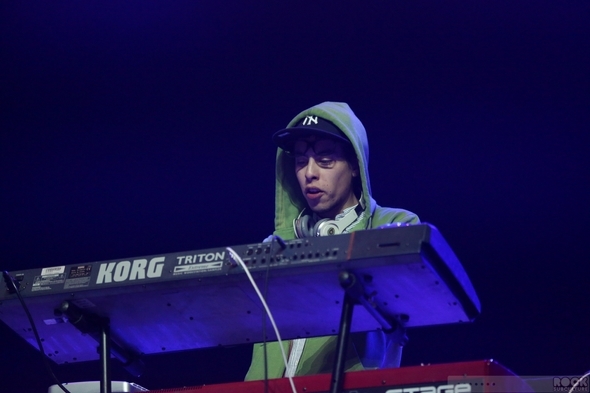 If I were an artist in this genre, this is the guy I would want to have opening for me, as he had so much pure energy that he really got the audience going for the rest of the night. 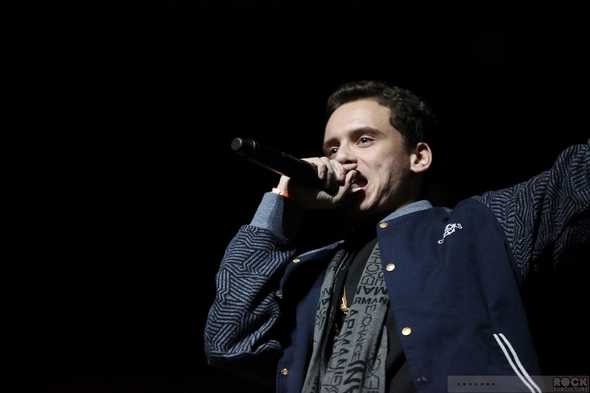 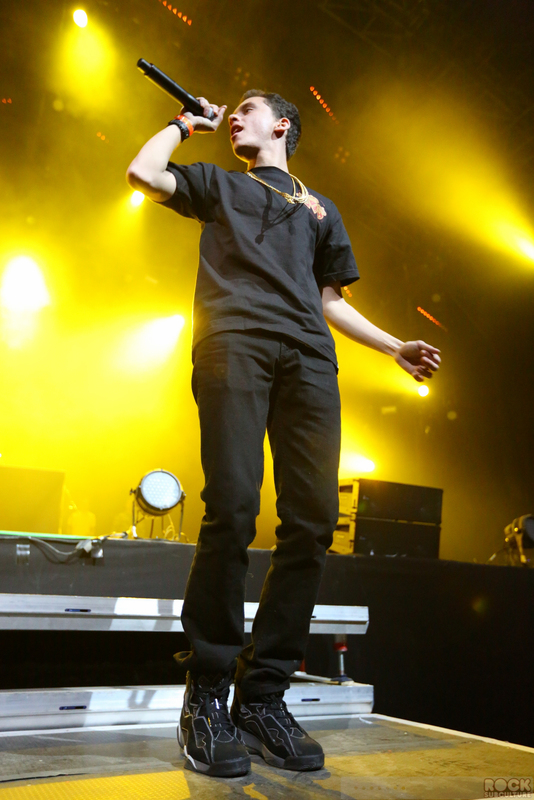 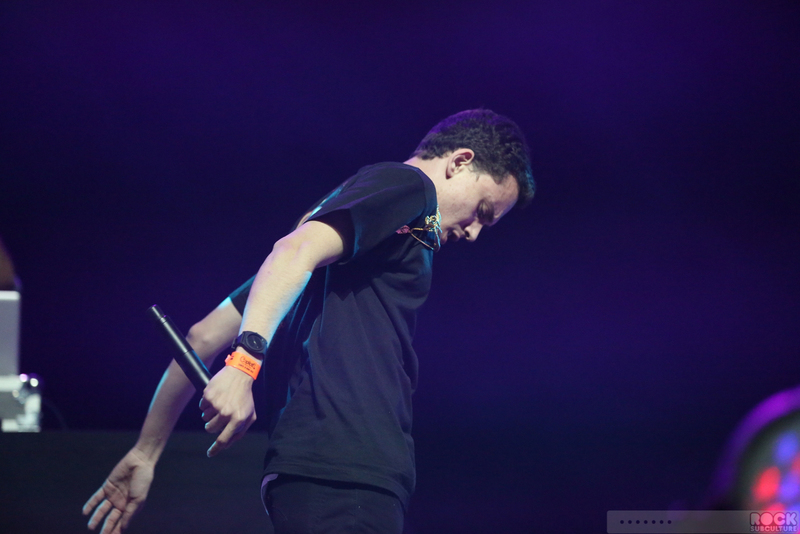 I get the sense that he was born to perform, and he did not disappoint. 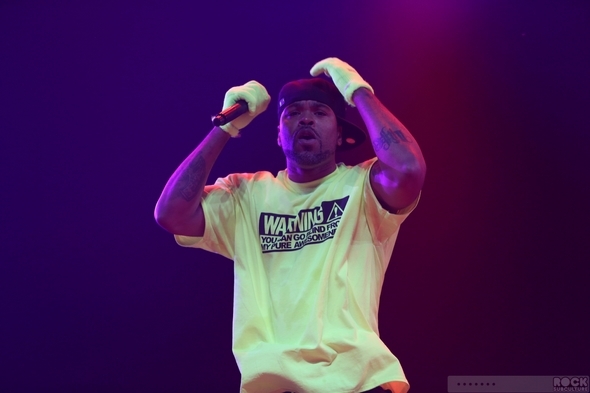 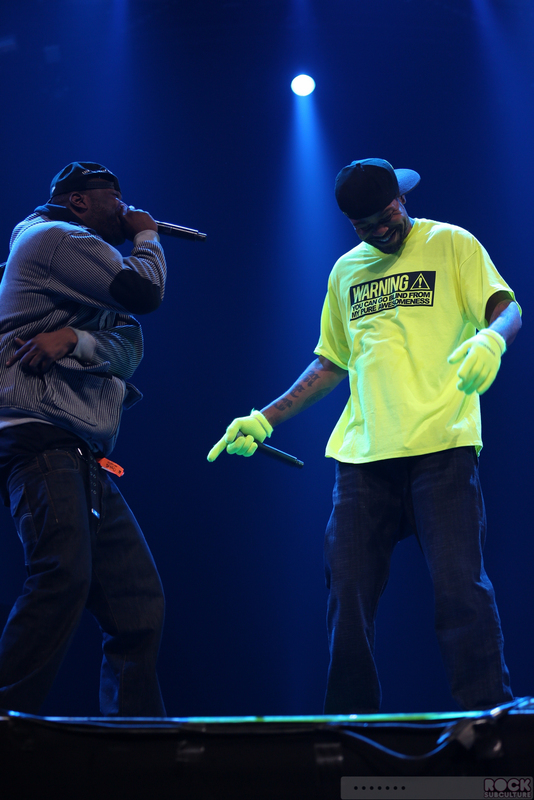 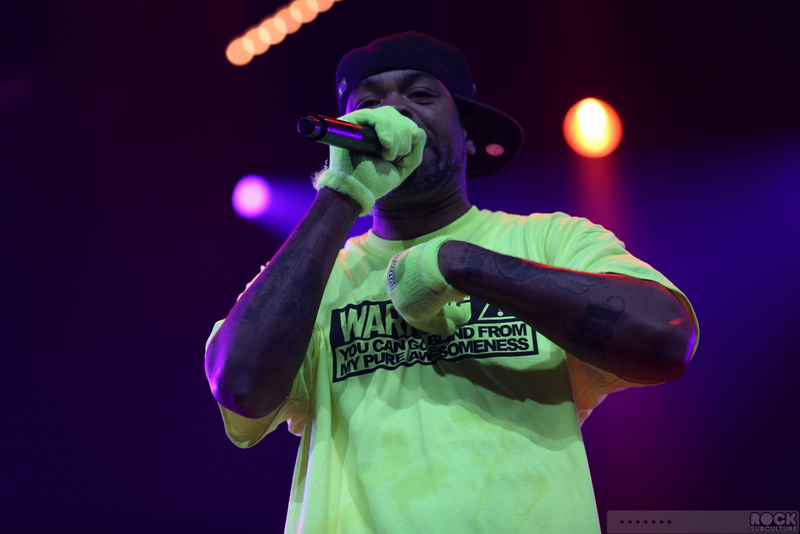 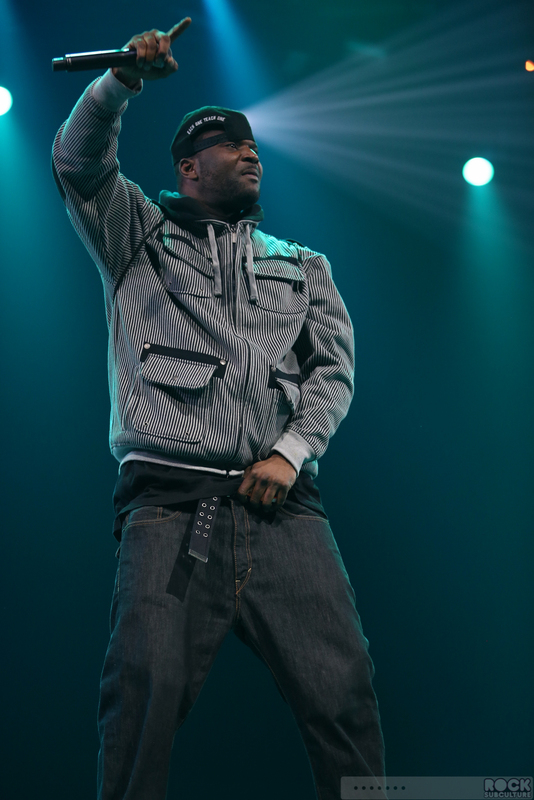 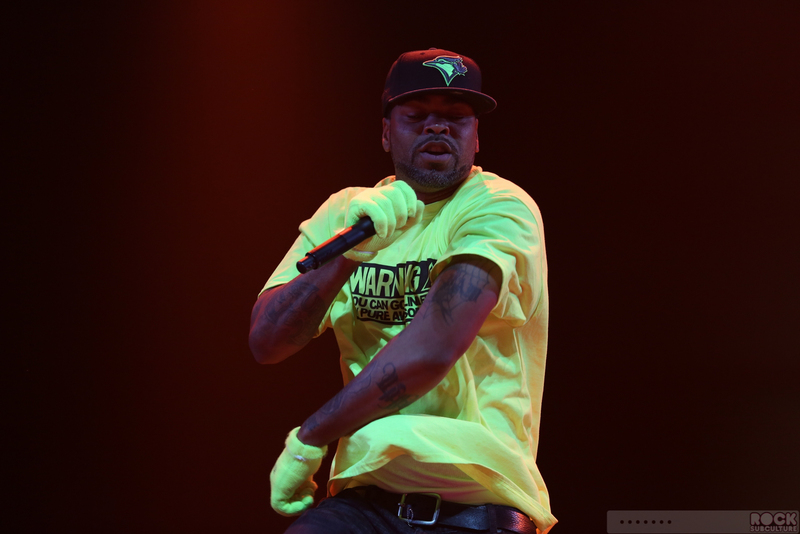 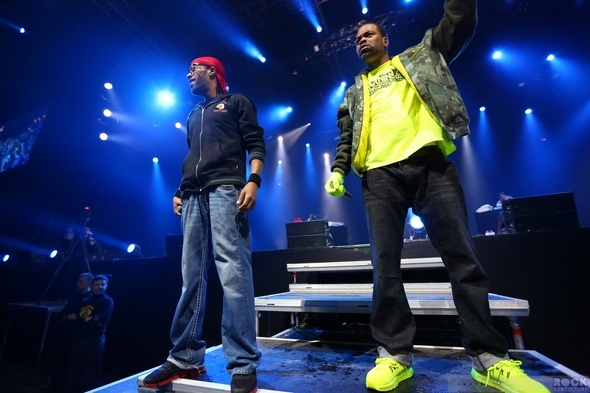 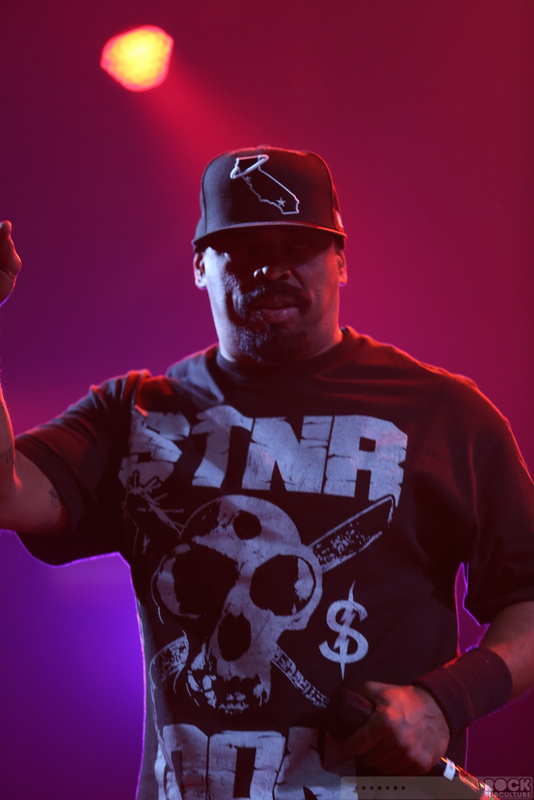 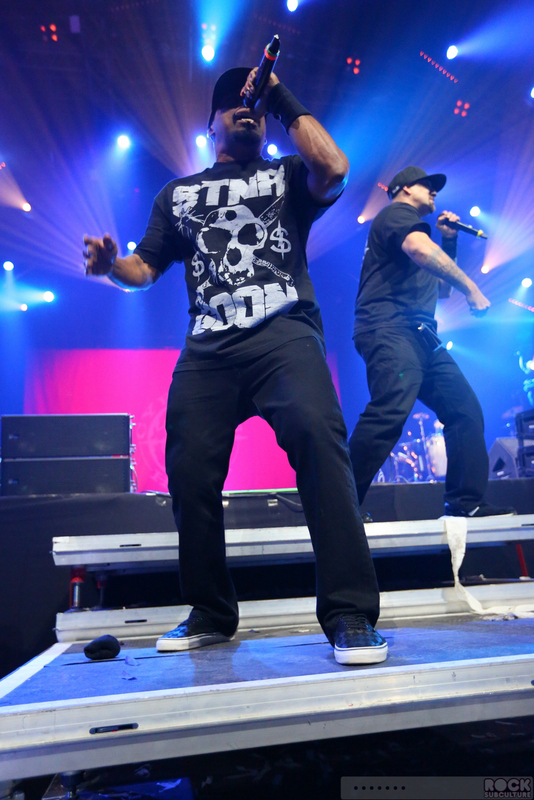 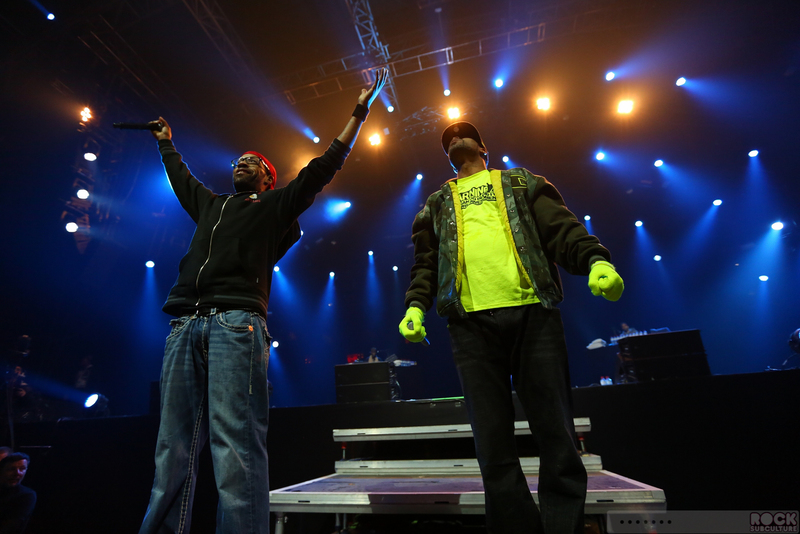 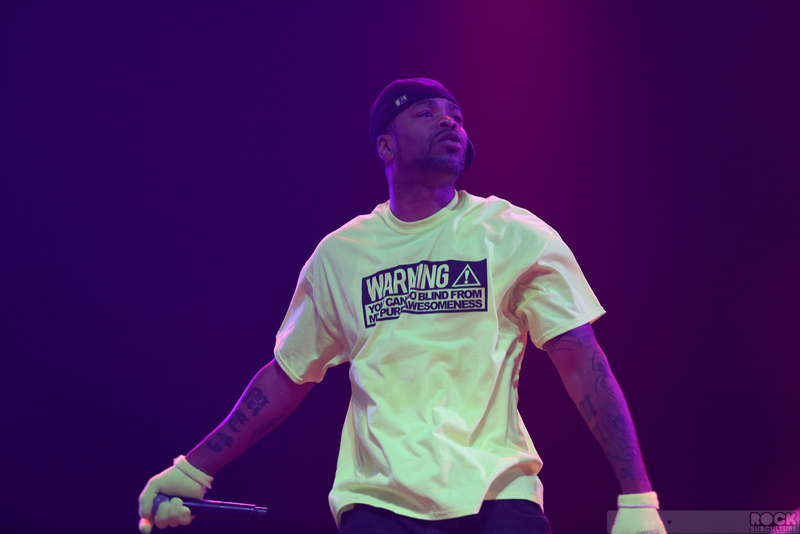 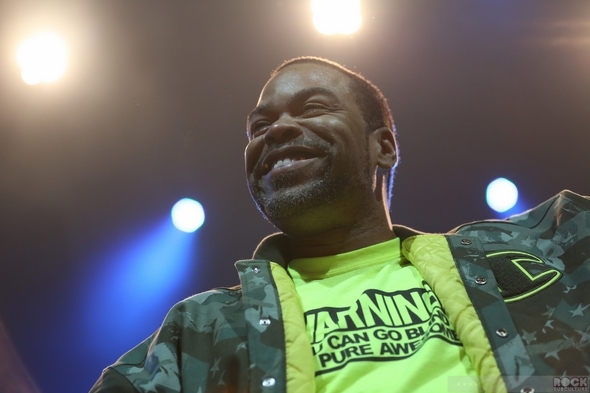 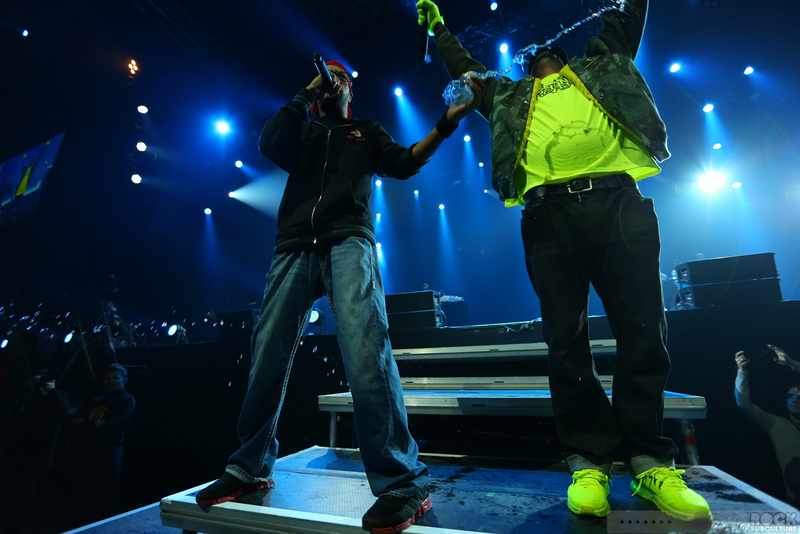 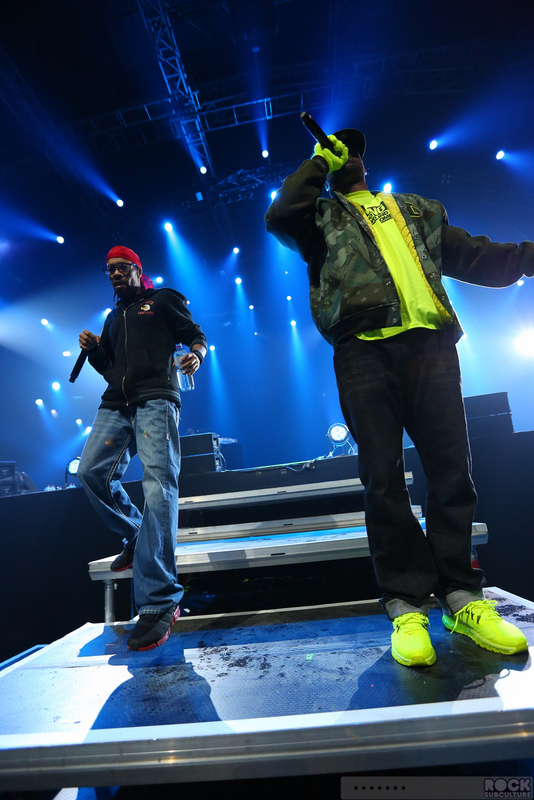 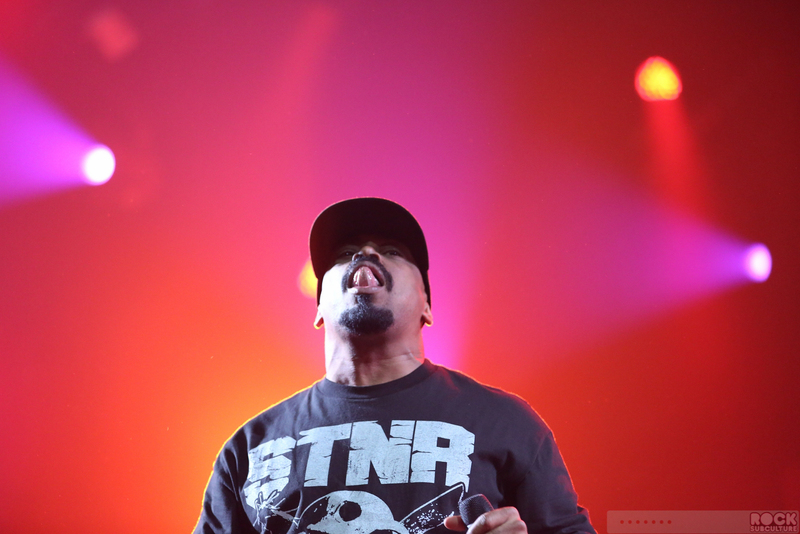 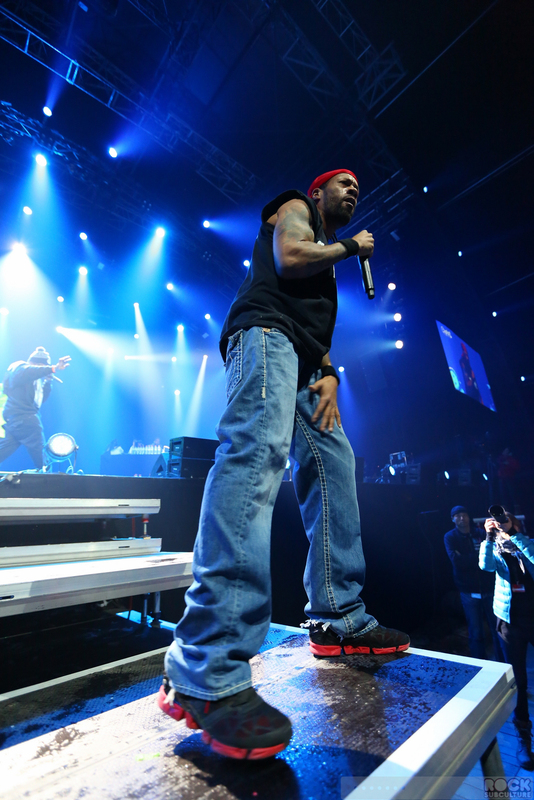 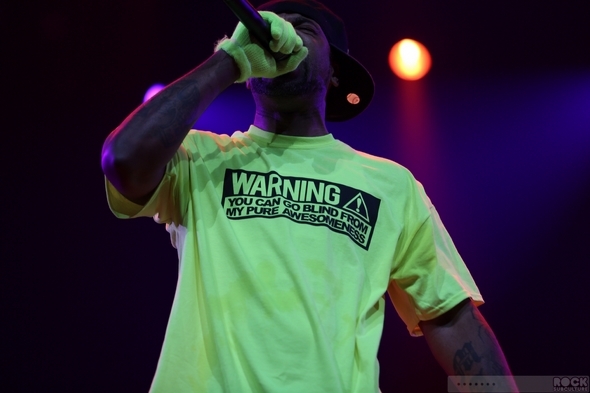 Method Man & Redman are a very popular hip hop duo who came together following their own respective partnerships in other groups (We-Tang Clan and Def Squad, respectively). They’ve been collaborating together since 1994, and even had a short-lived TV series called Method & Red, and starred in the film How High. 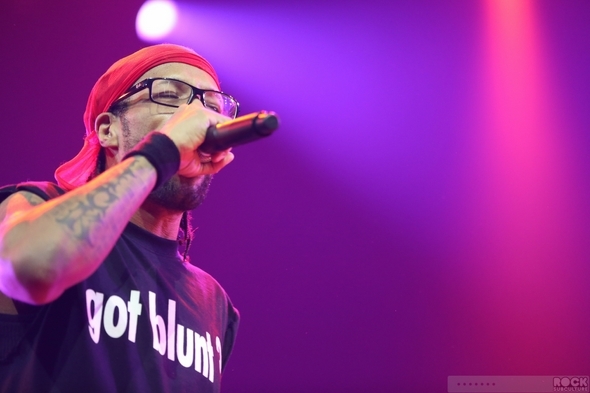 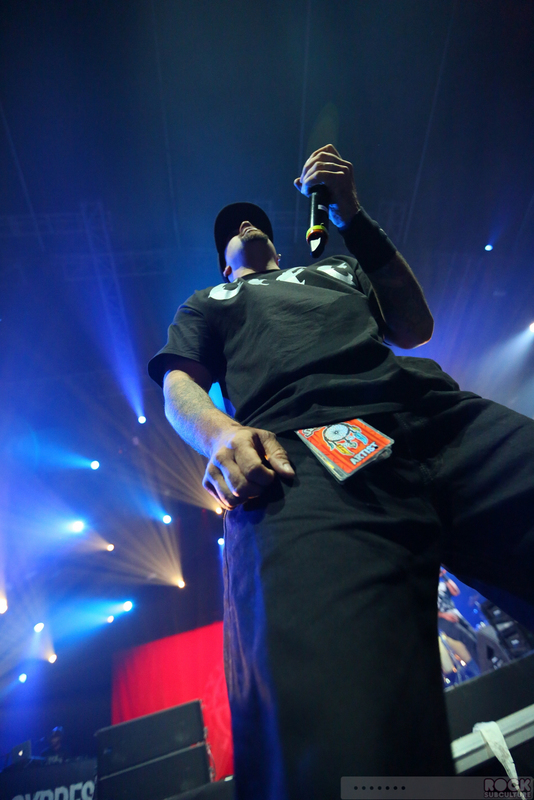 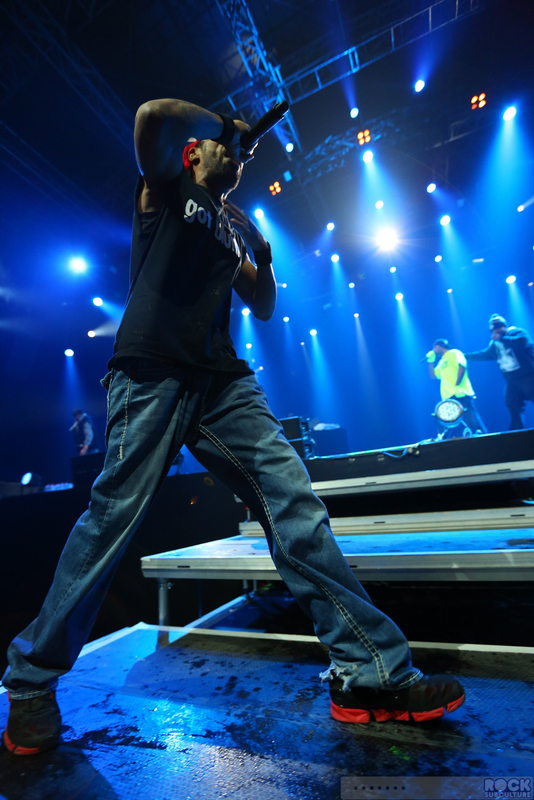 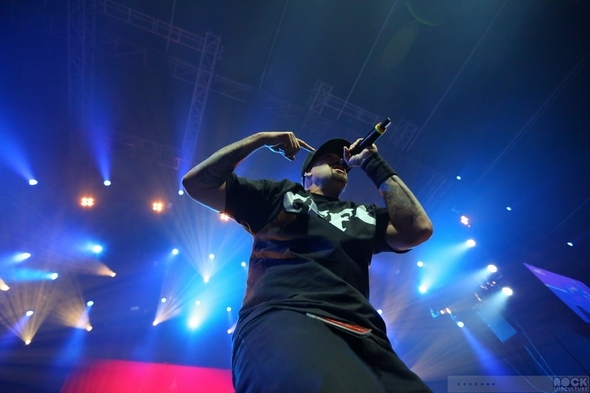 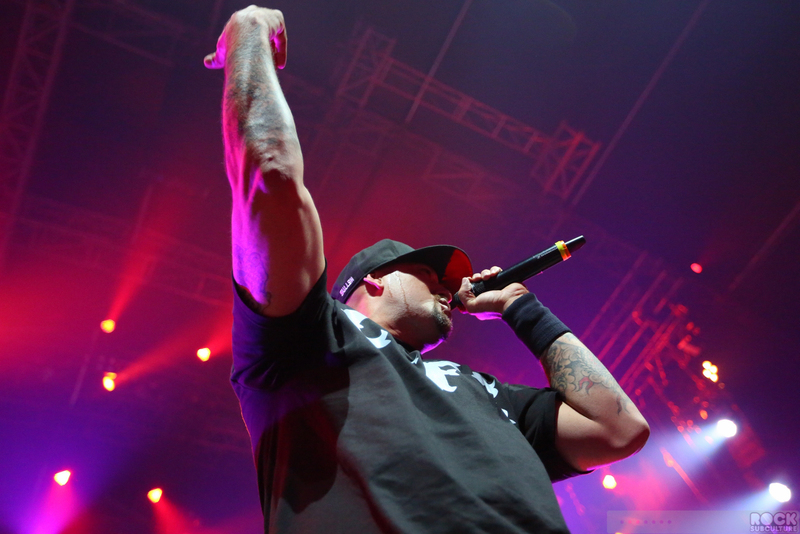 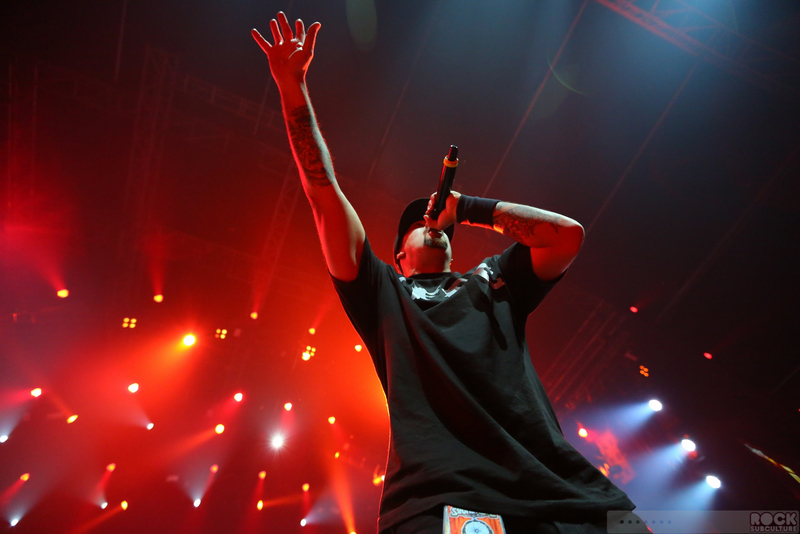 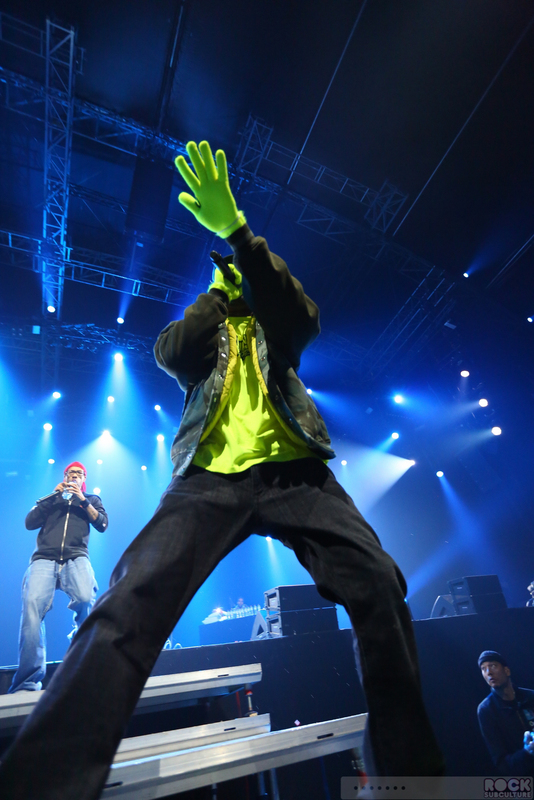 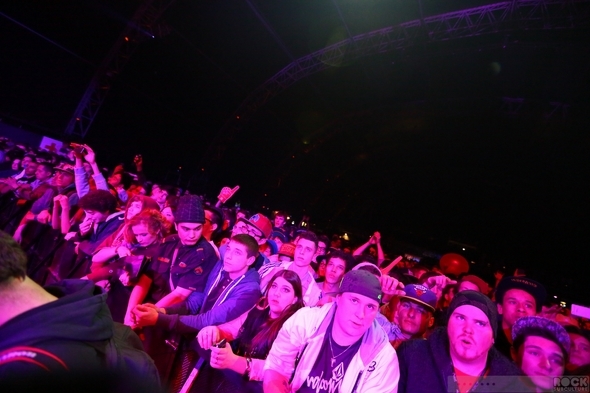 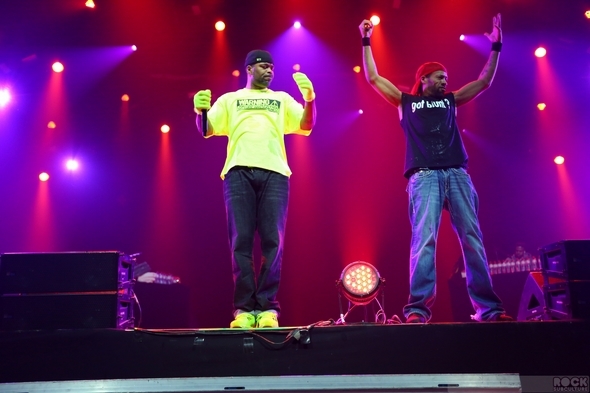 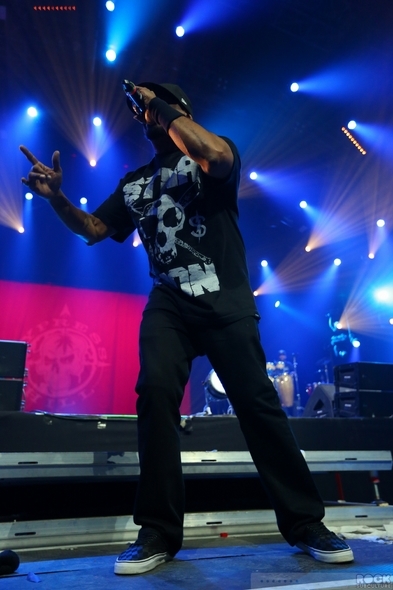 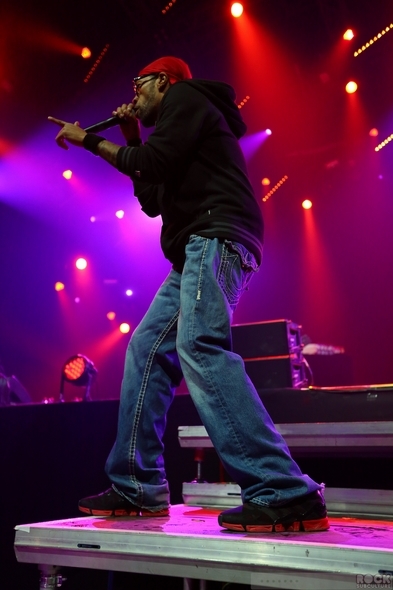 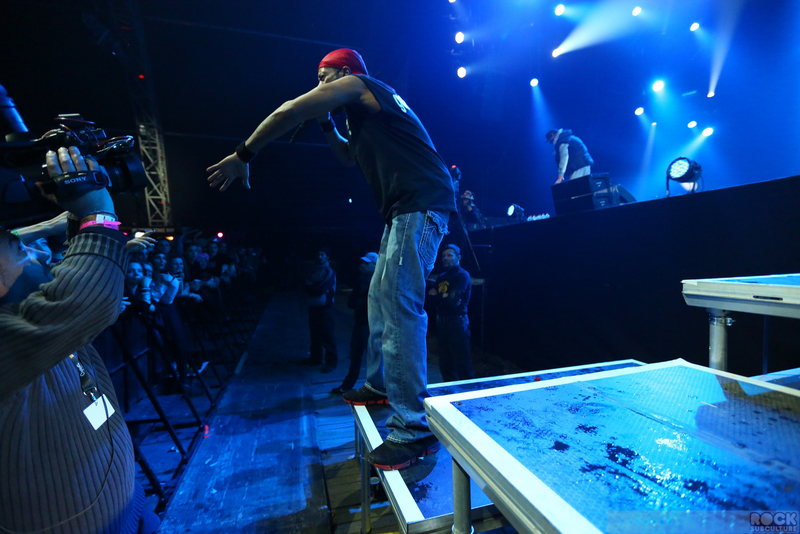 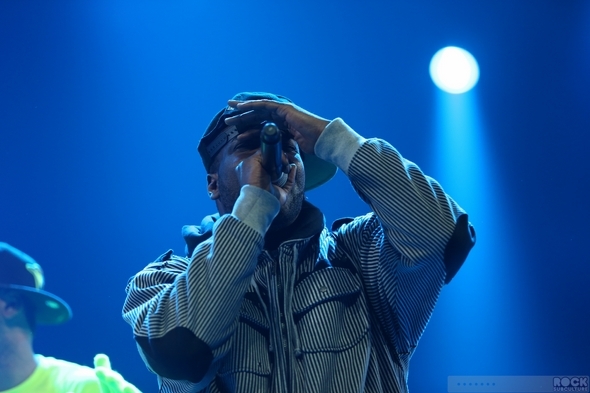 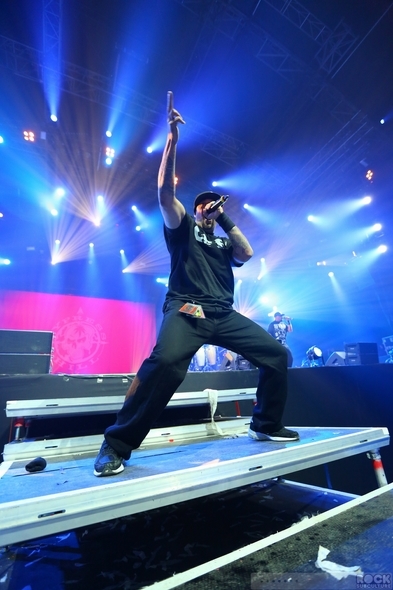 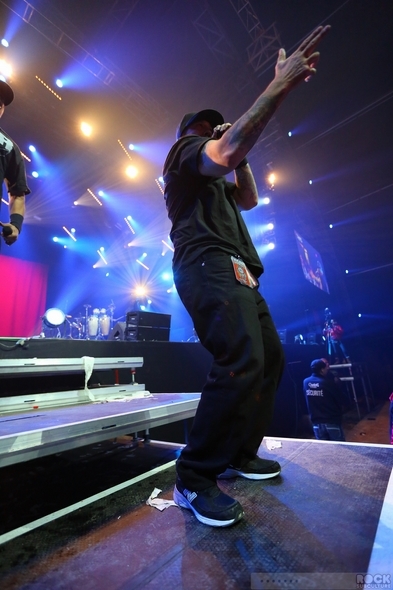 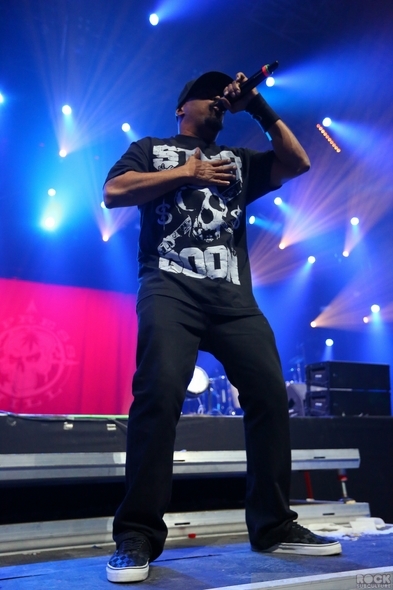 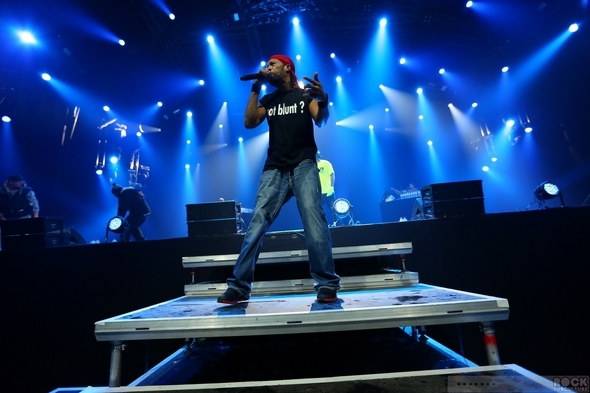 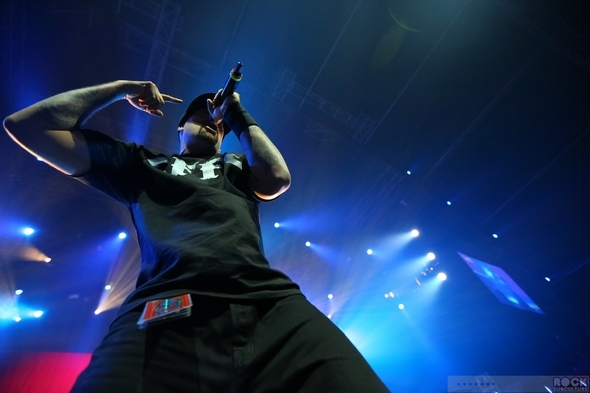 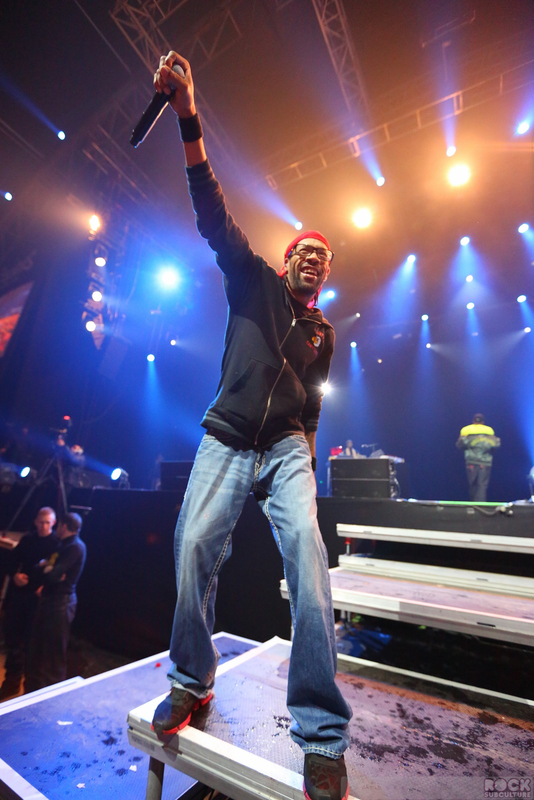 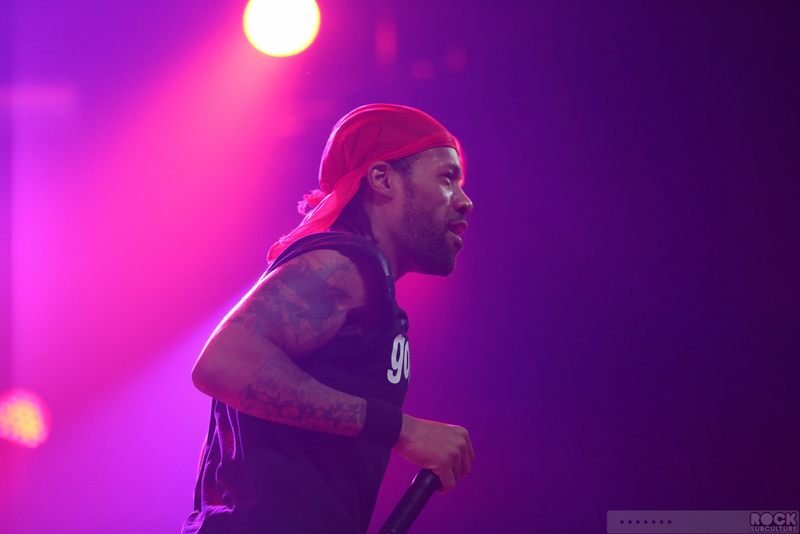 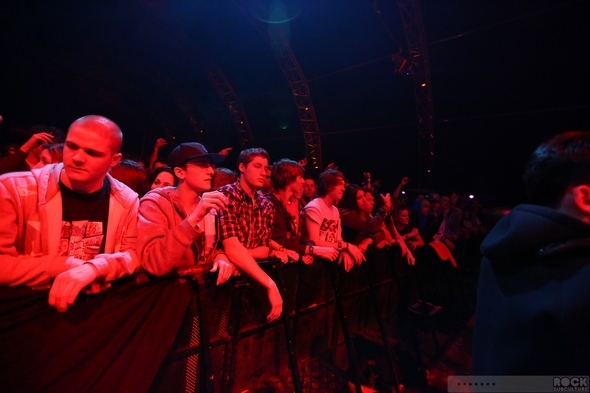 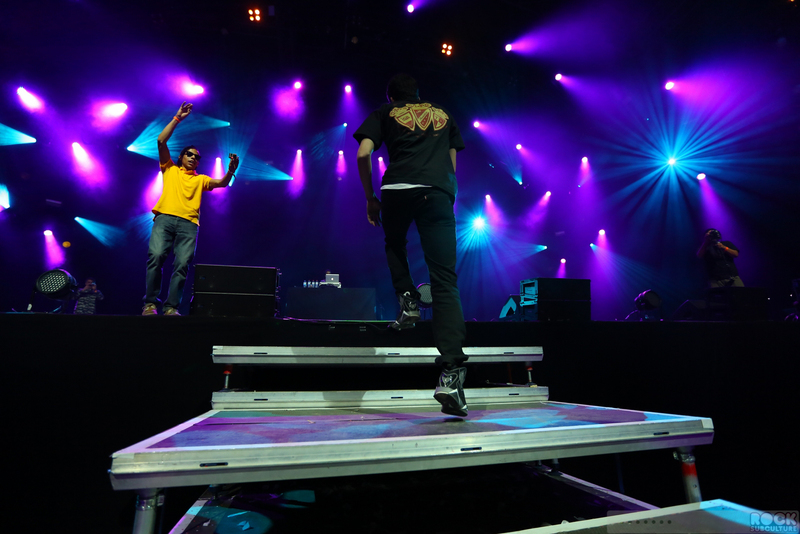 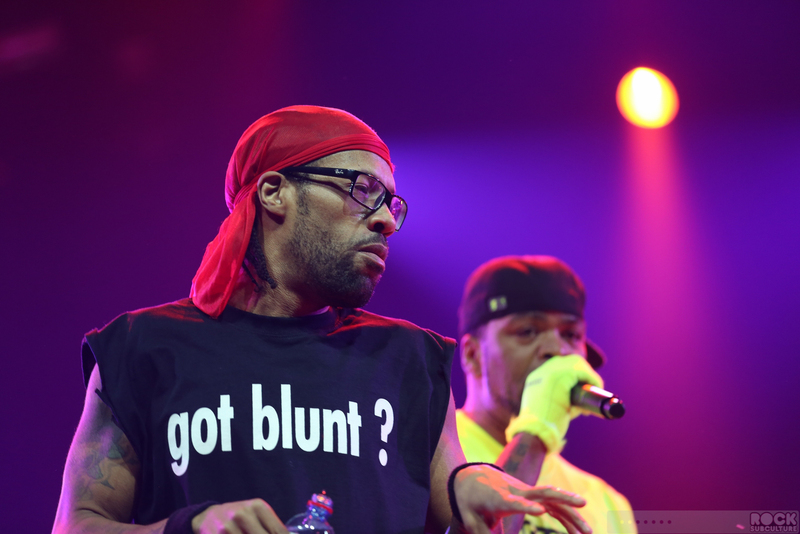 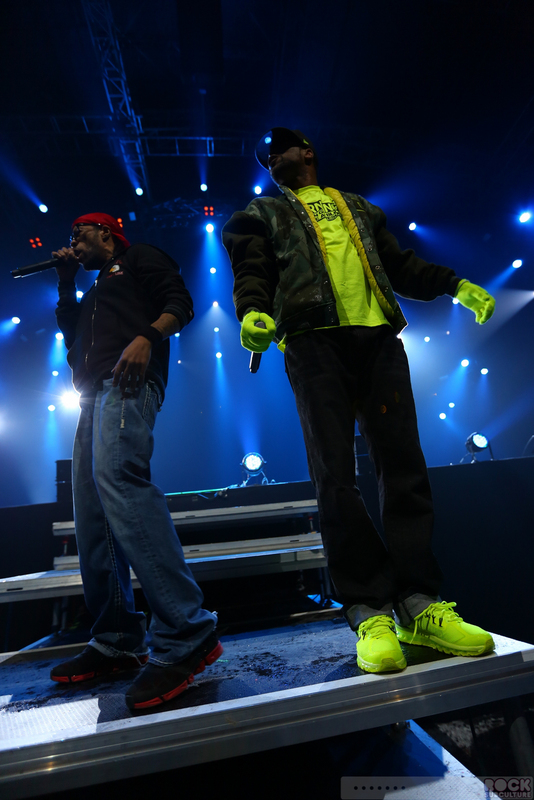 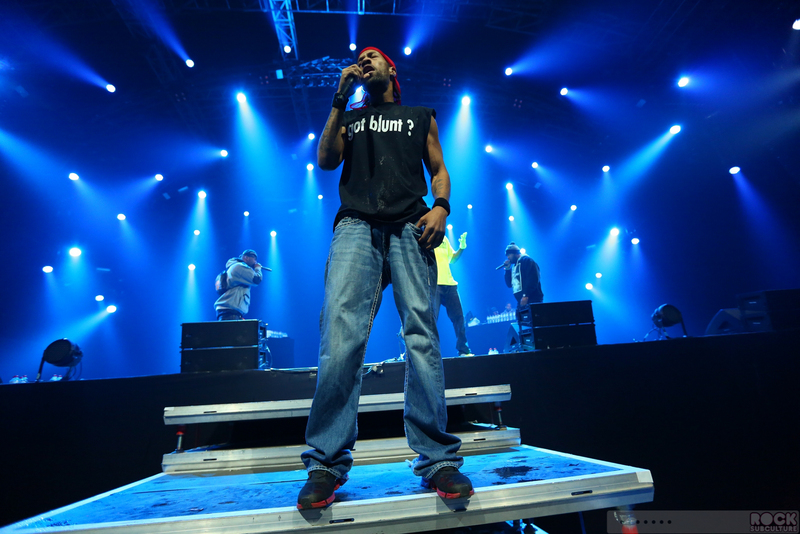 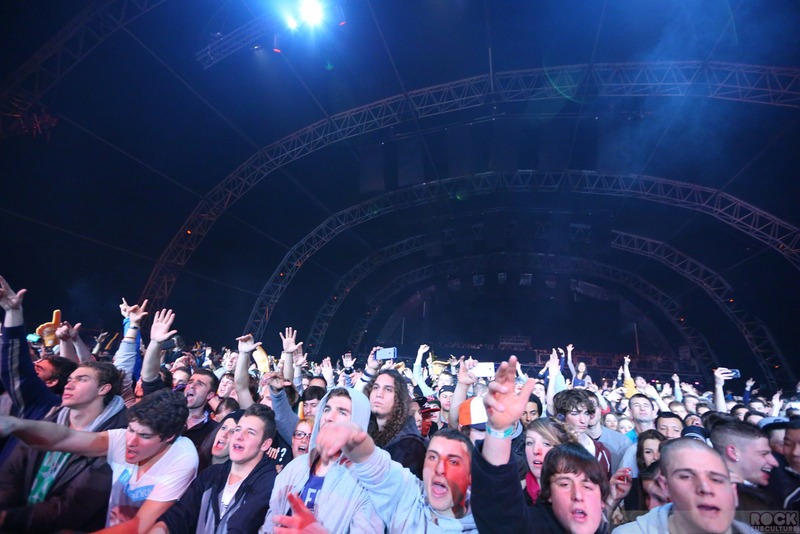 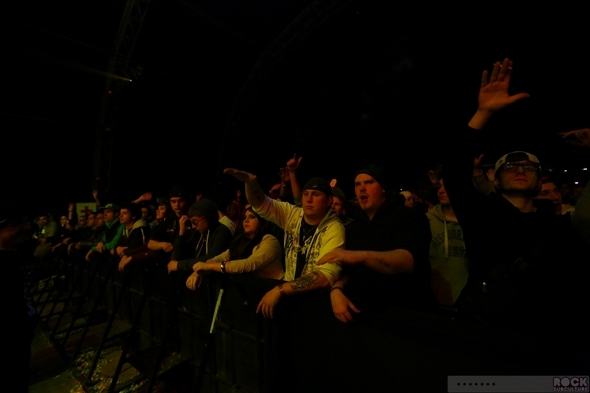 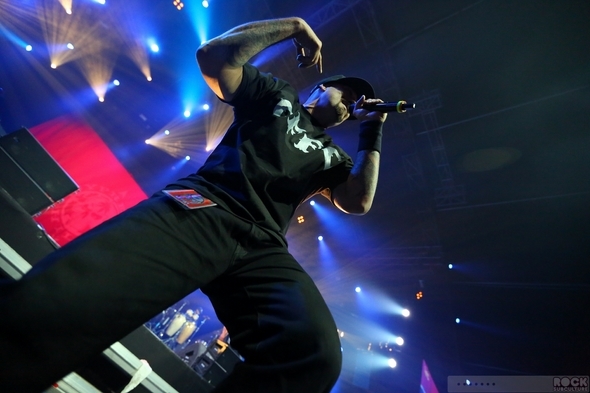 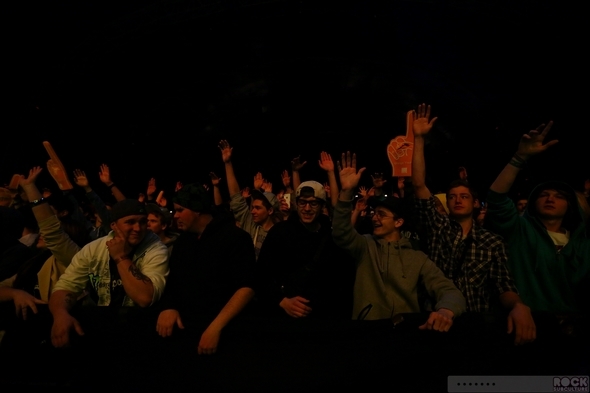 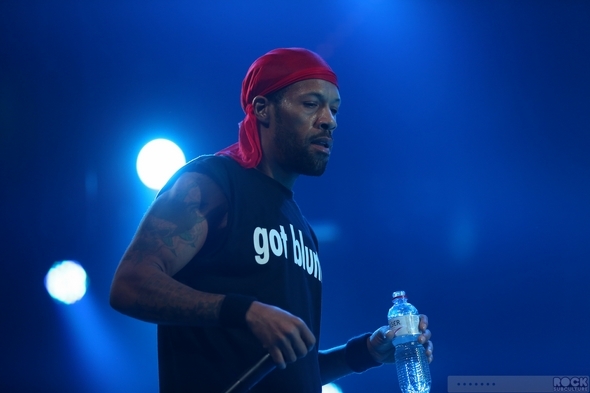 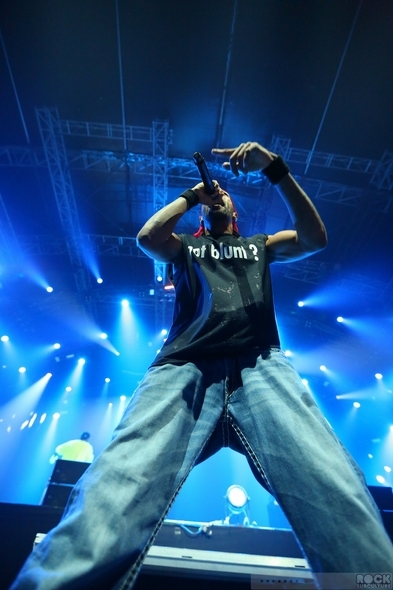 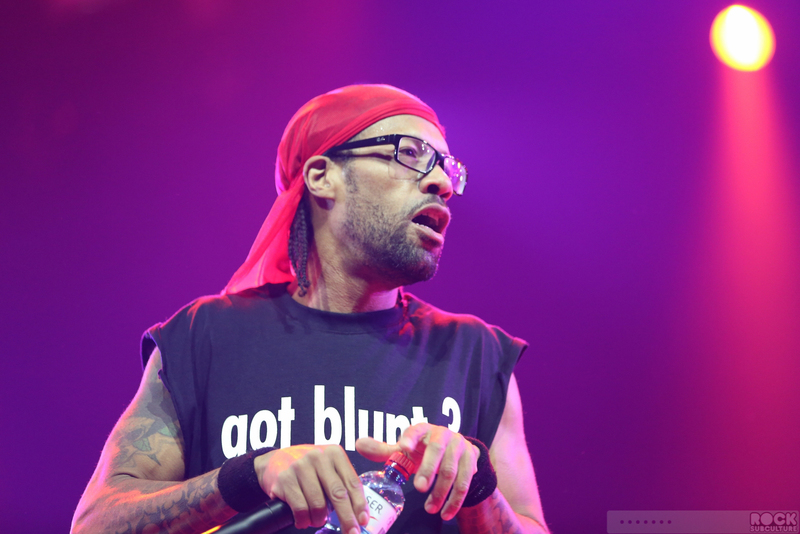 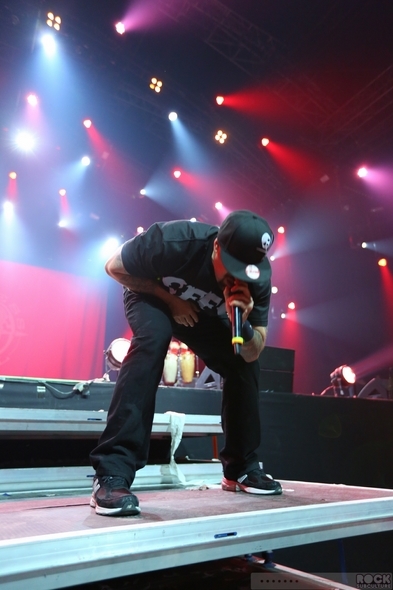 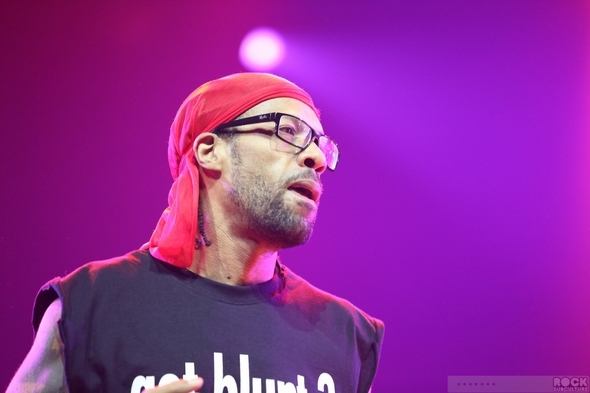 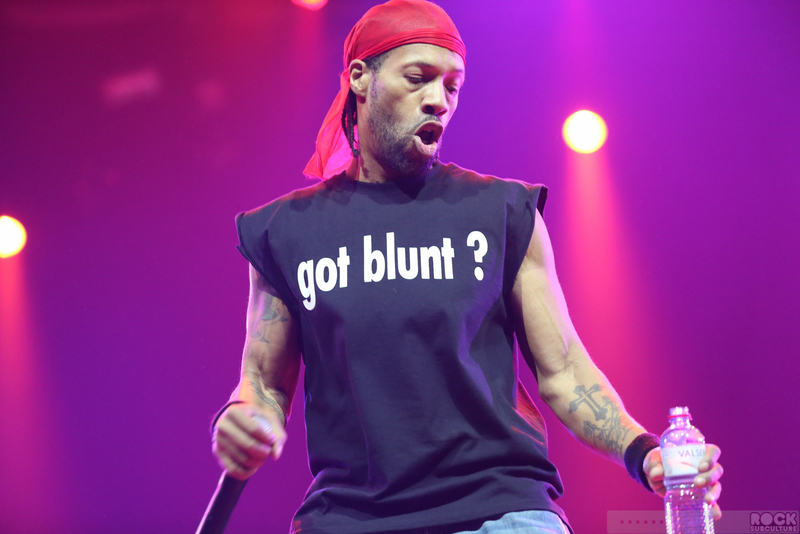 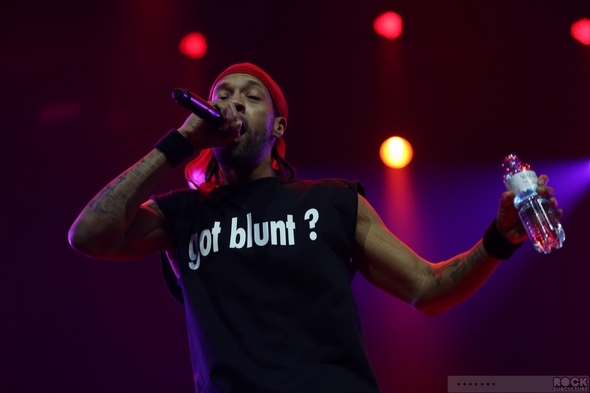 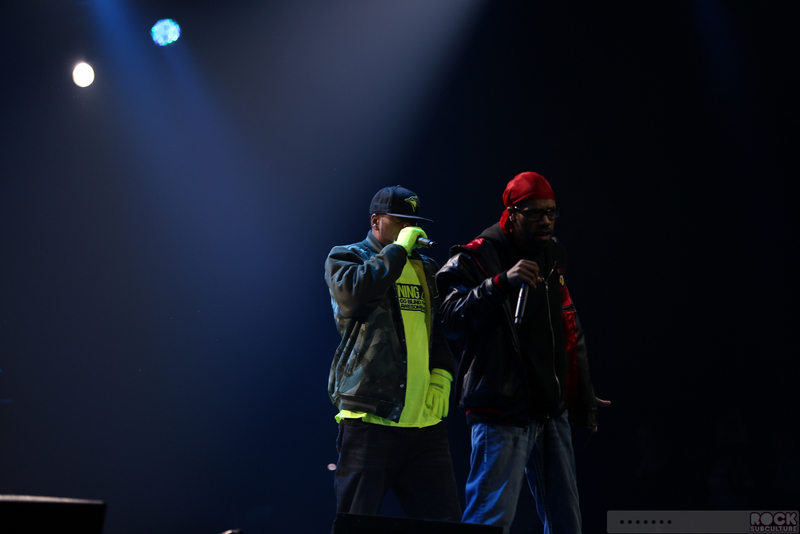 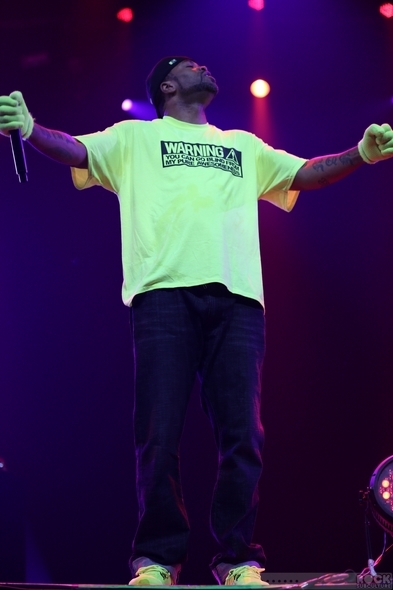 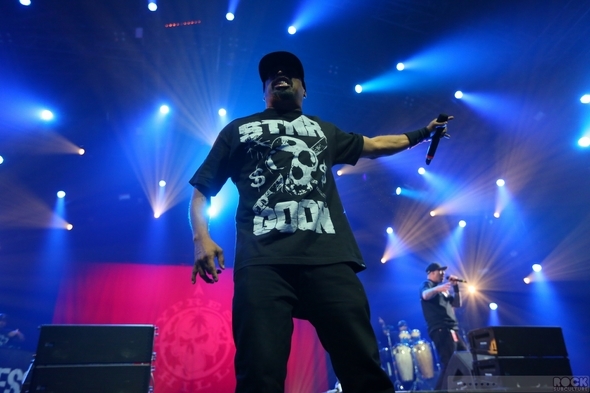 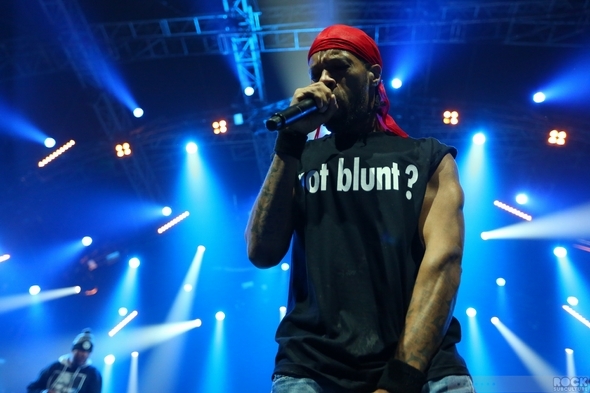 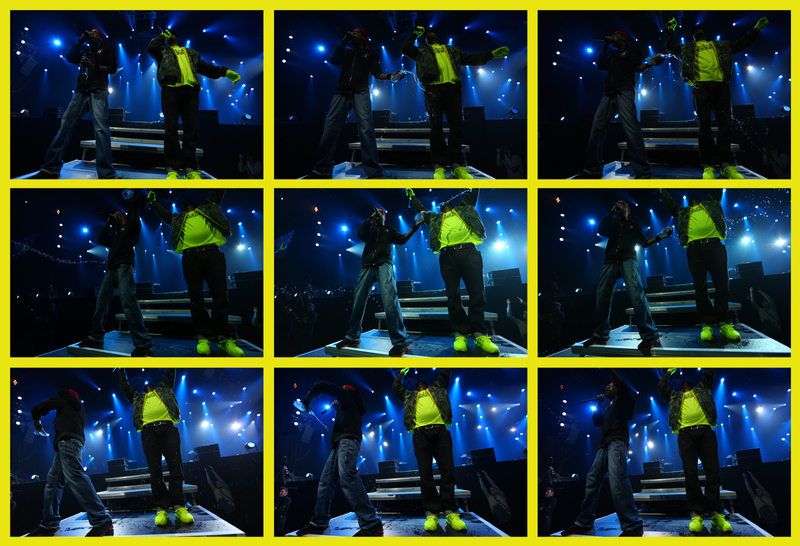 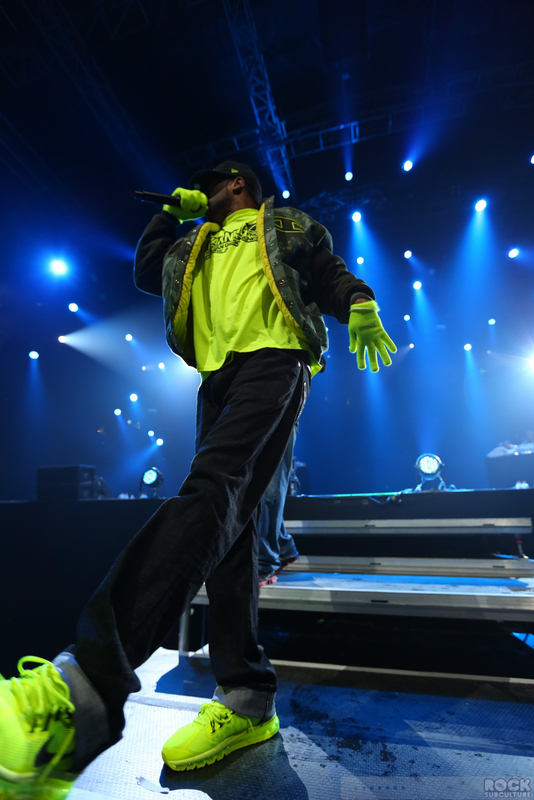 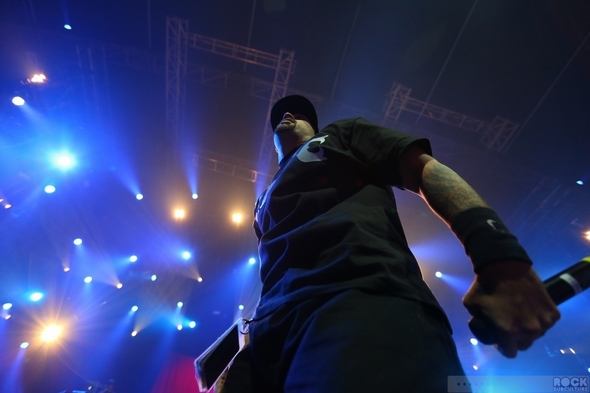 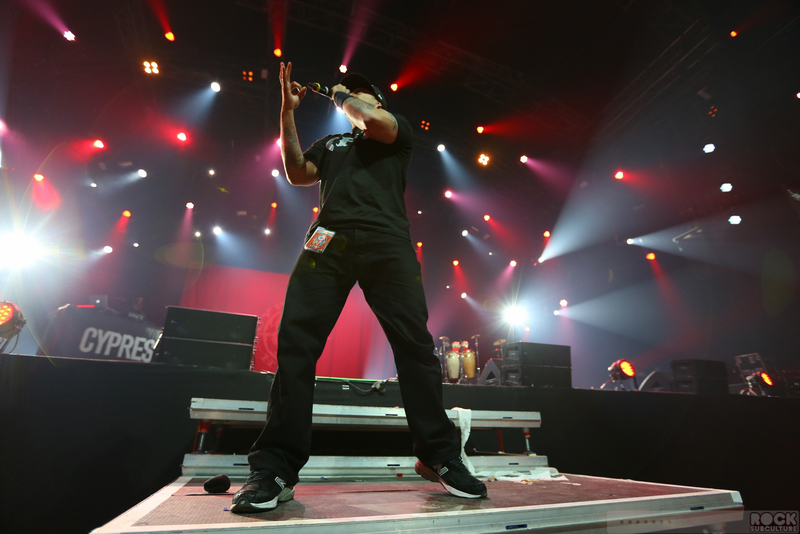 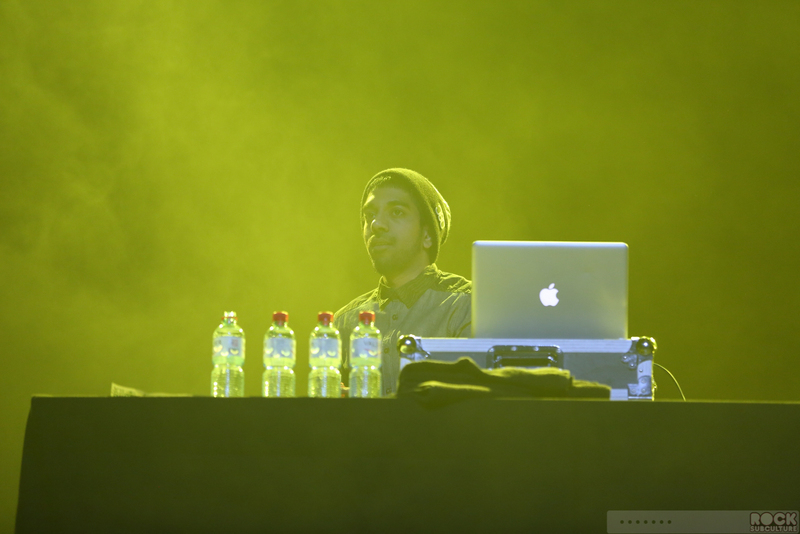 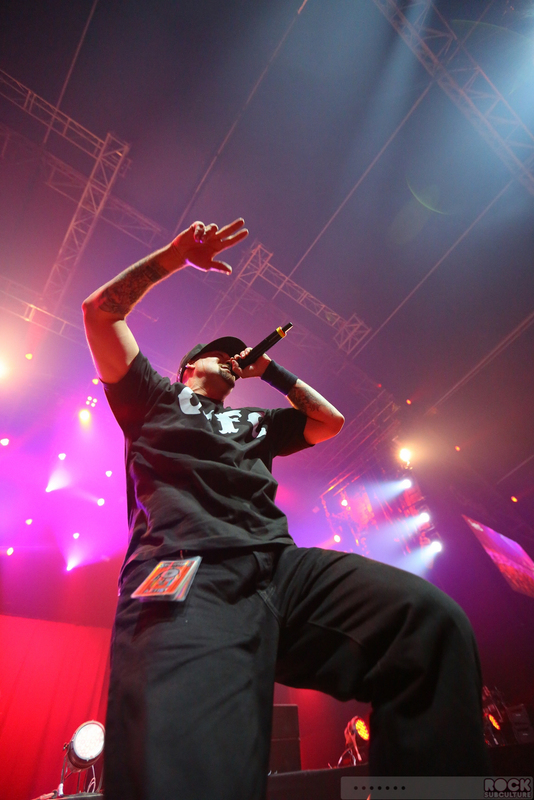 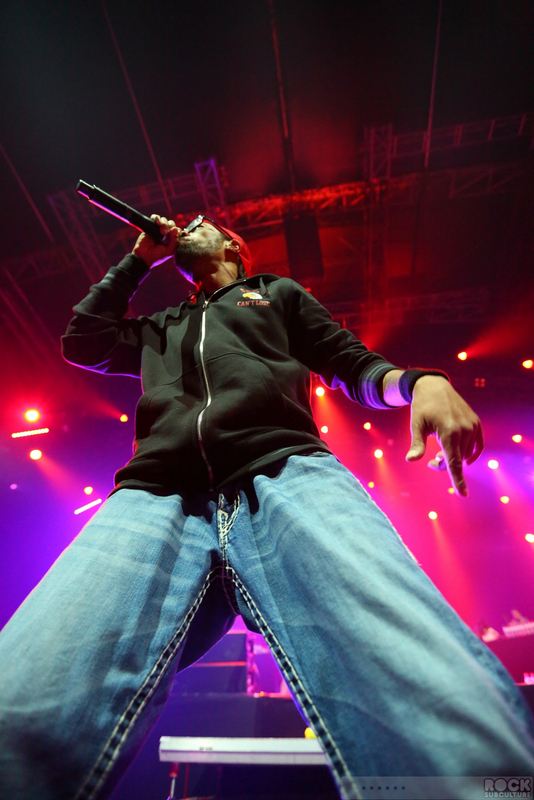 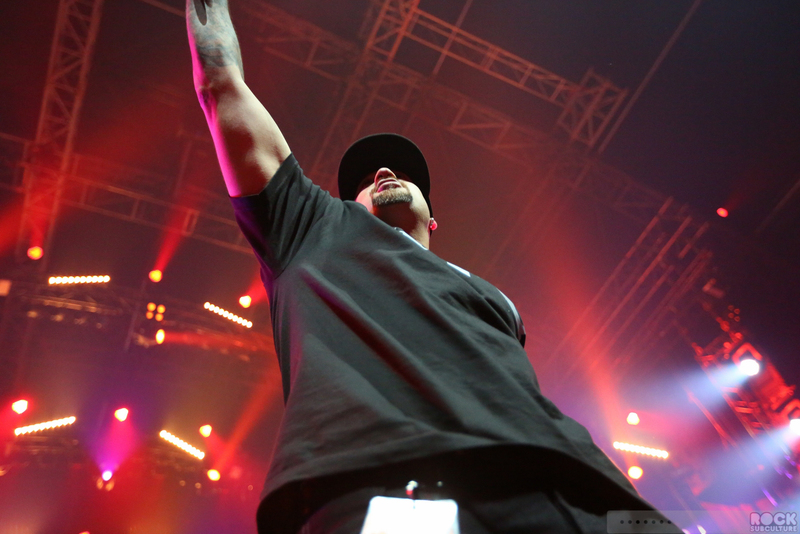 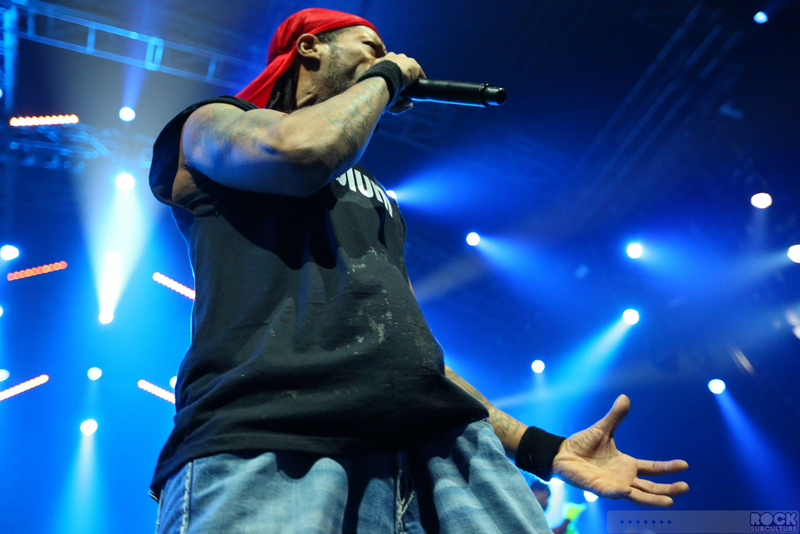 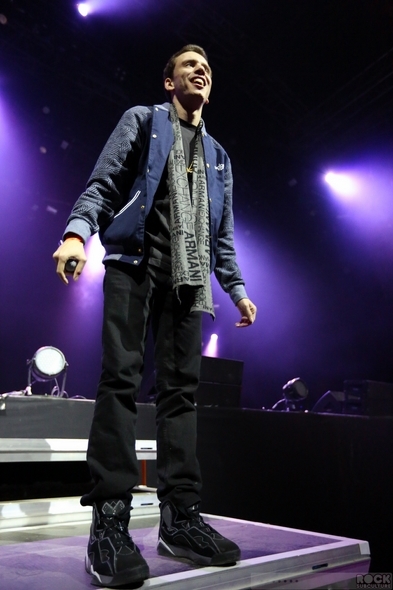 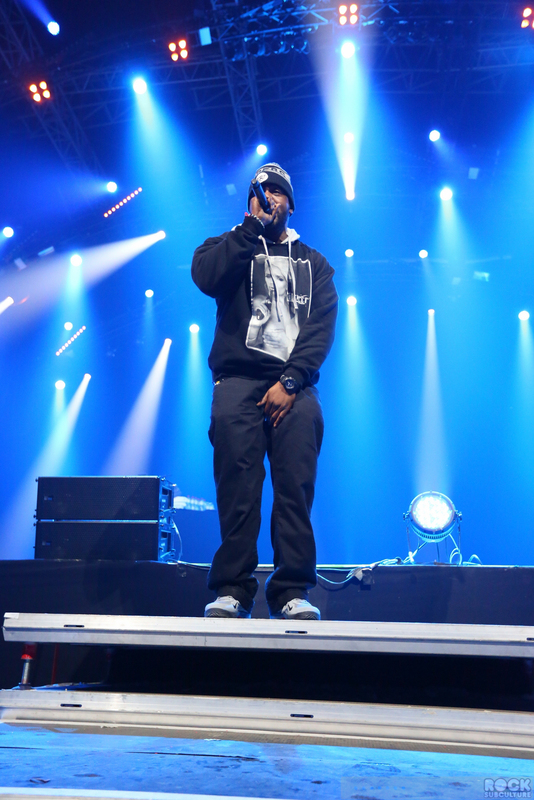 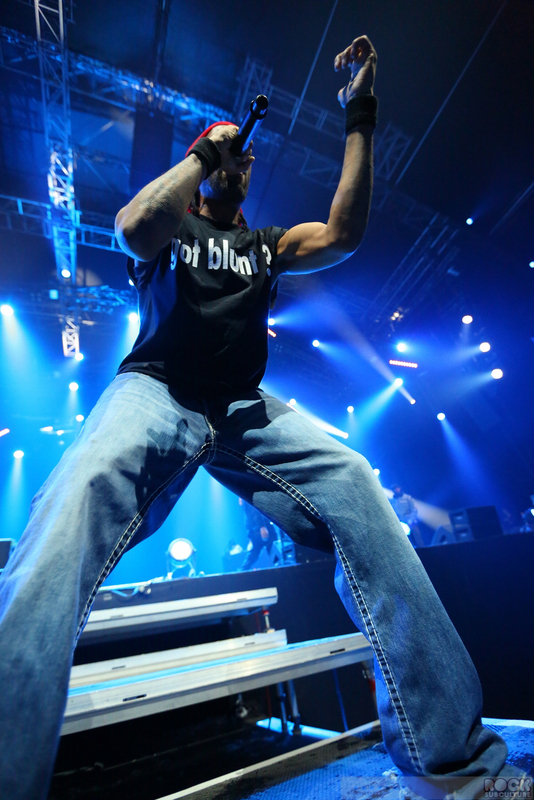 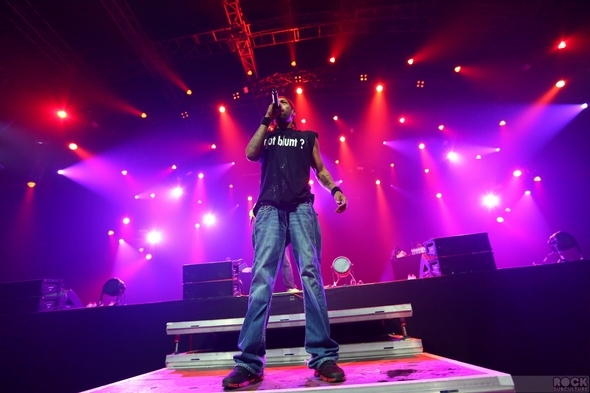 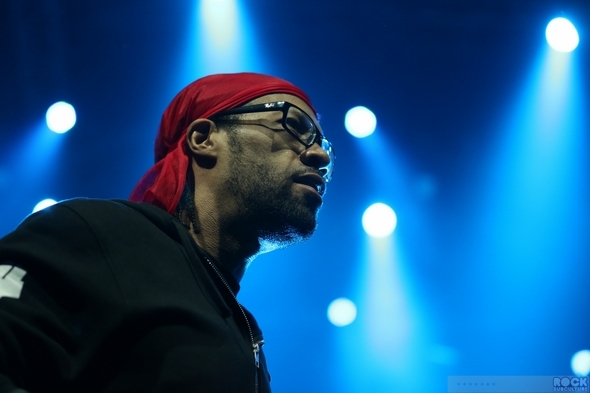 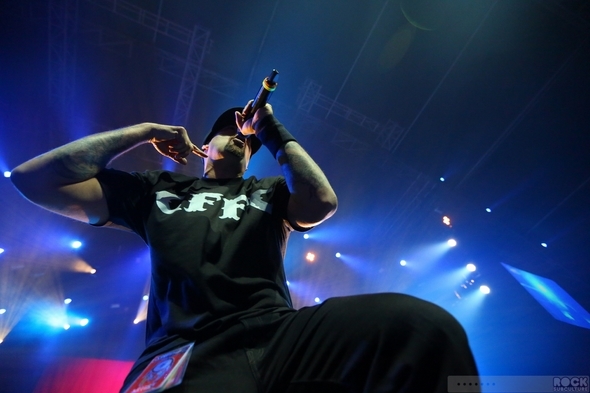 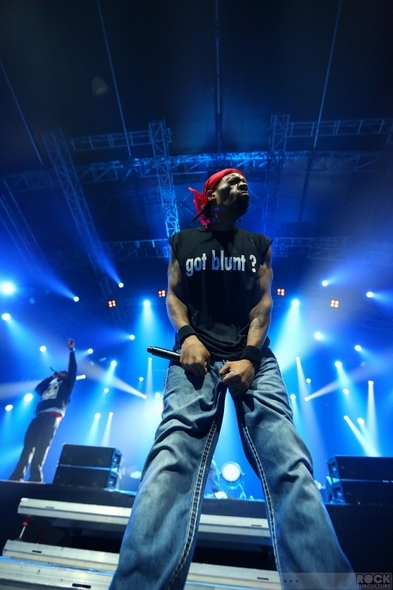 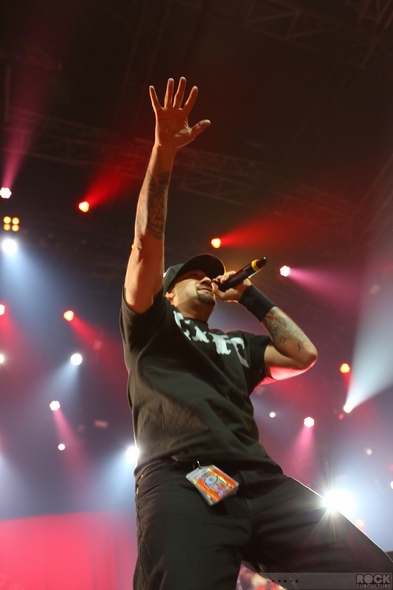 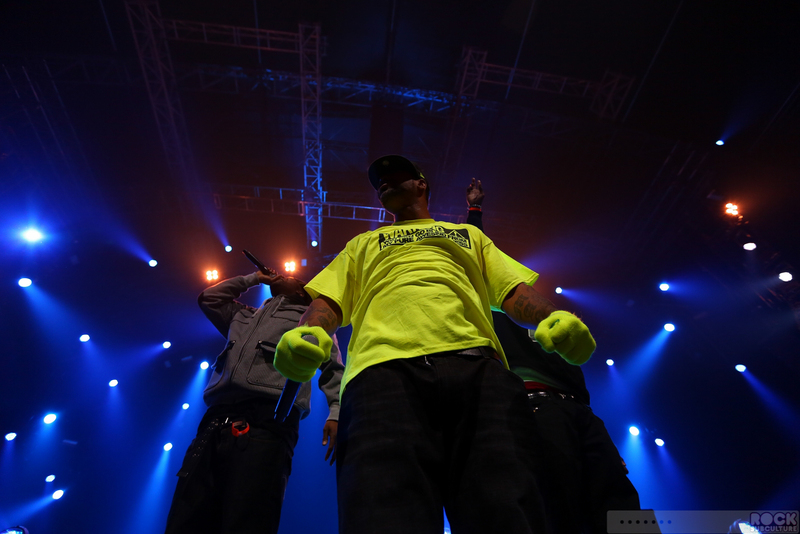 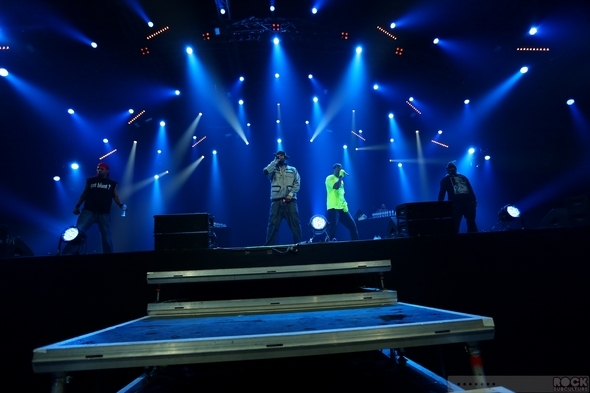 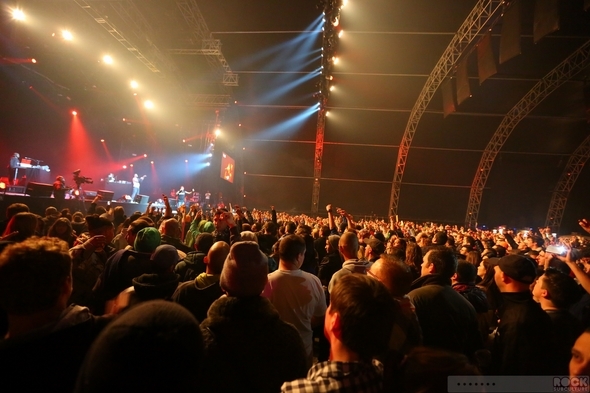 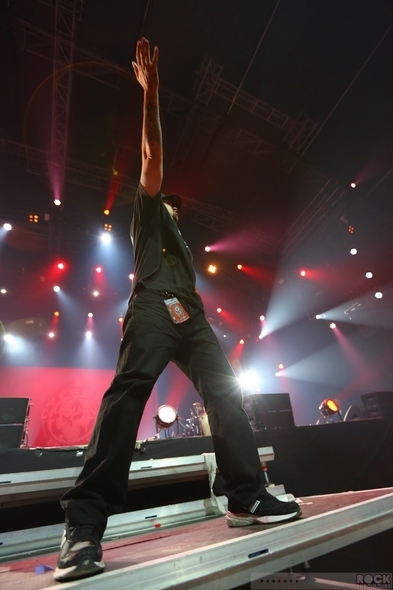 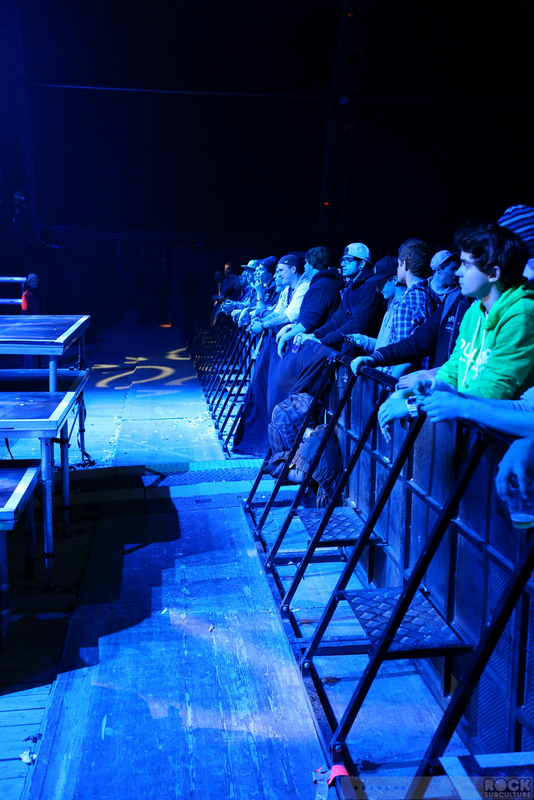 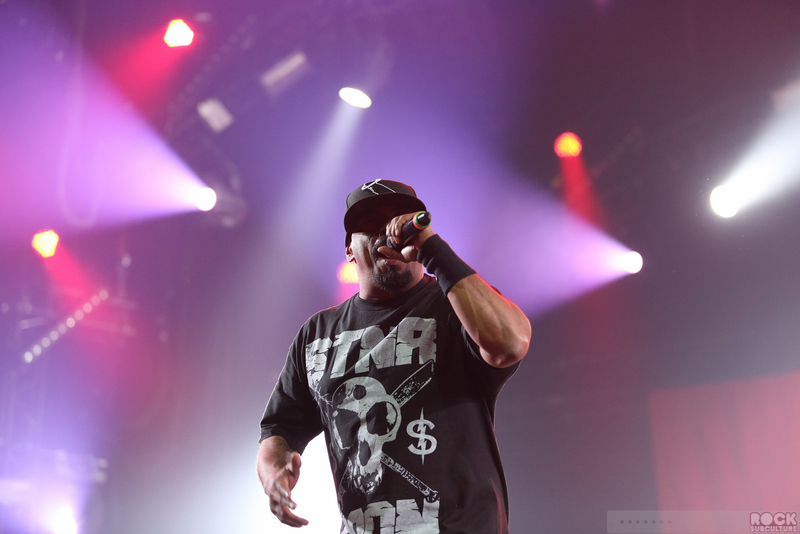 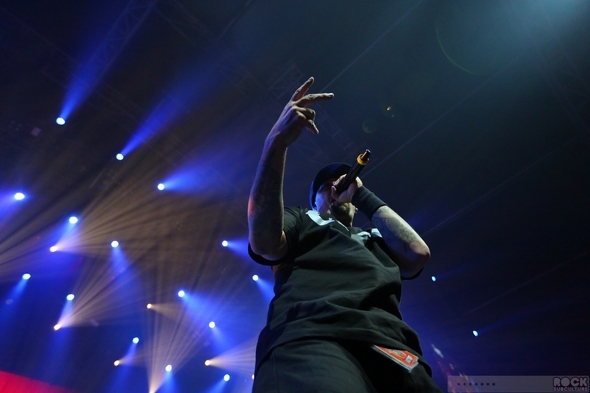 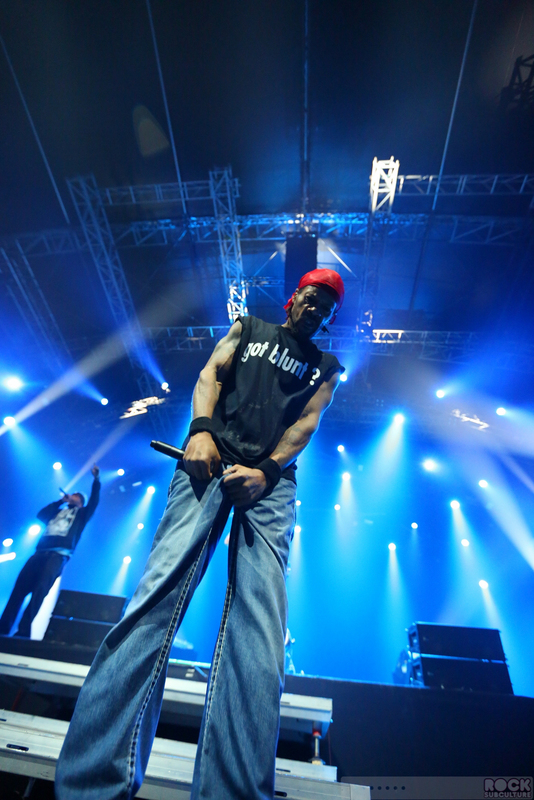 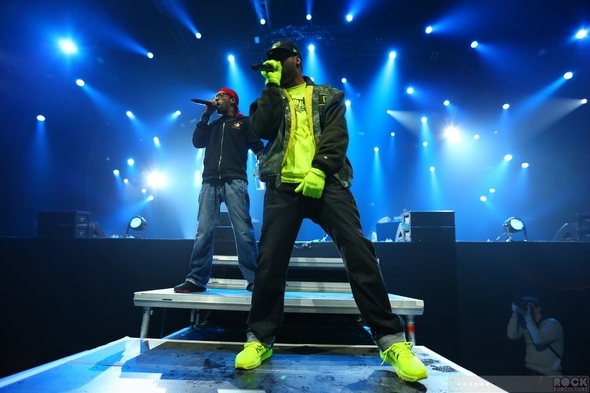 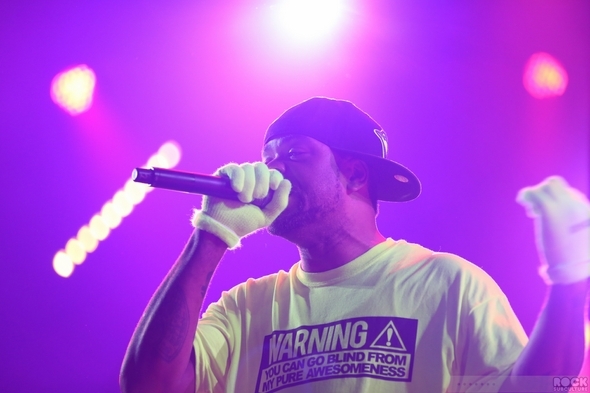 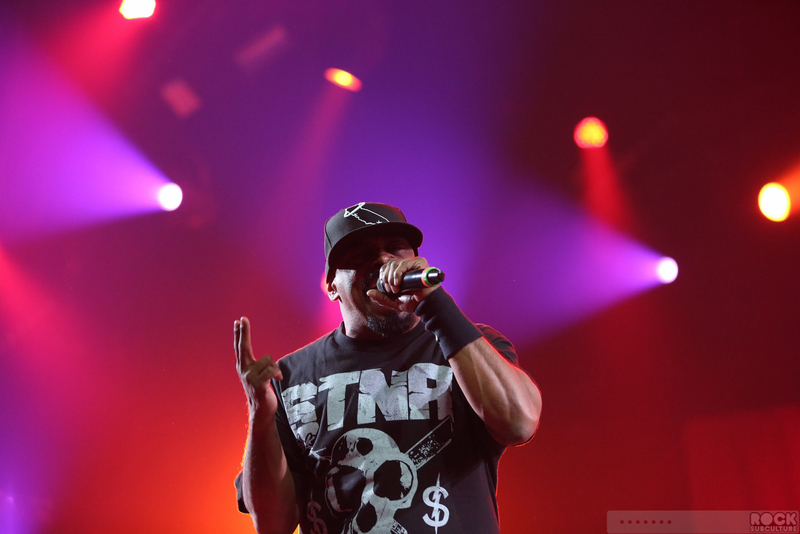 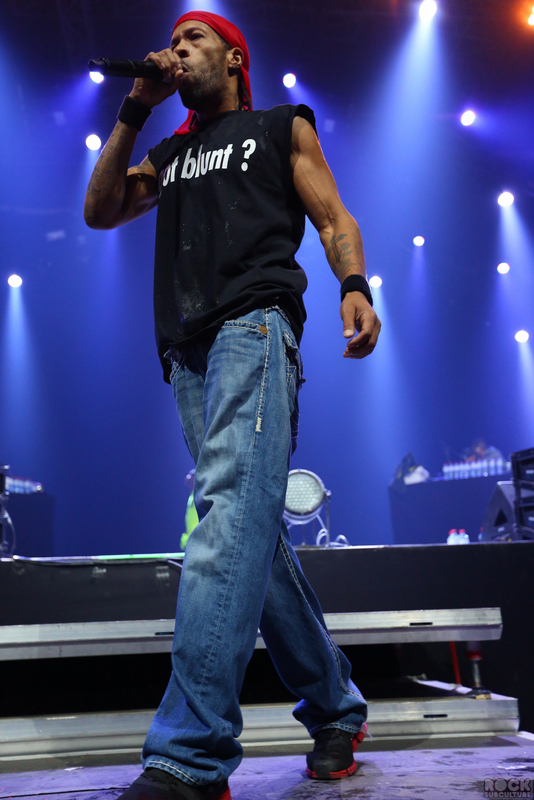 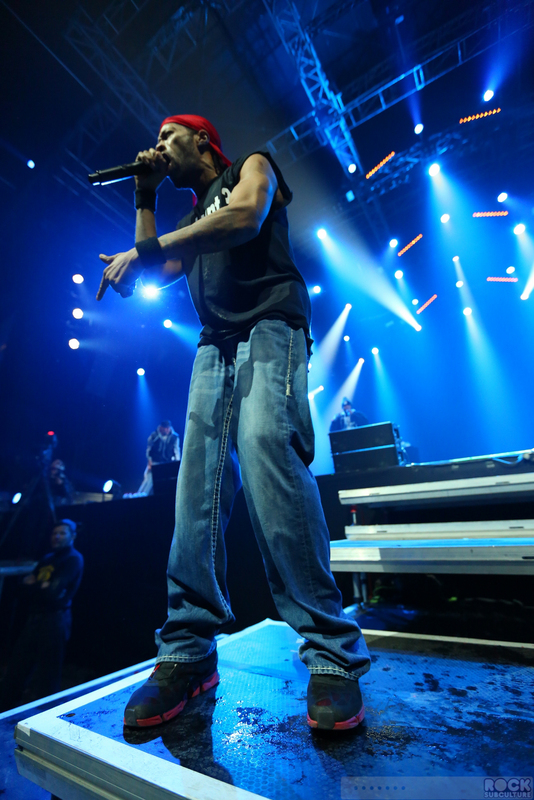 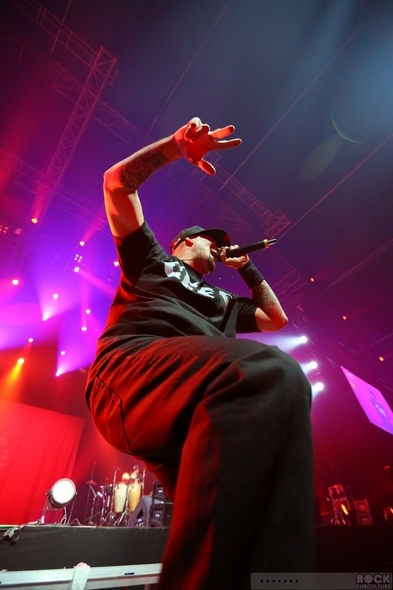 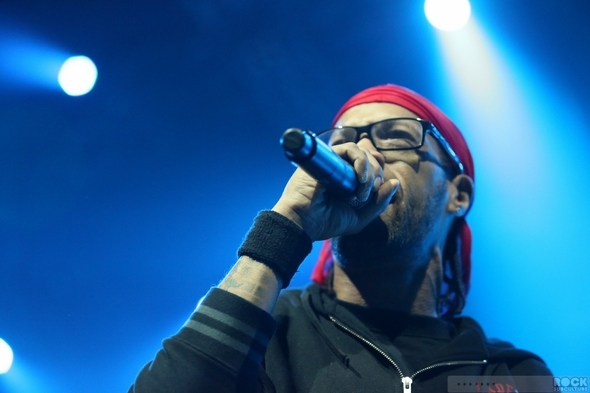 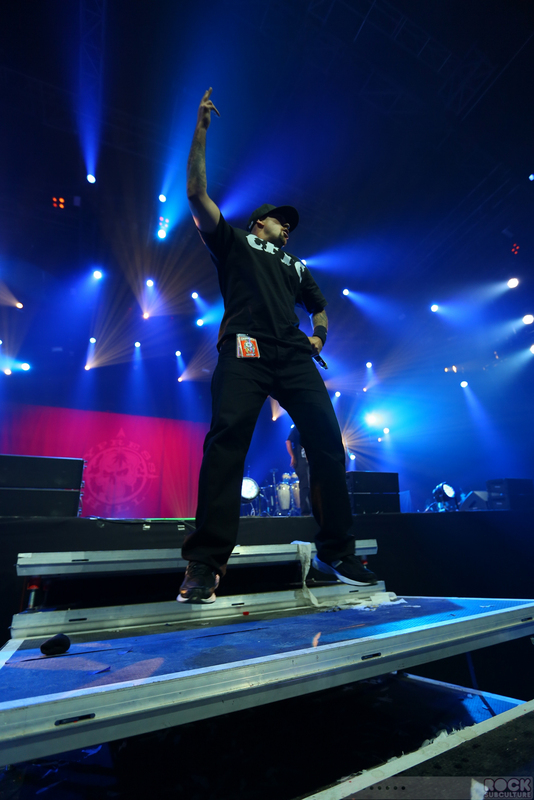 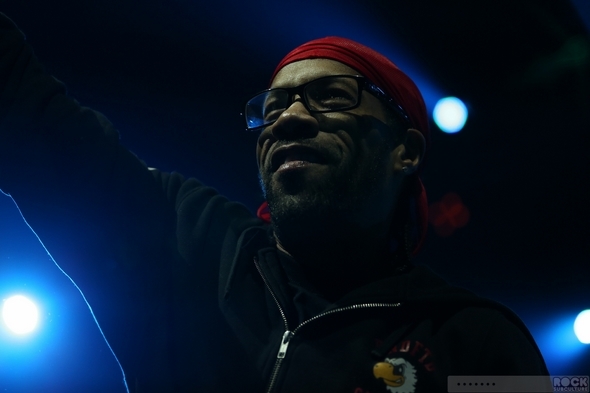 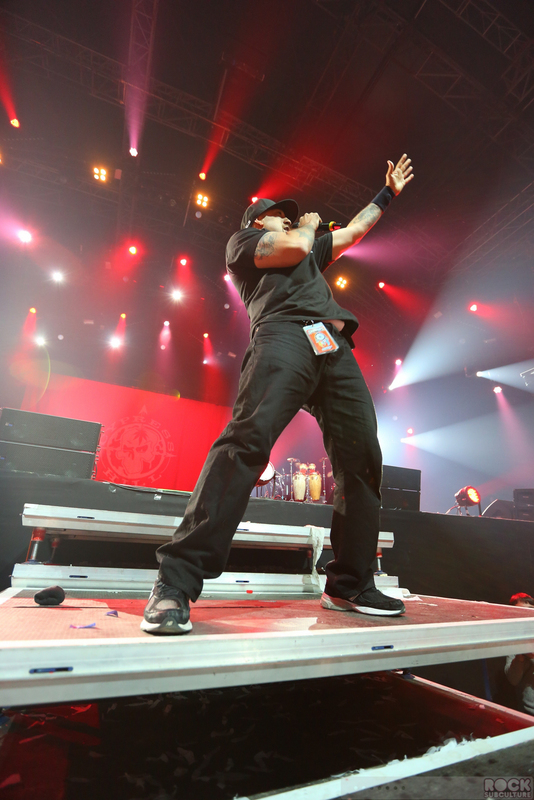 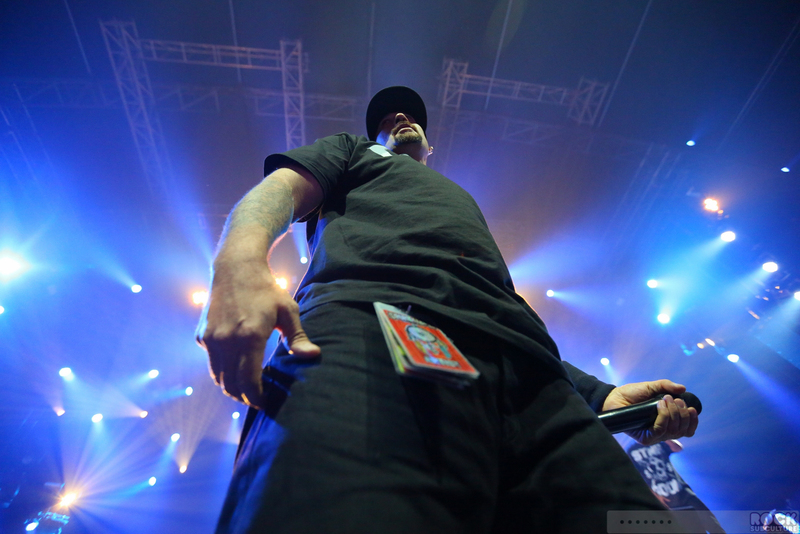 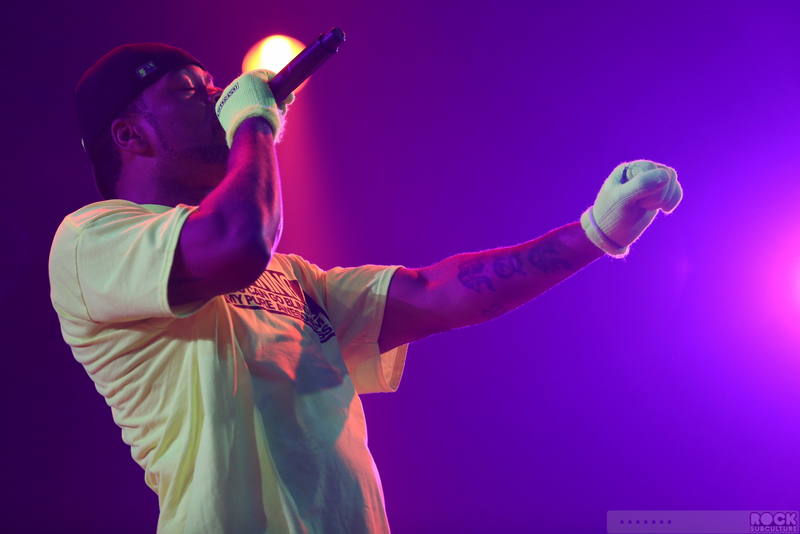 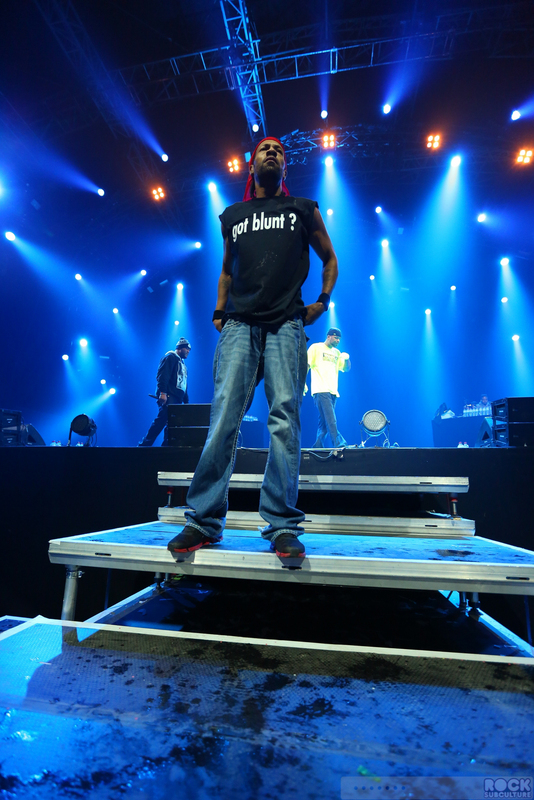 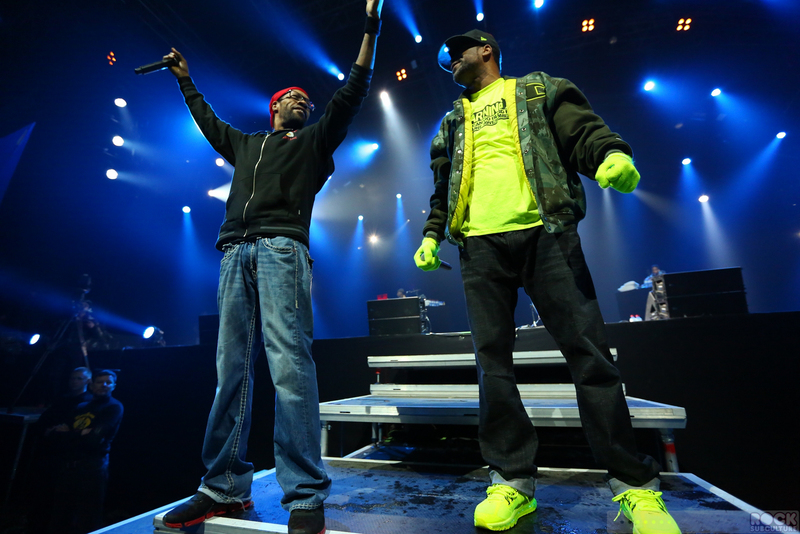 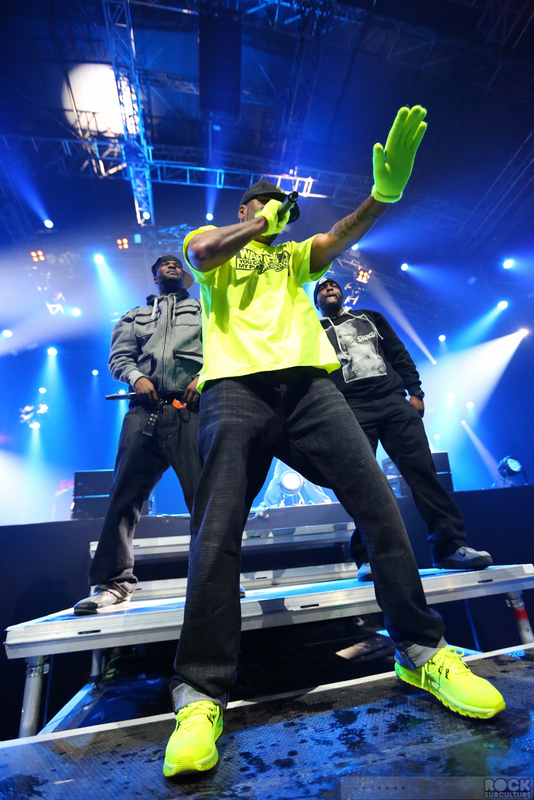 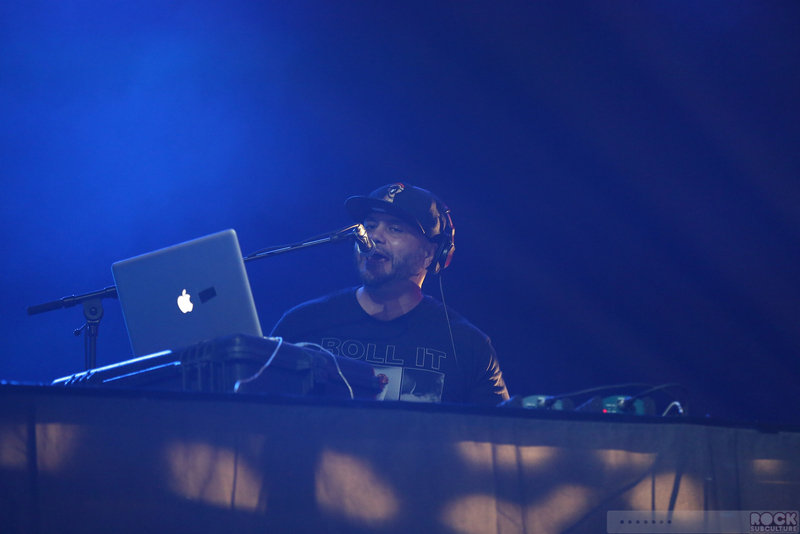 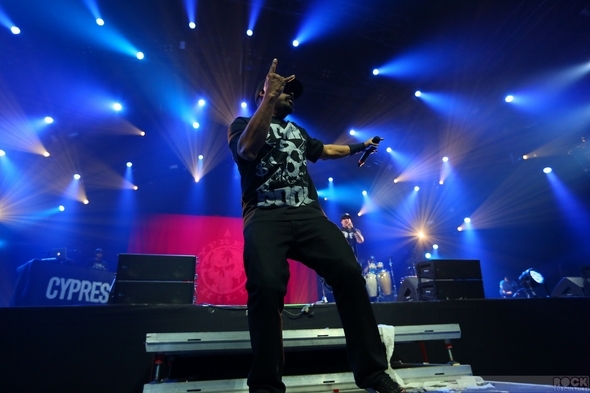 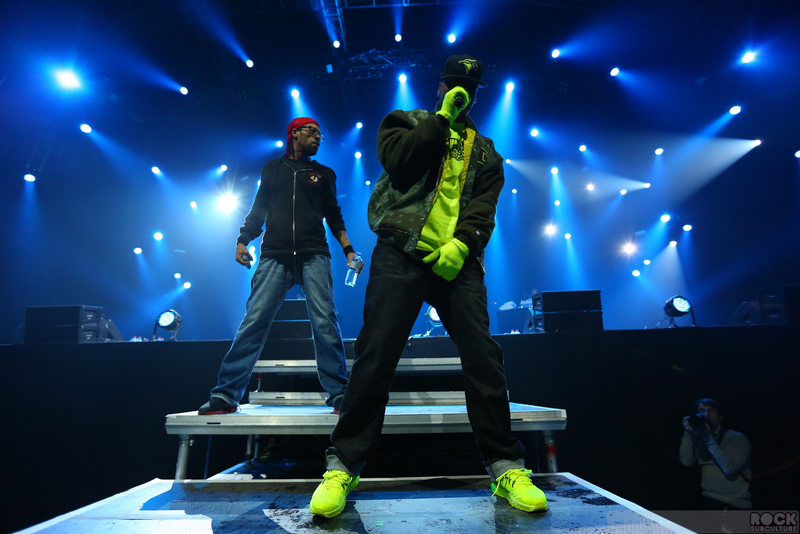 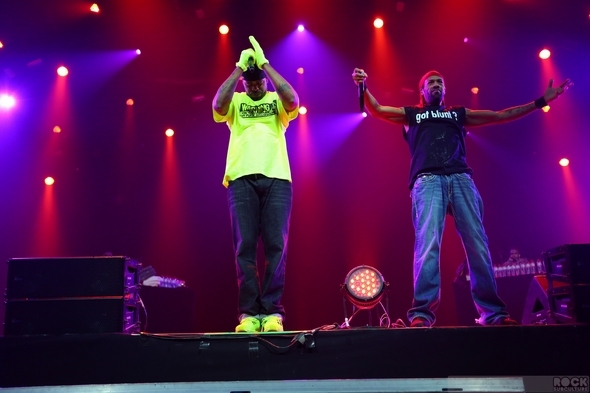 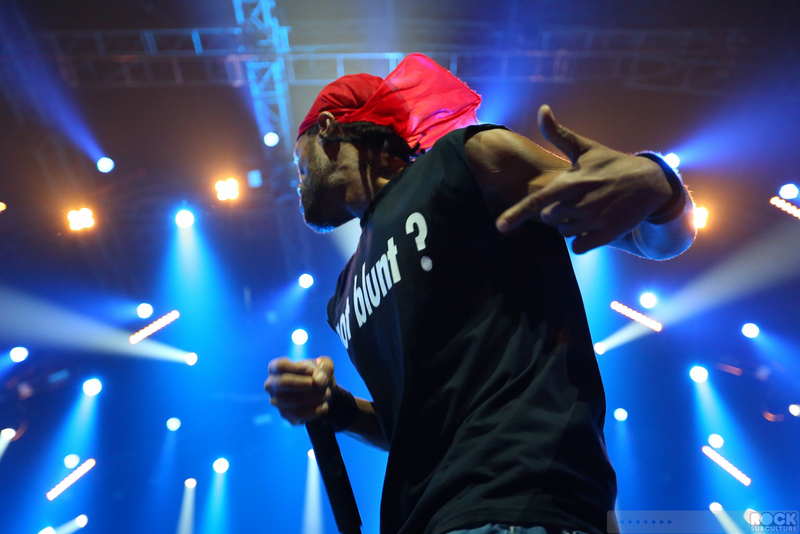 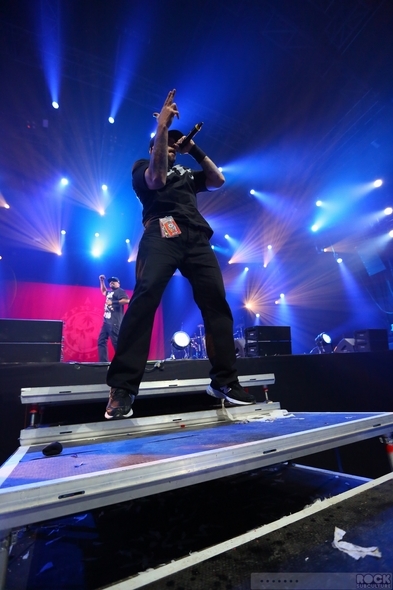 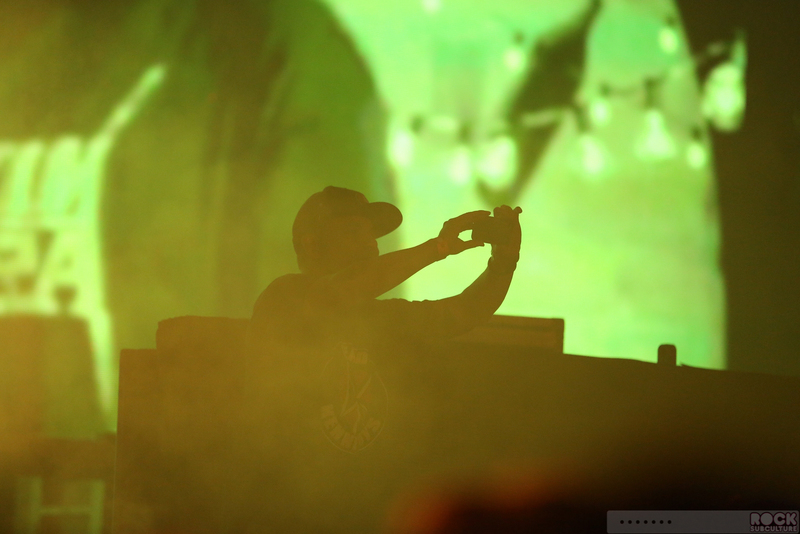 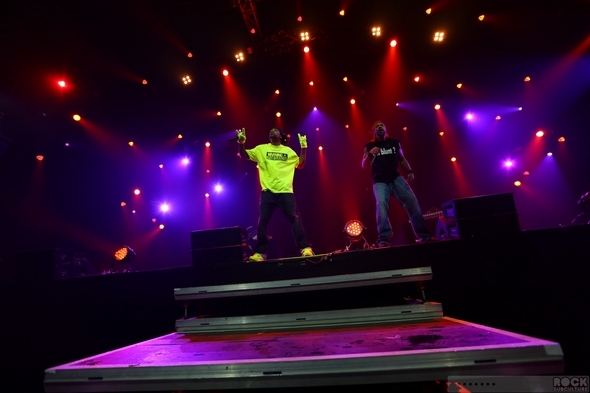 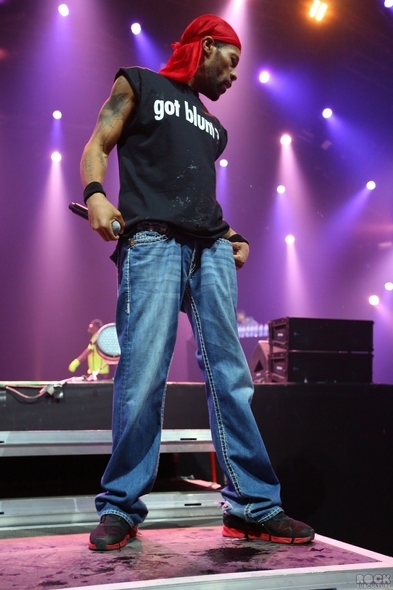 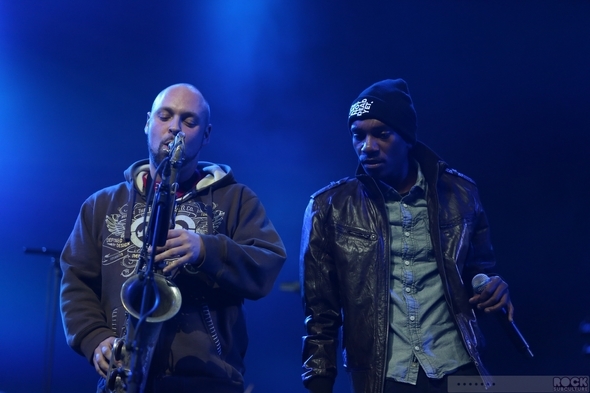 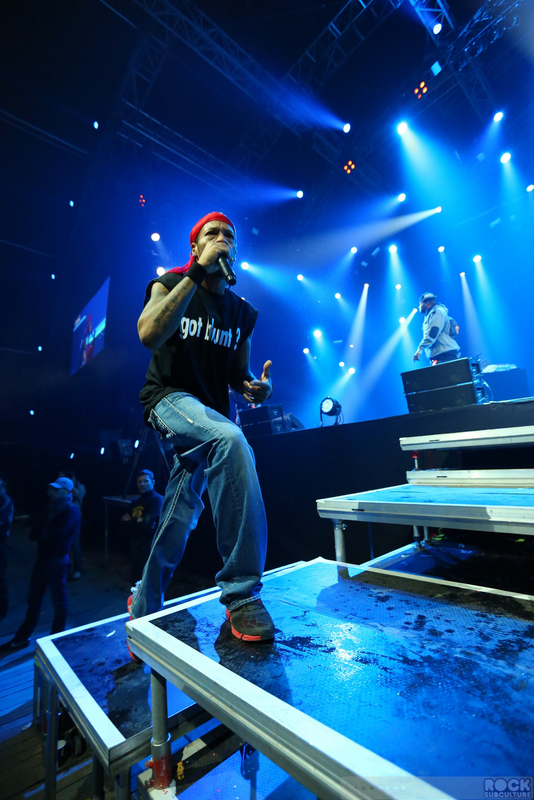 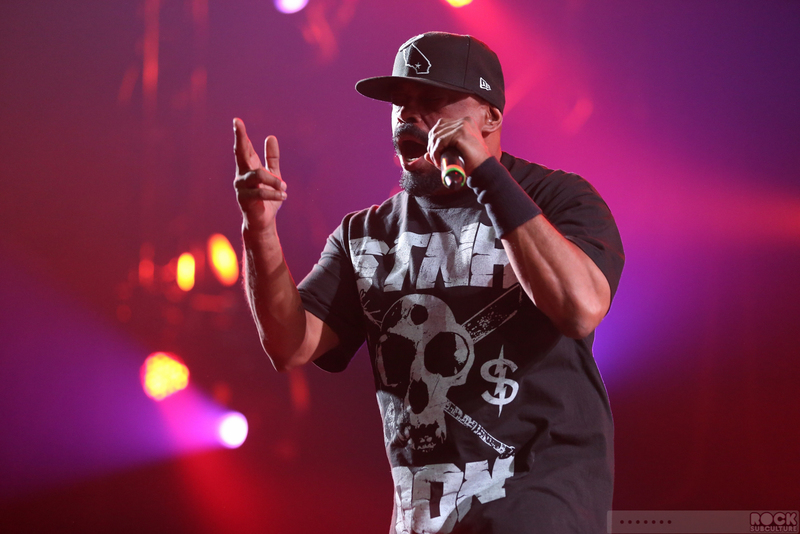 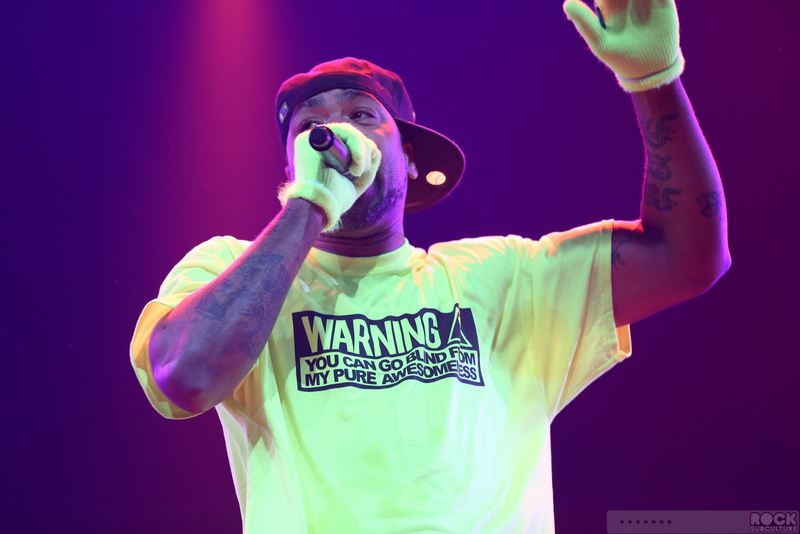 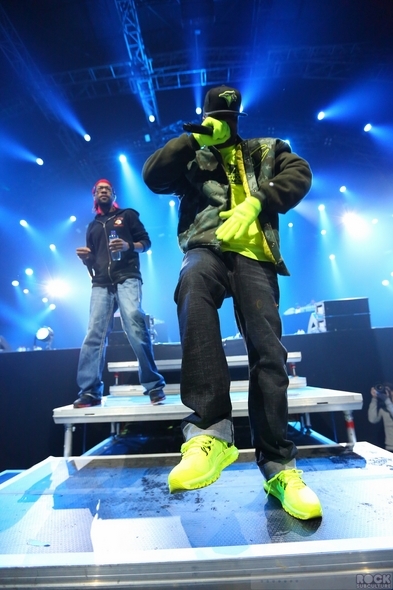 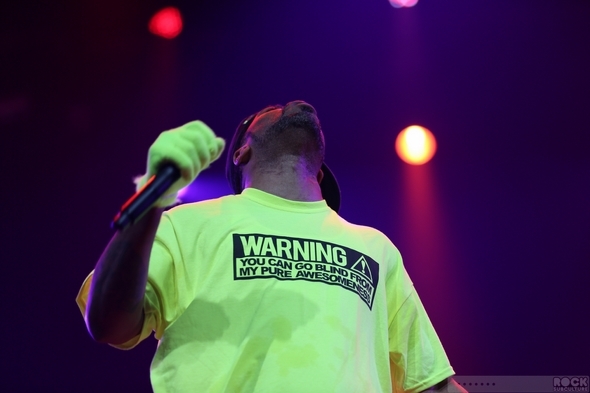 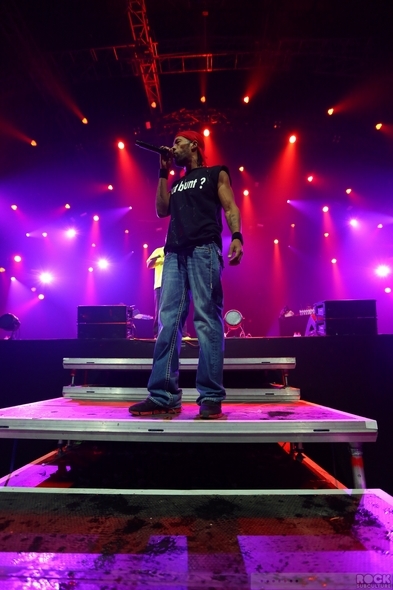 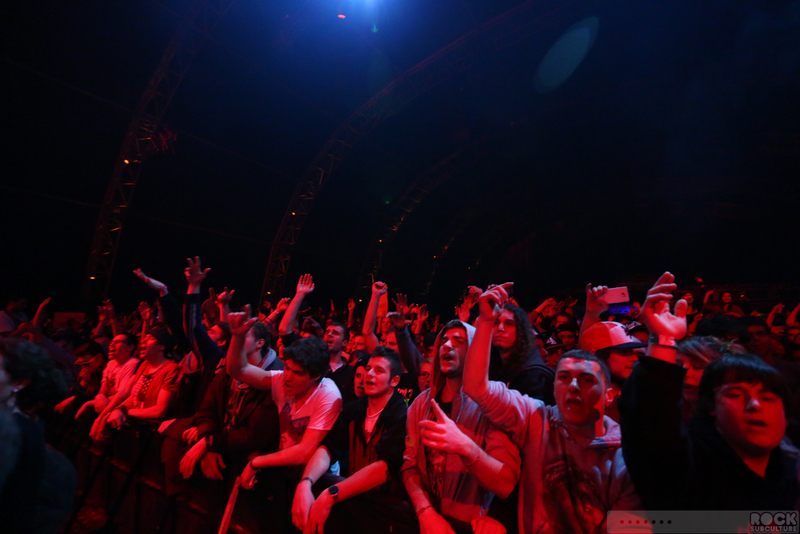 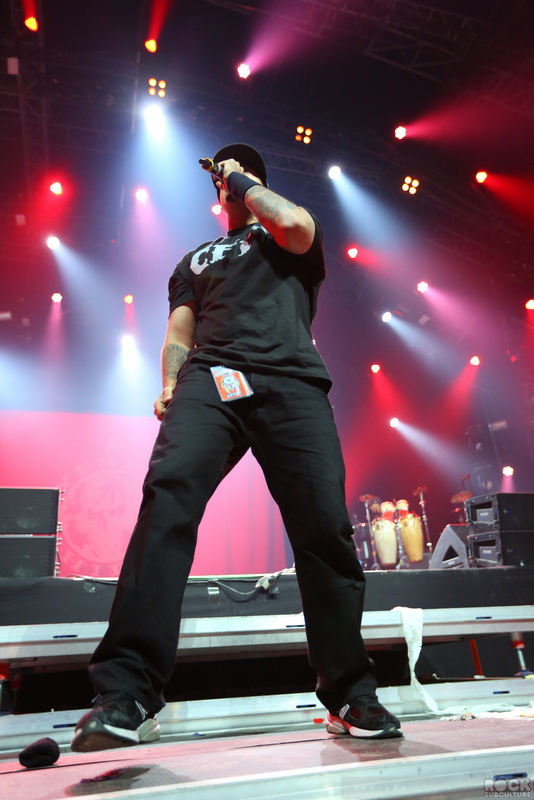 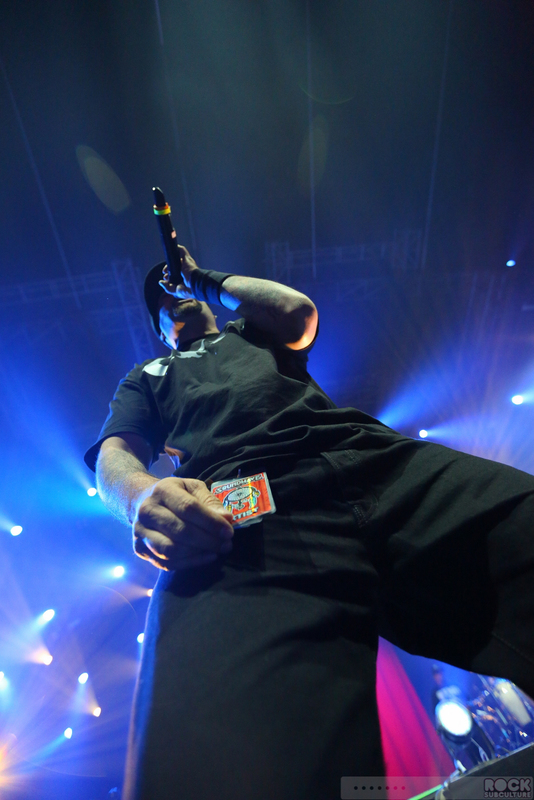 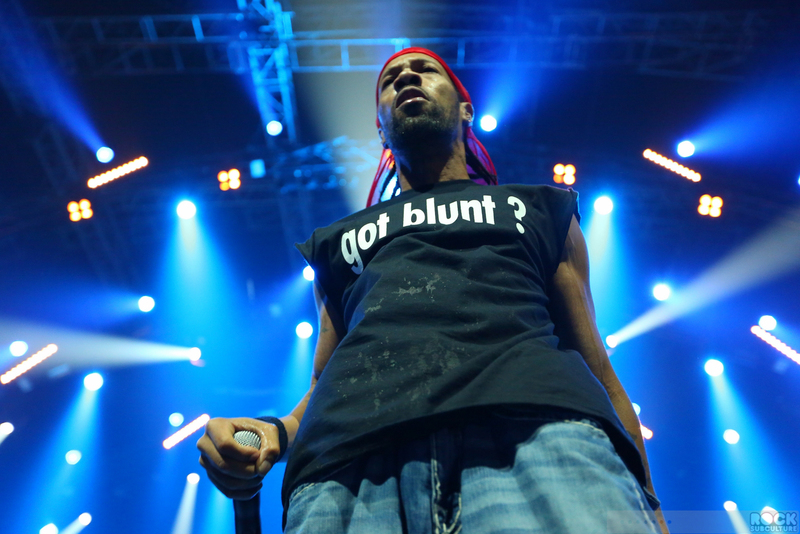 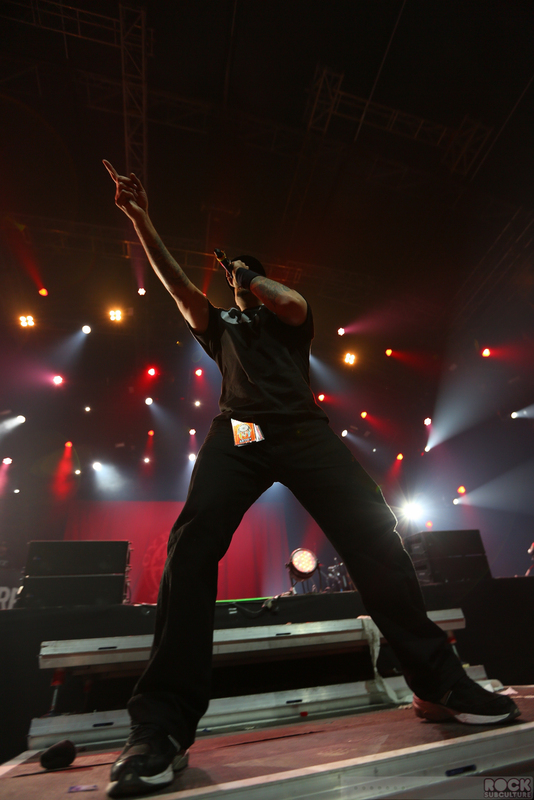 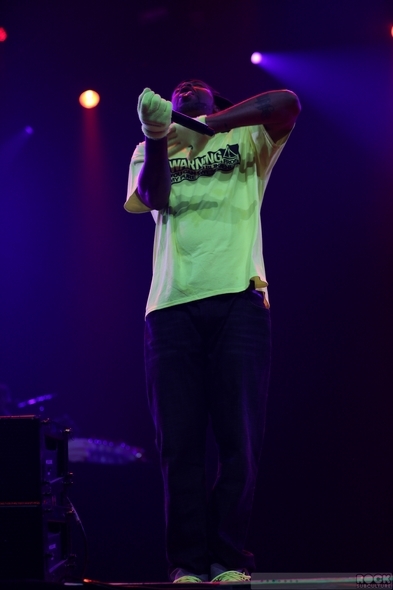 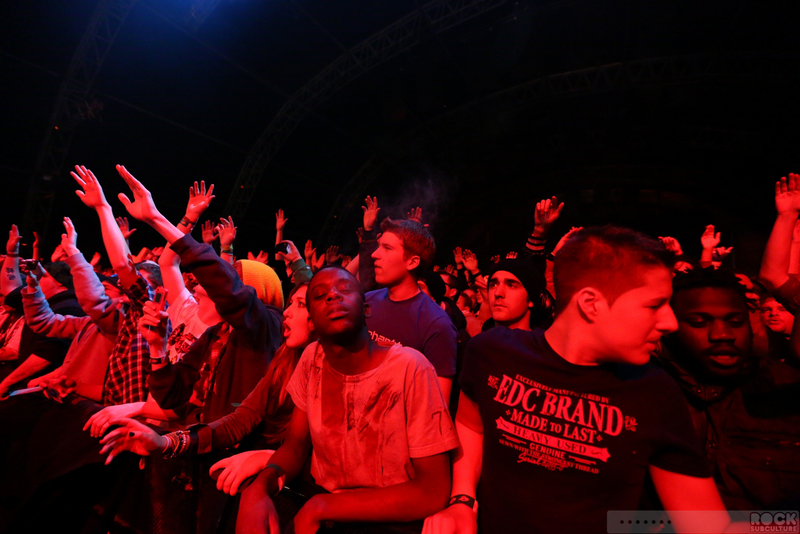 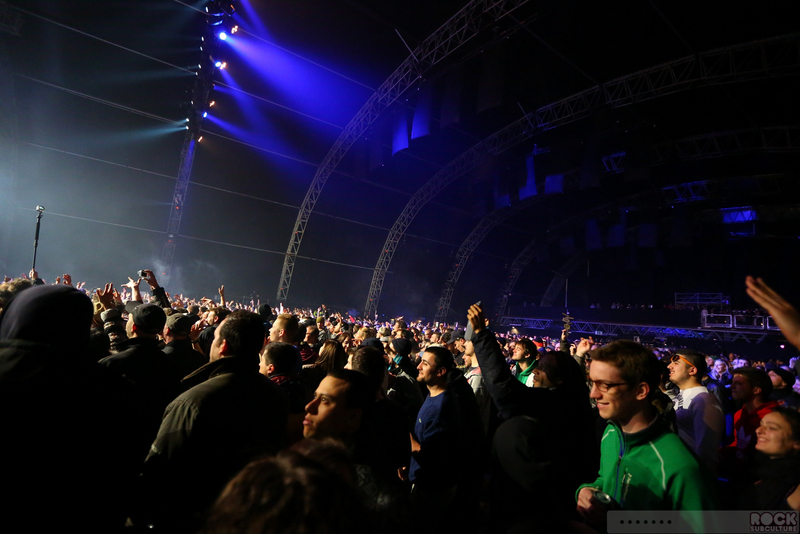 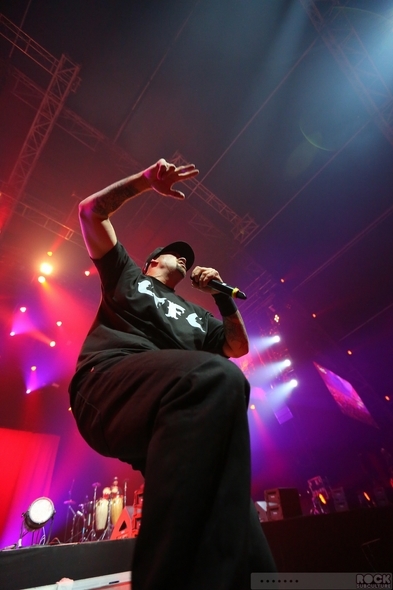 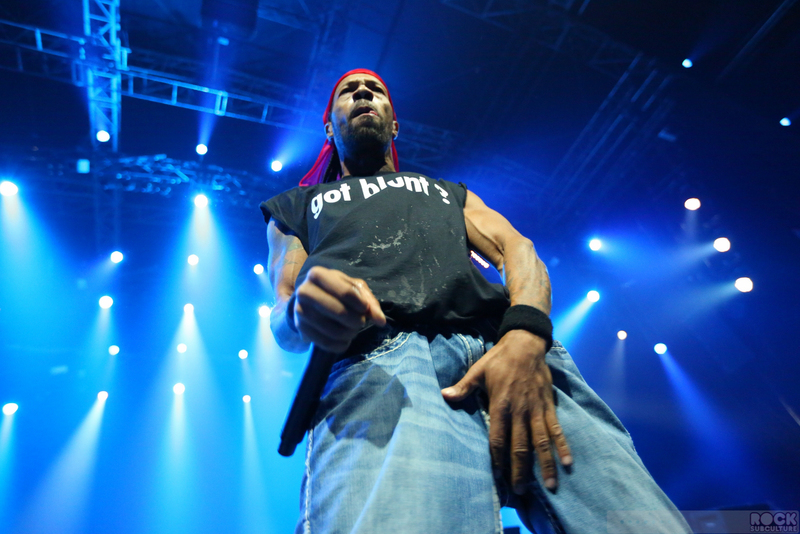 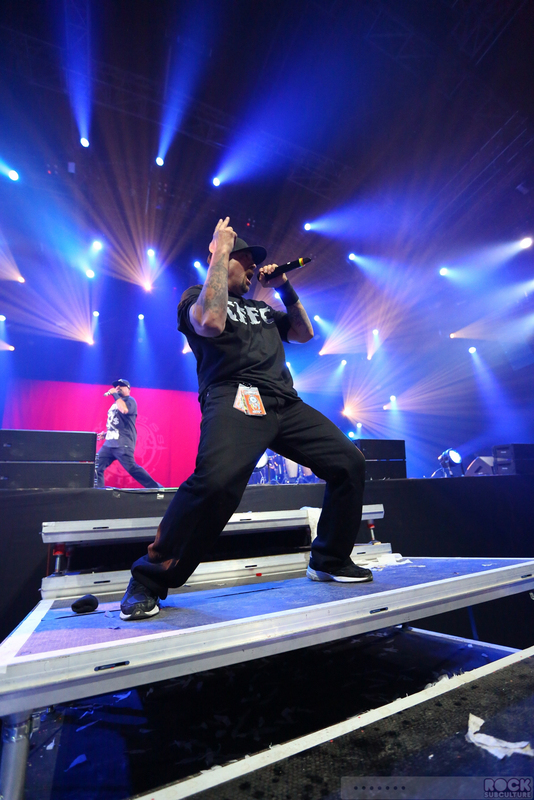 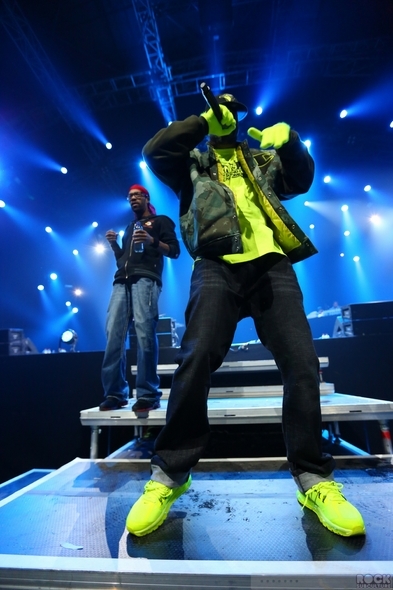 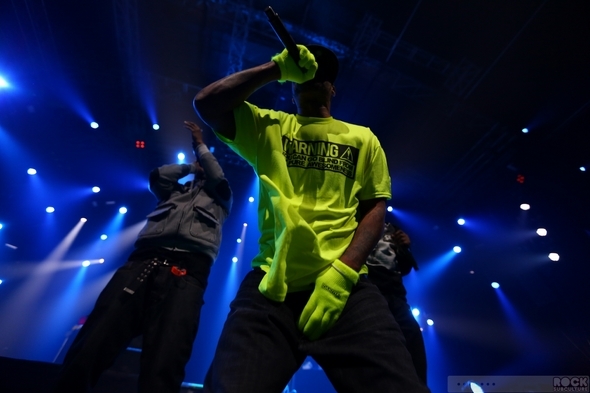 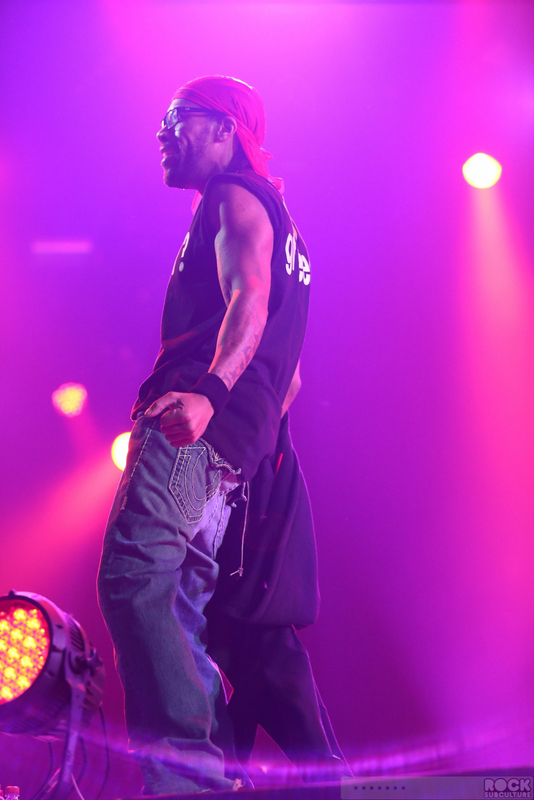 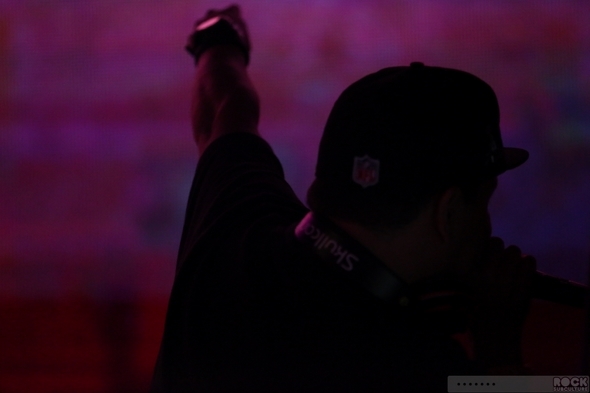 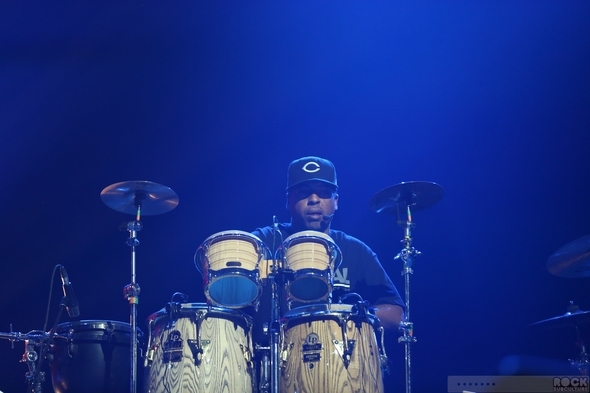 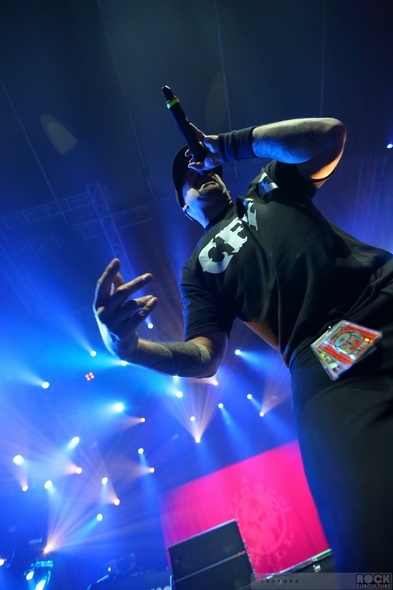 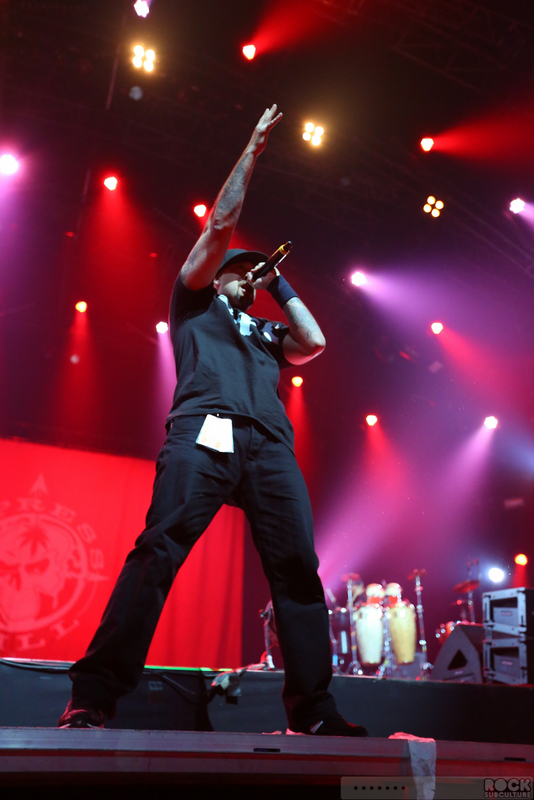 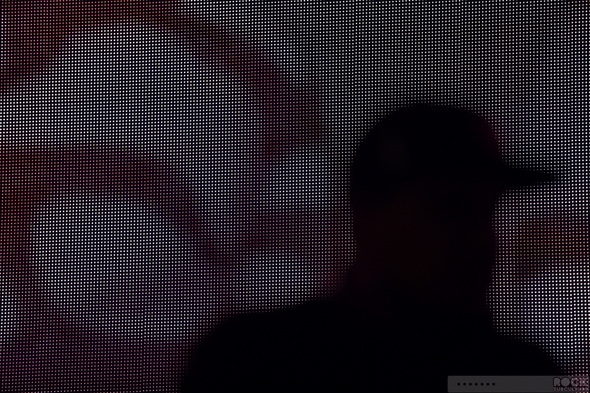 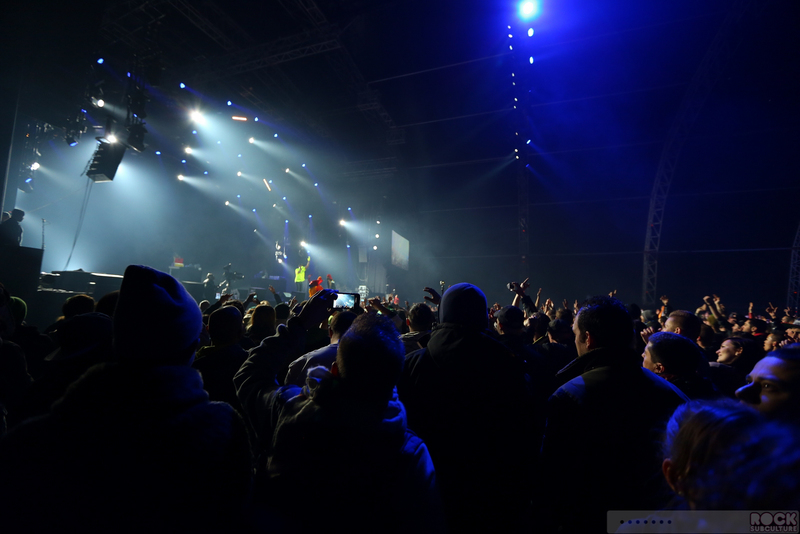 In fact, throughout the performance at Caprices Festival, Redman kept asking the crowd if they wanted to see a How High 2. 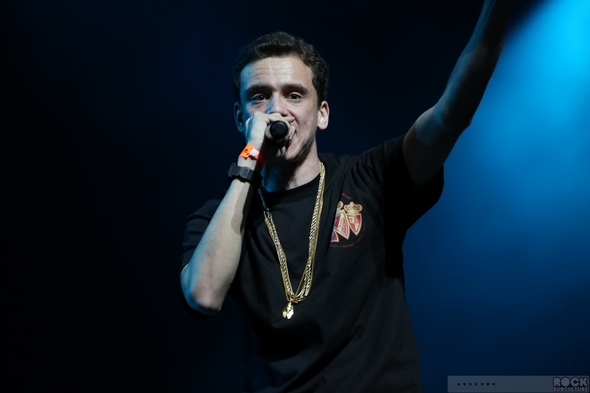 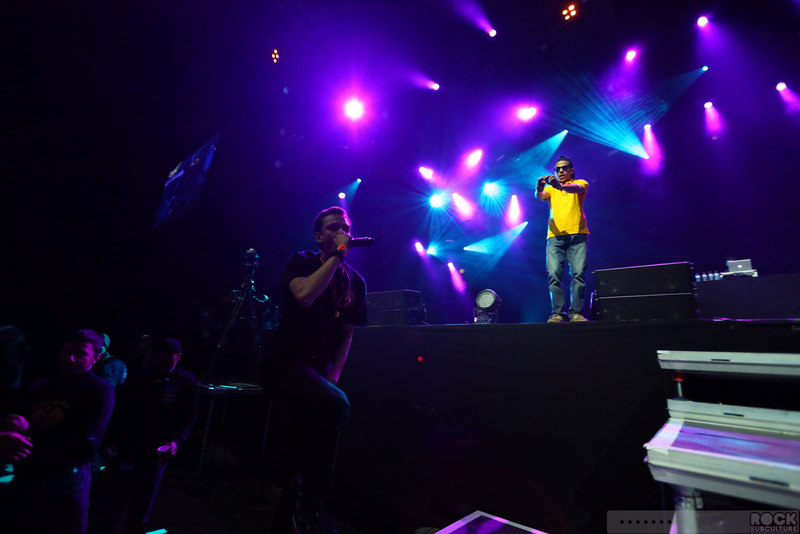 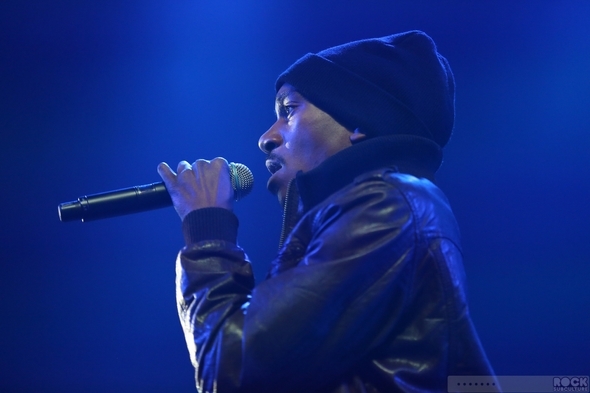 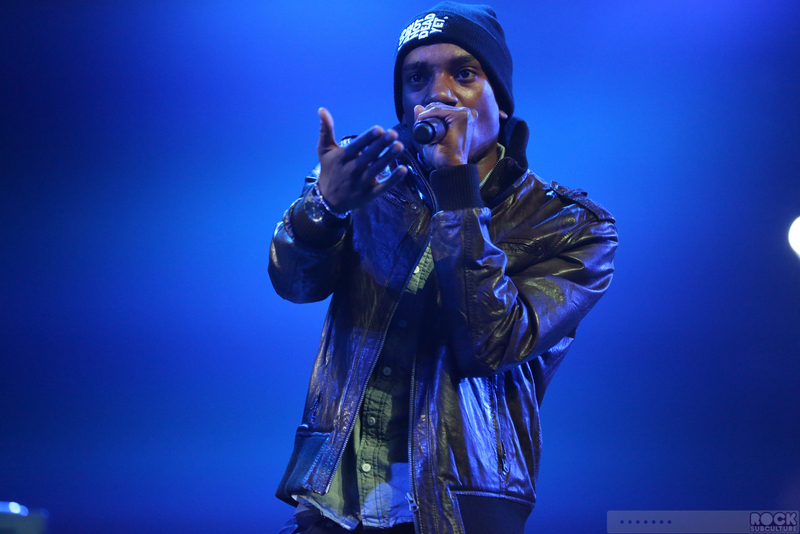 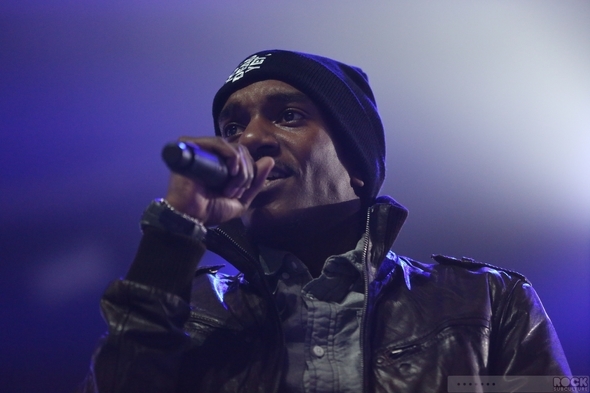 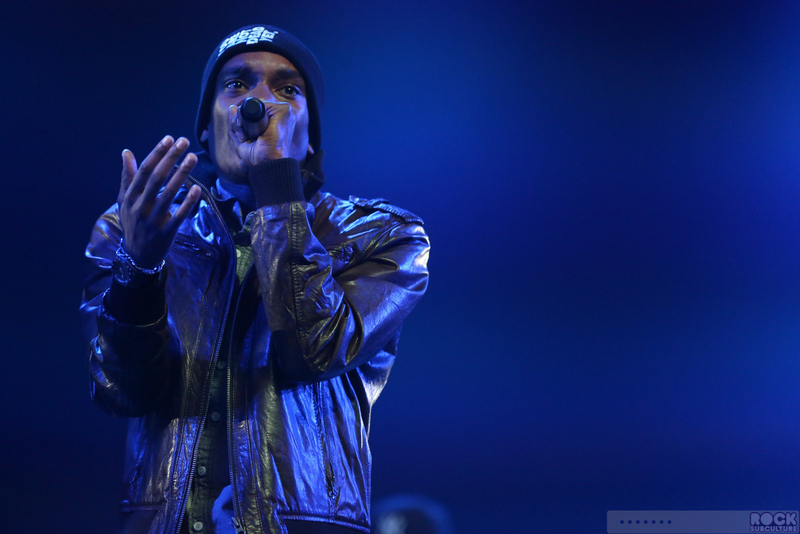 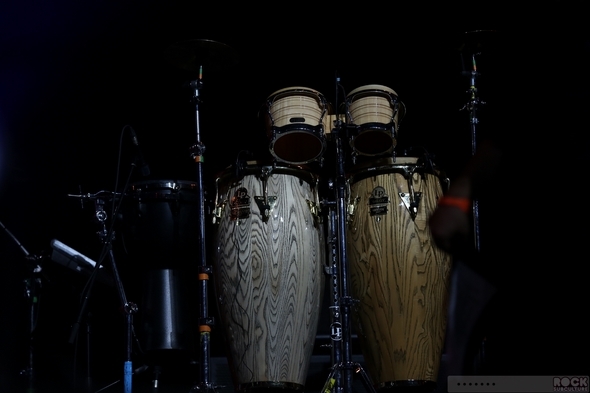 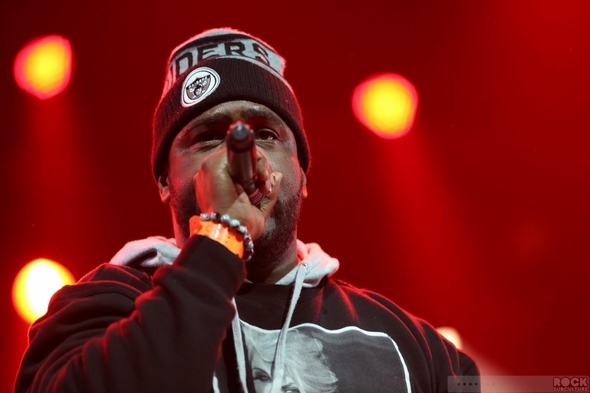 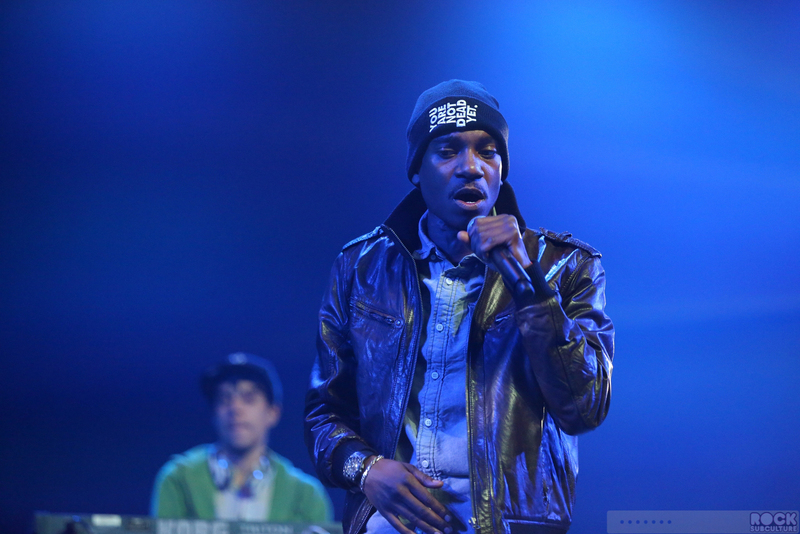 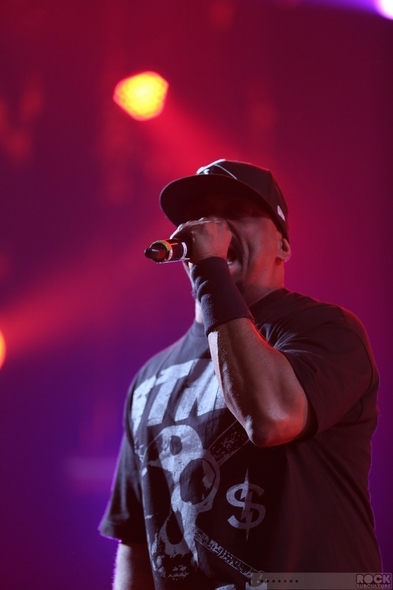 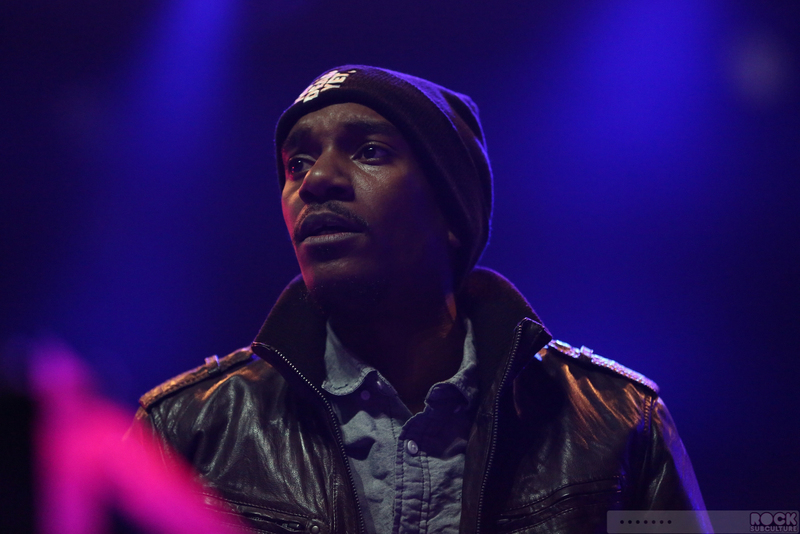 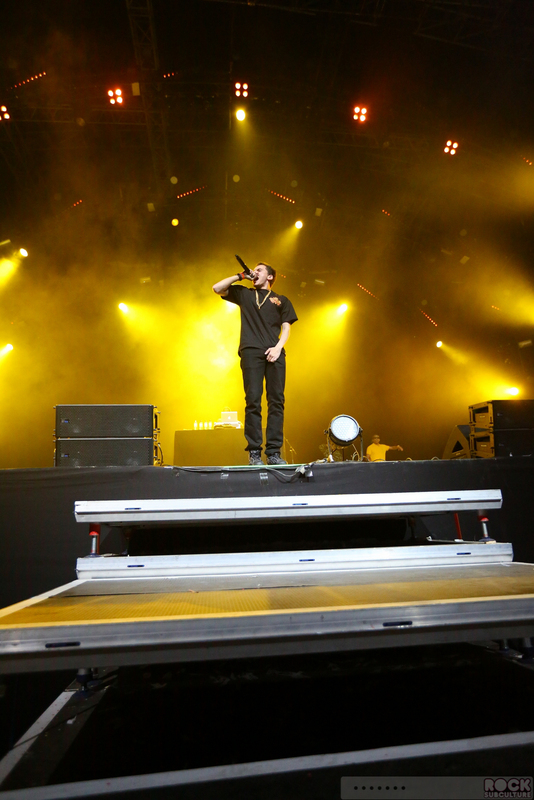 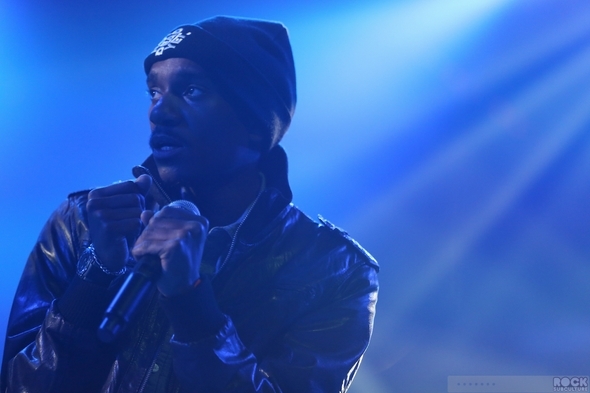 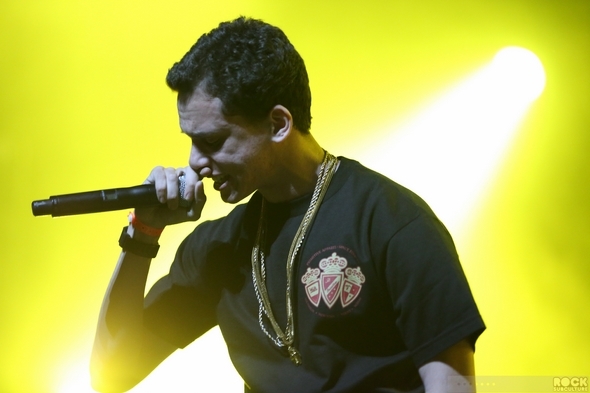 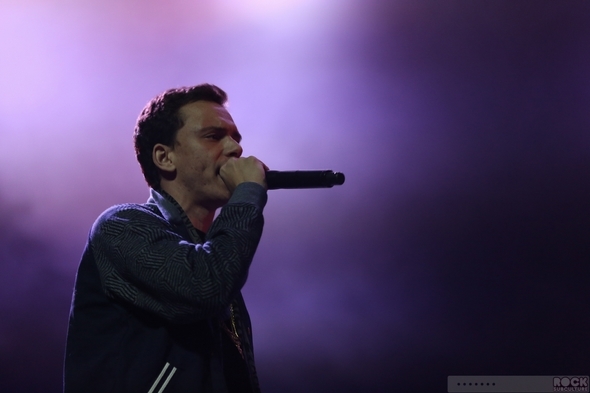 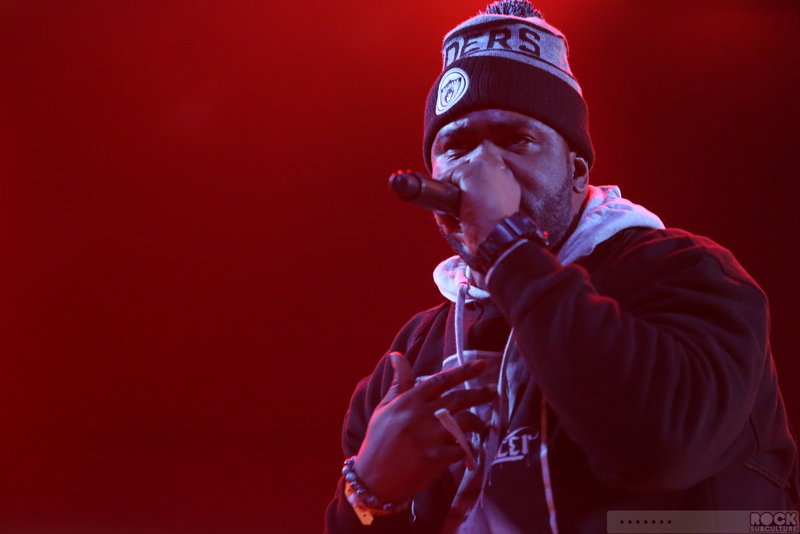 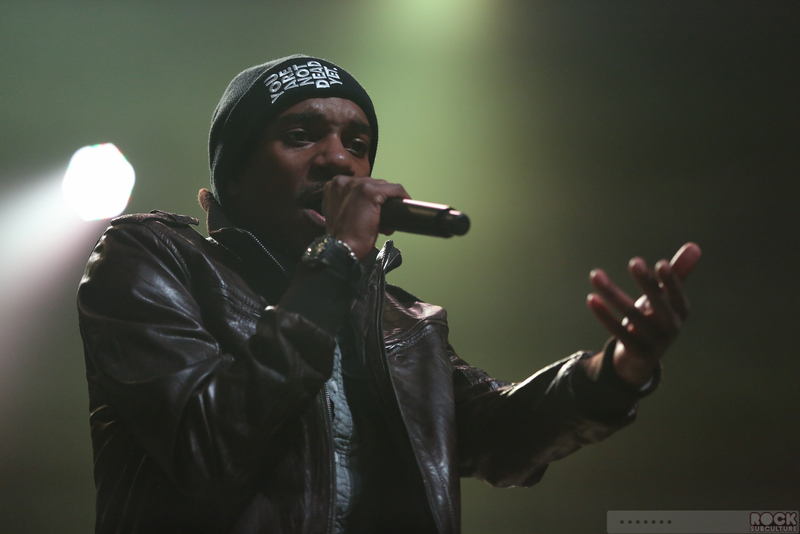 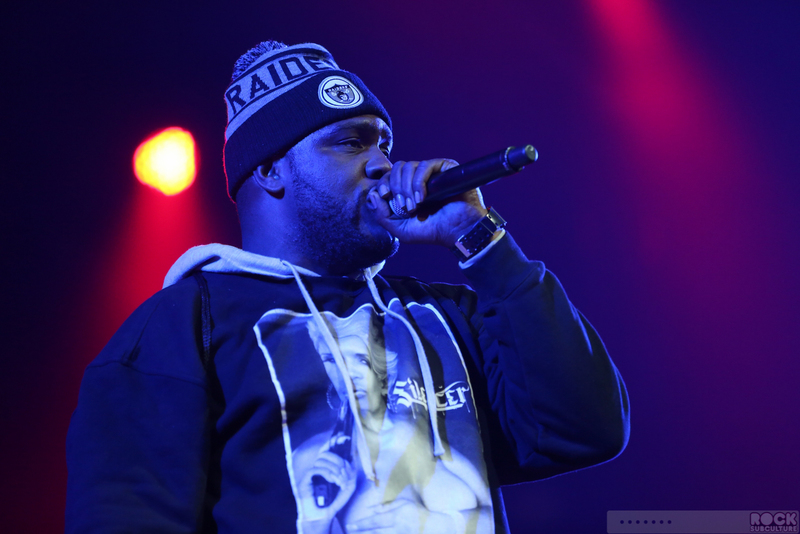 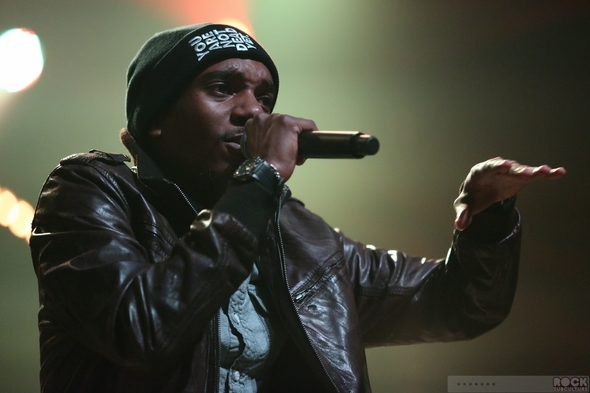 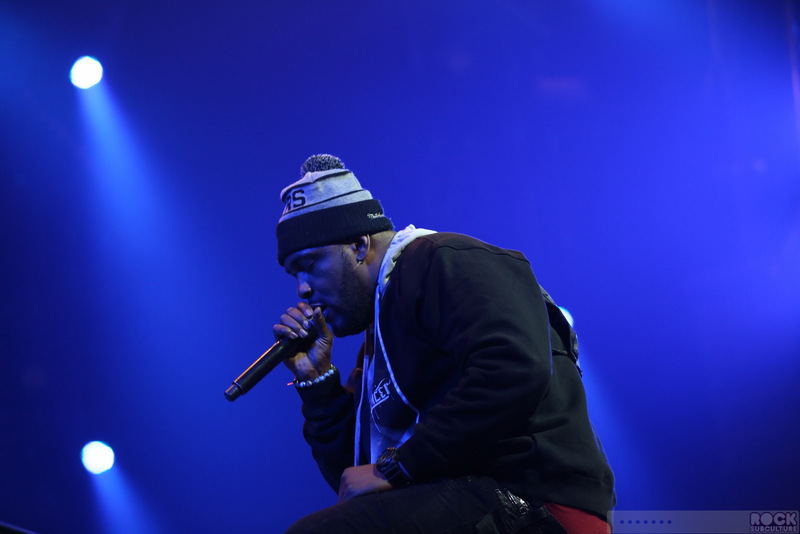 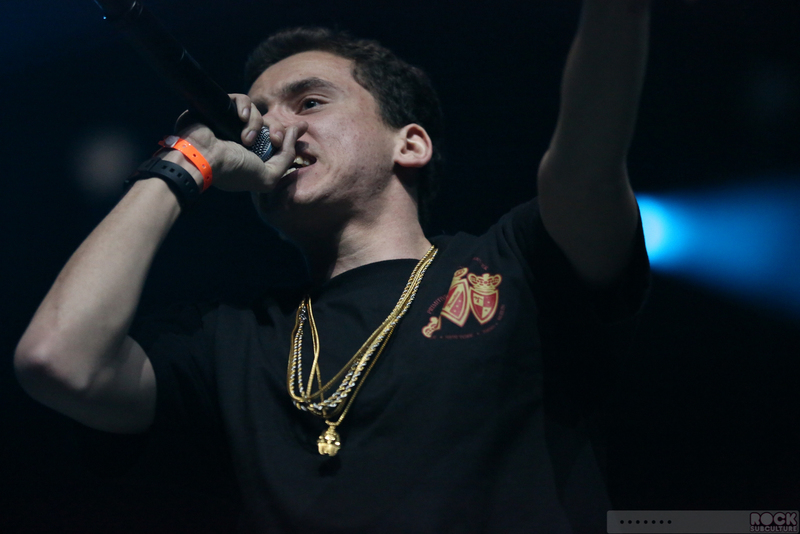 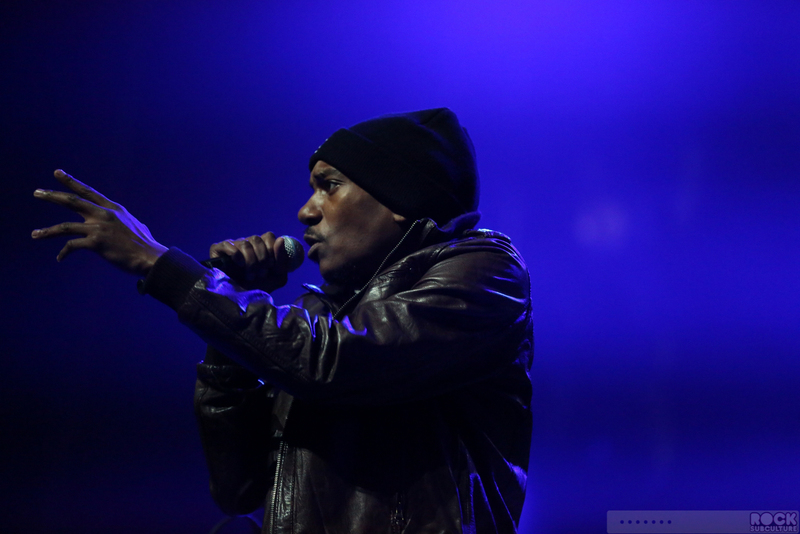 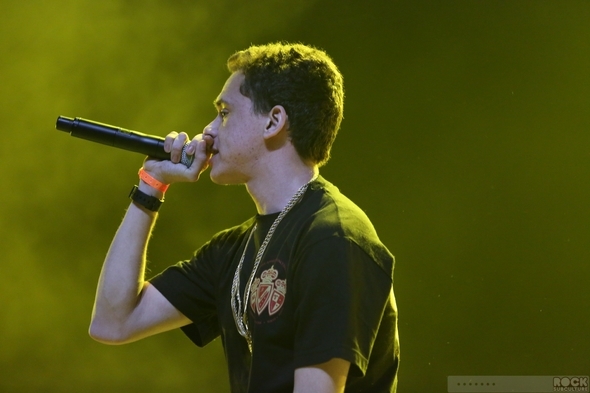 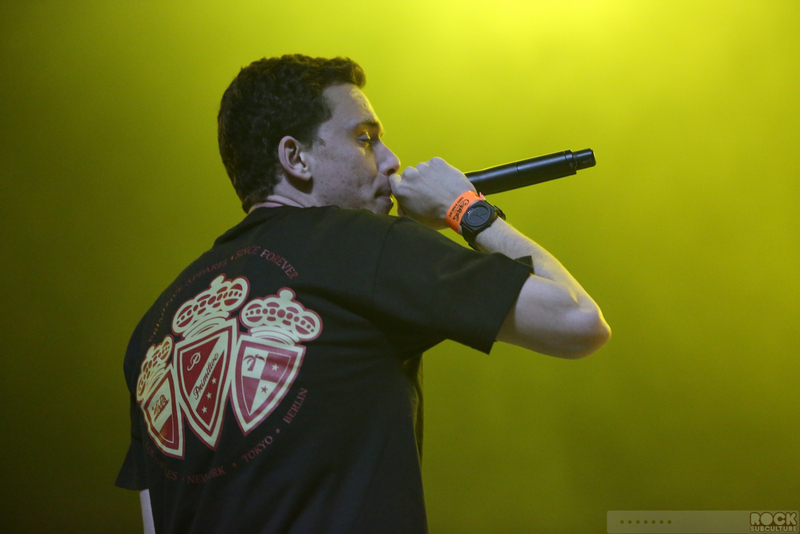 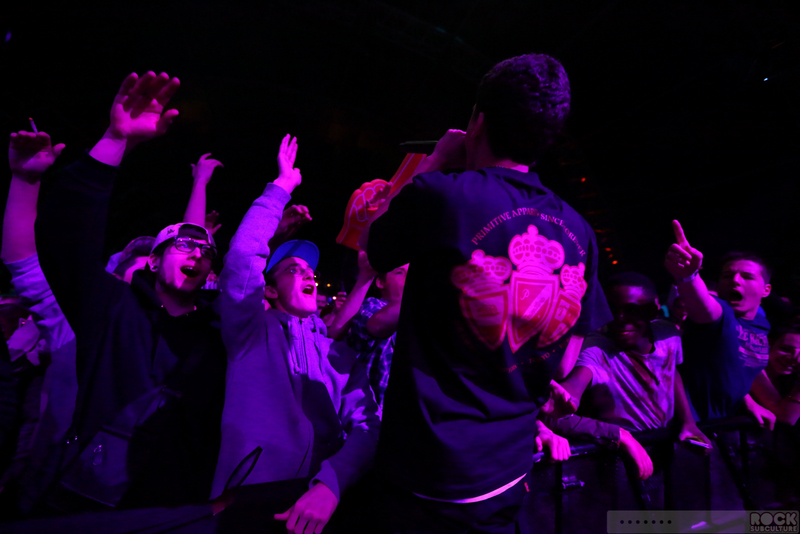 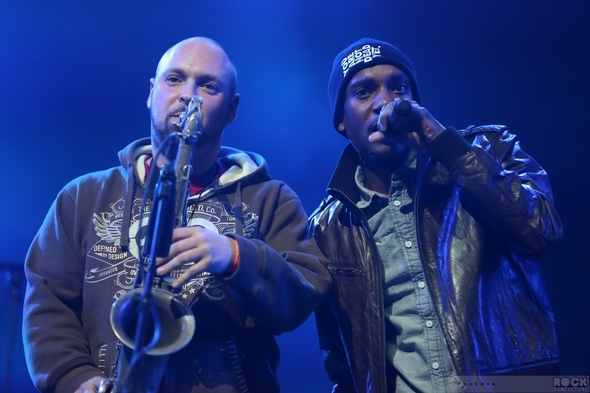 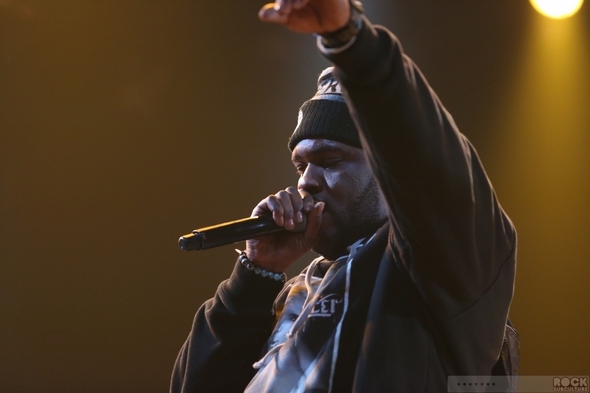 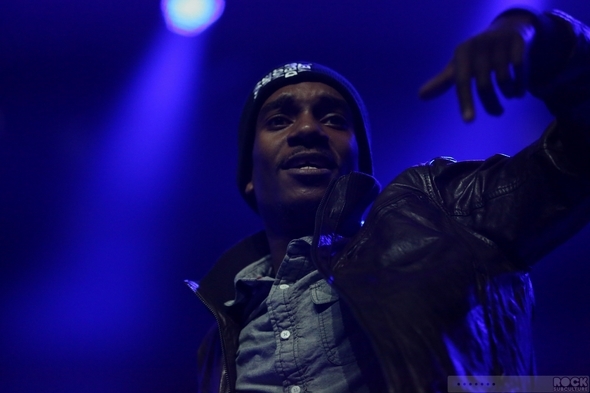 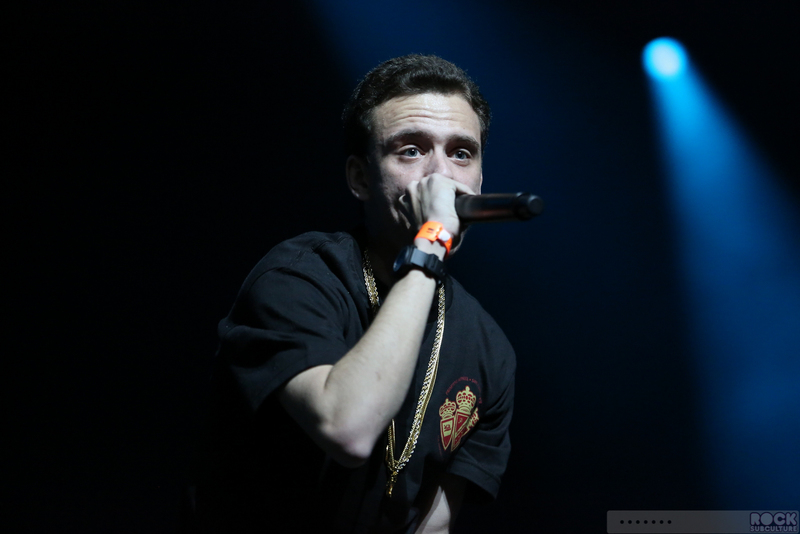 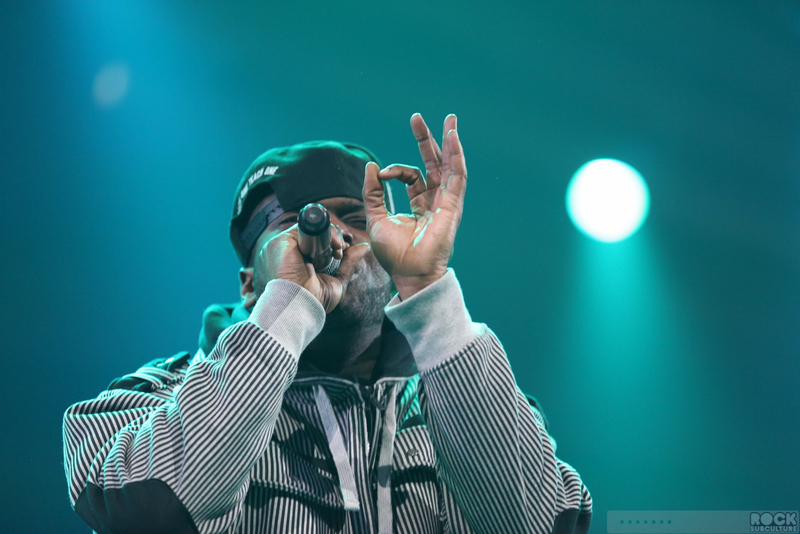 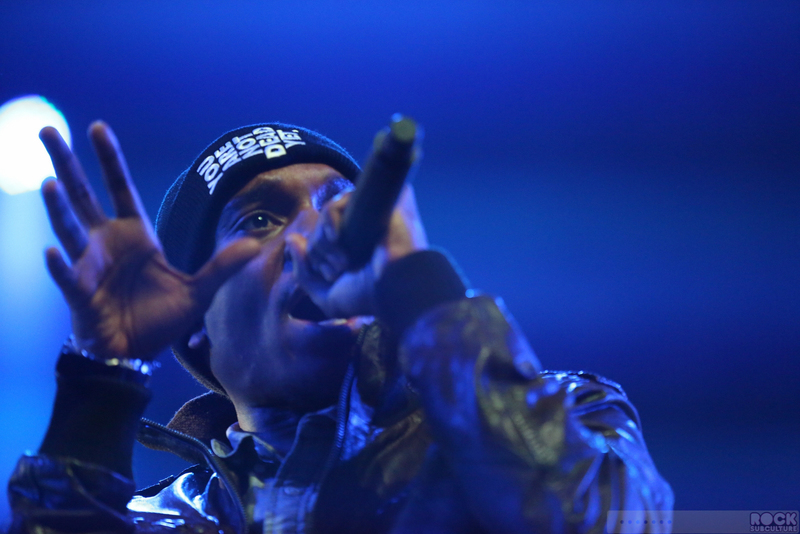 The rappers and hip hop artists are known for their propensity to supper weed/cannabis use and culture, and this wasn’t lost on the audience either, as puffs of smoke came up through the crowd and even the stage. 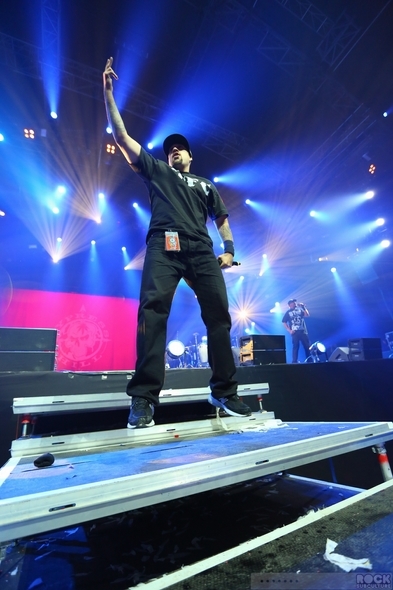 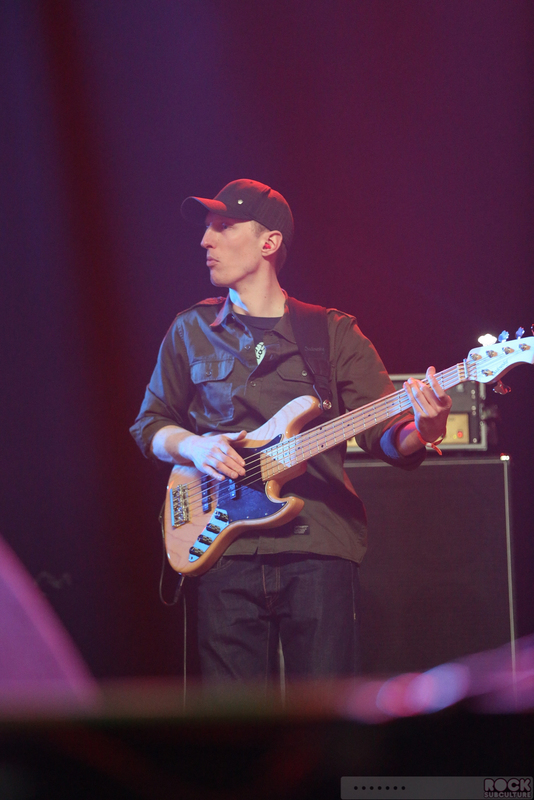 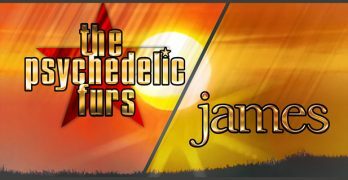 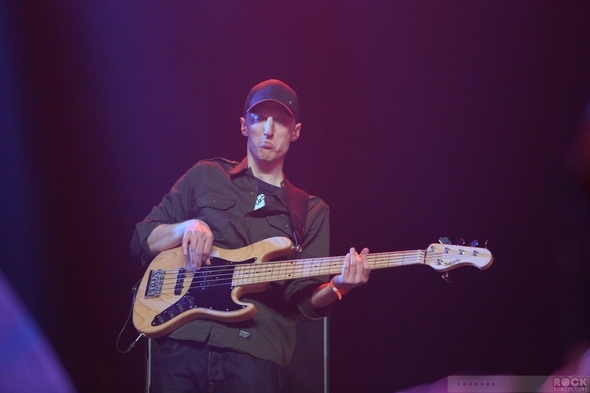 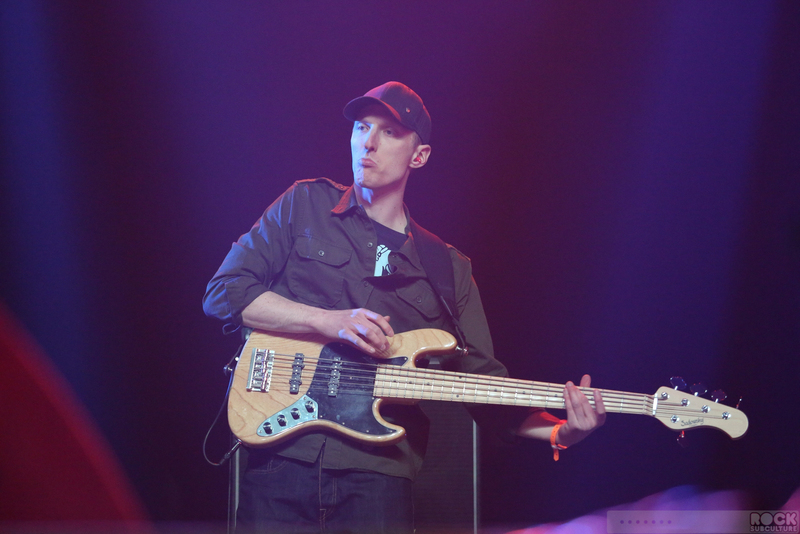 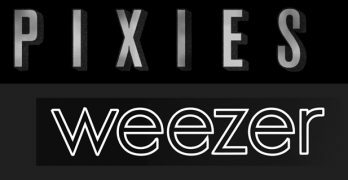 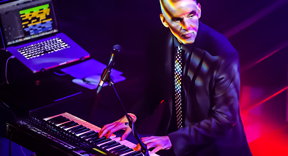 They really put on an amazing show and certainly filled the hall with fans, which I’m sure was gratifying to them, as they felt slighted for not being listed as a headliner act on the main poster for the festival (as discussed in the interview). 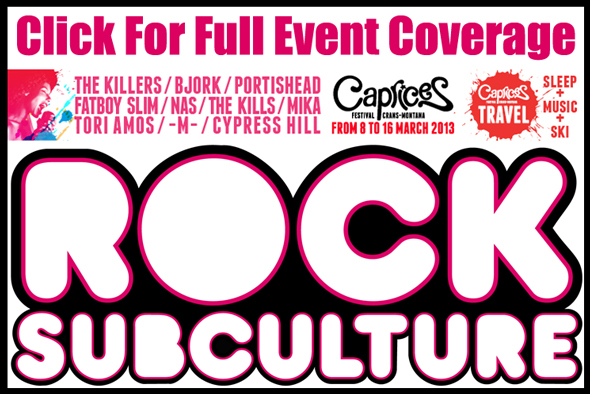 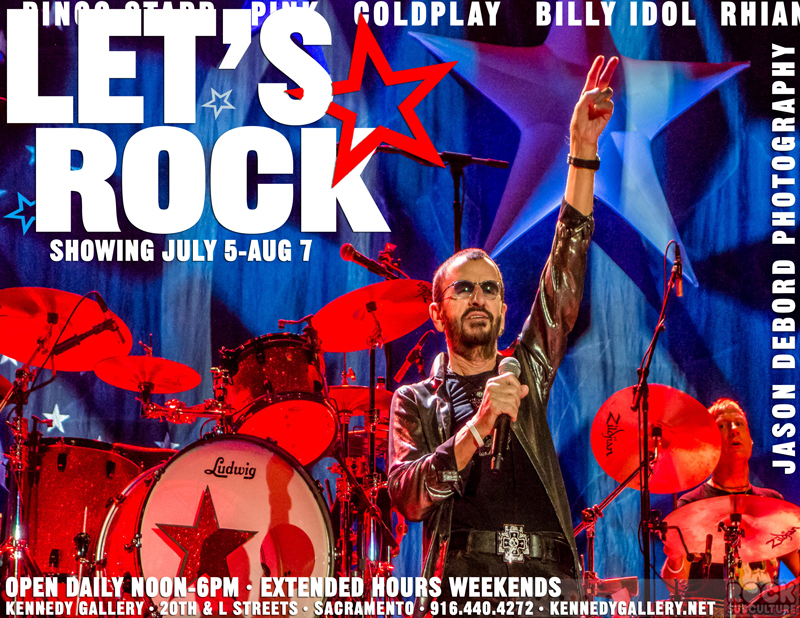 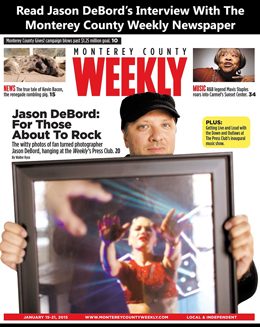 I did ask the festival about this, and their absence from the poster was not reflective of their lack of status as headliners (which they were viewed as by the festival) but more of a timing issue as to when they were brought on and when things went to press. 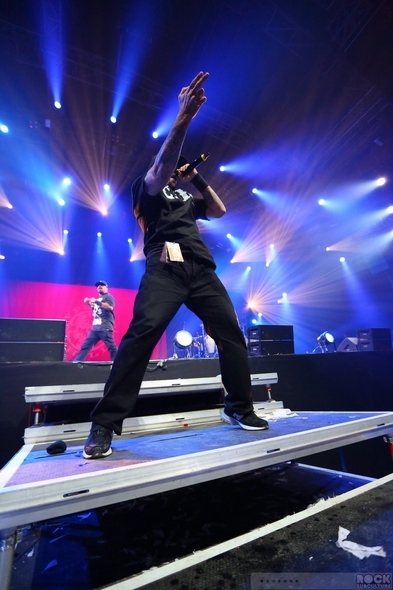 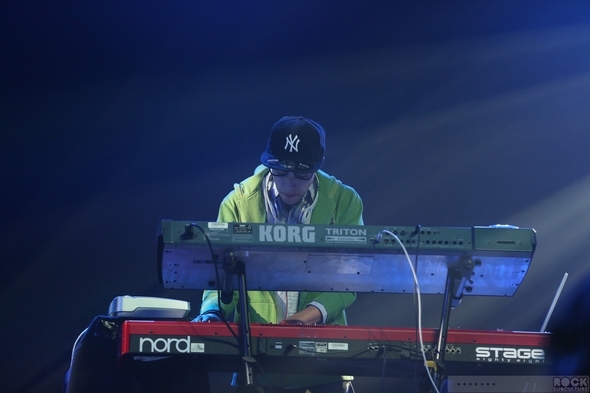 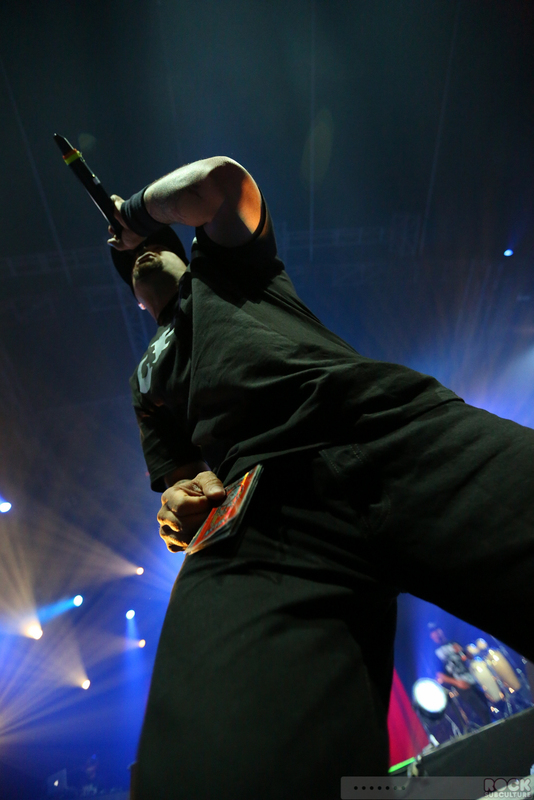 In either event, they certainly delivered the audience, and delivered to the audience an awesome show. 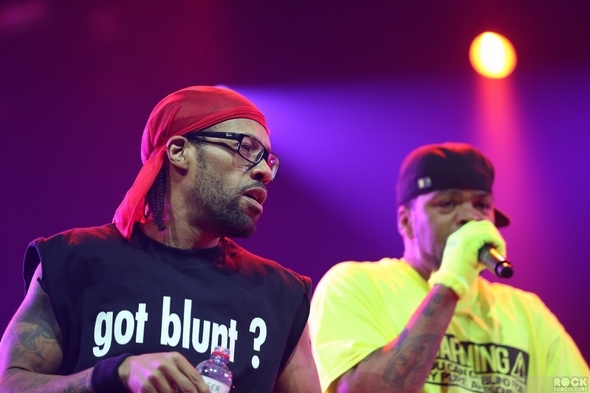 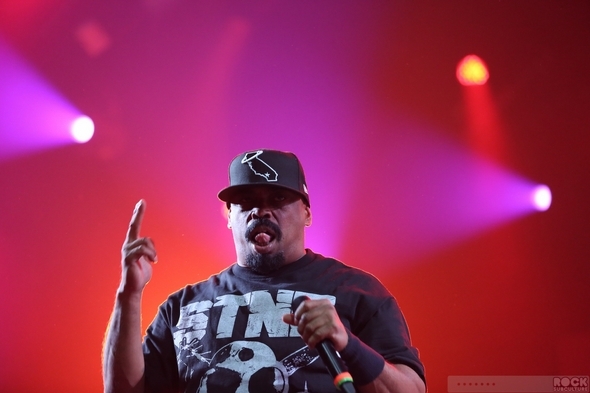 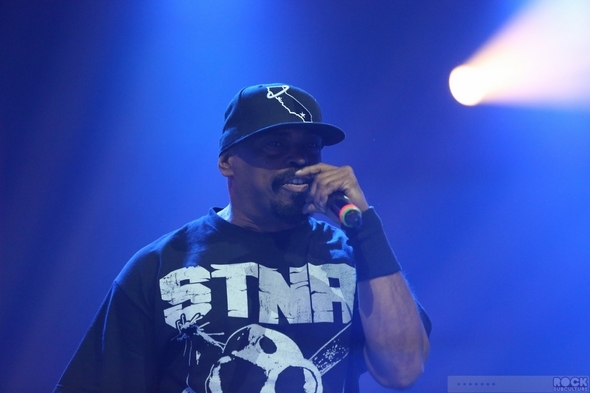 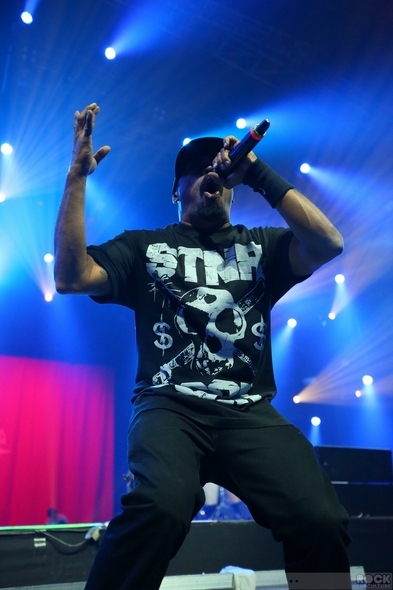 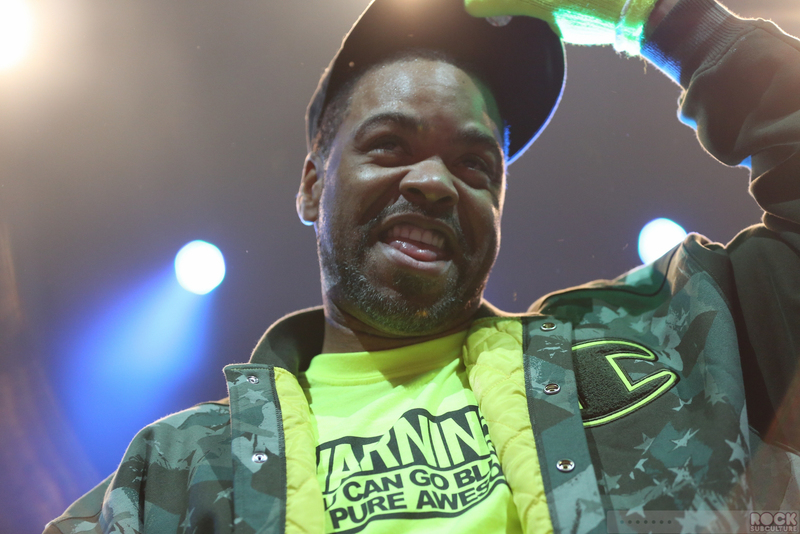 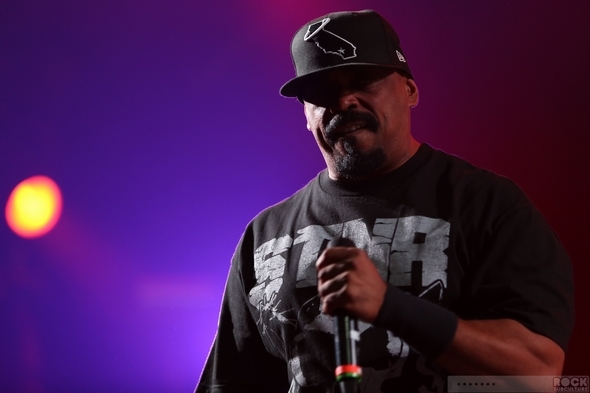 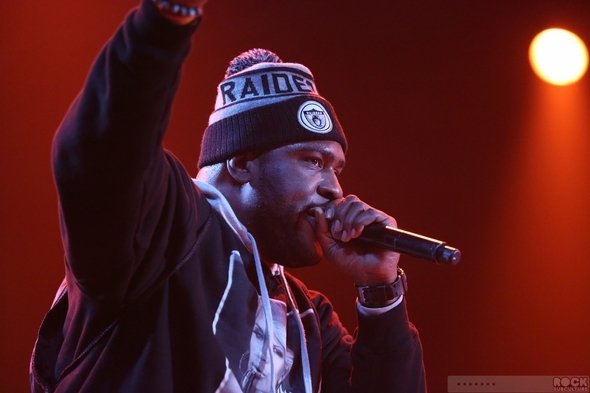 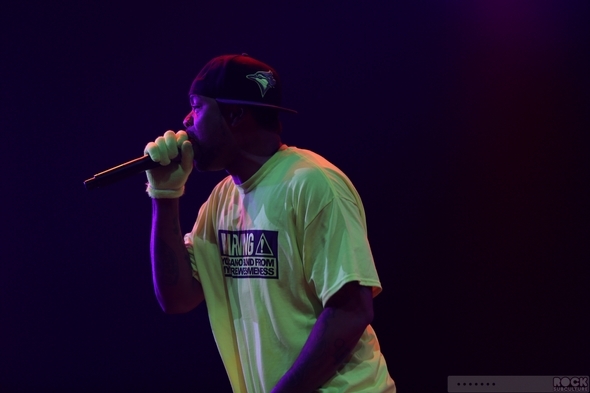 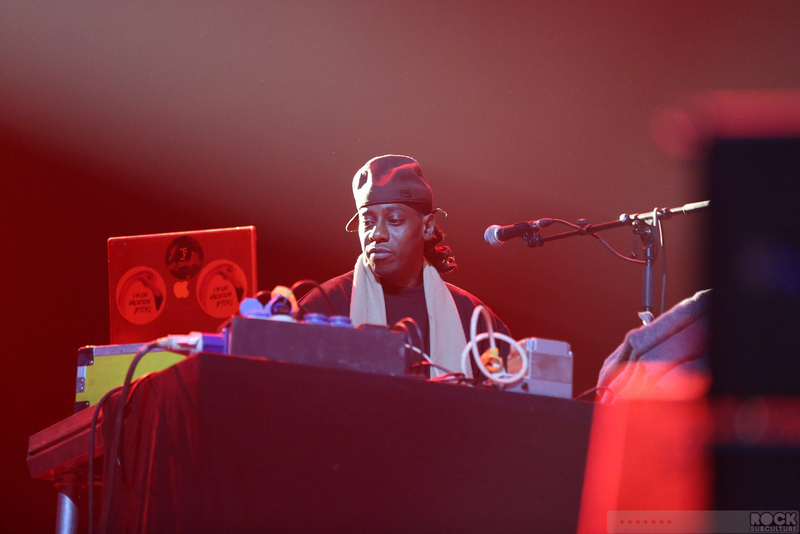 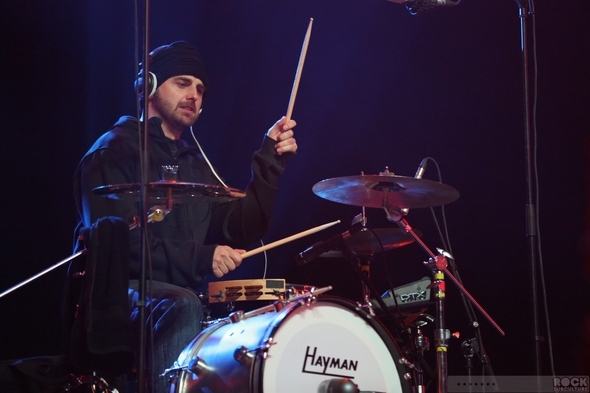 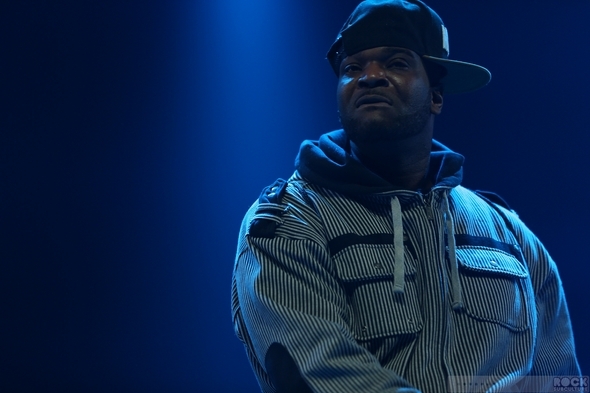 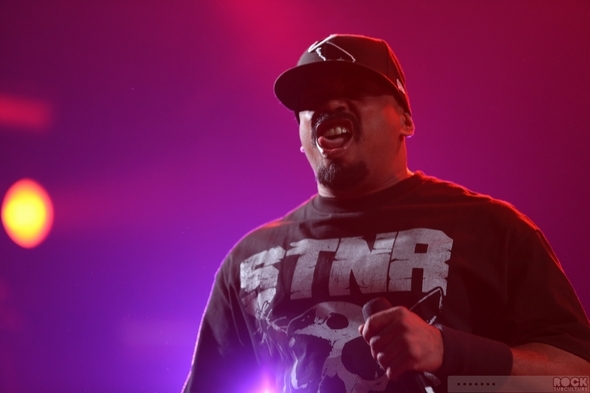 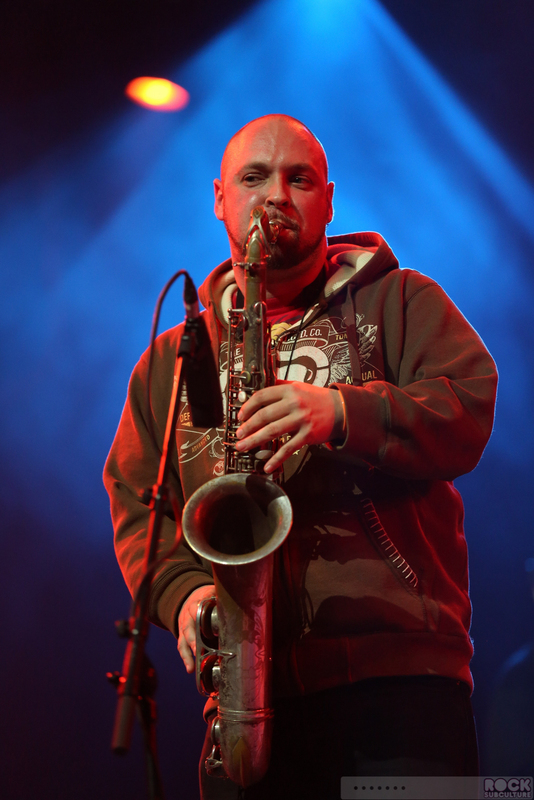 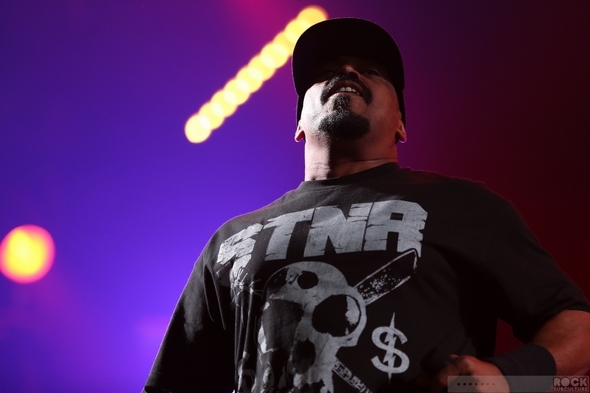 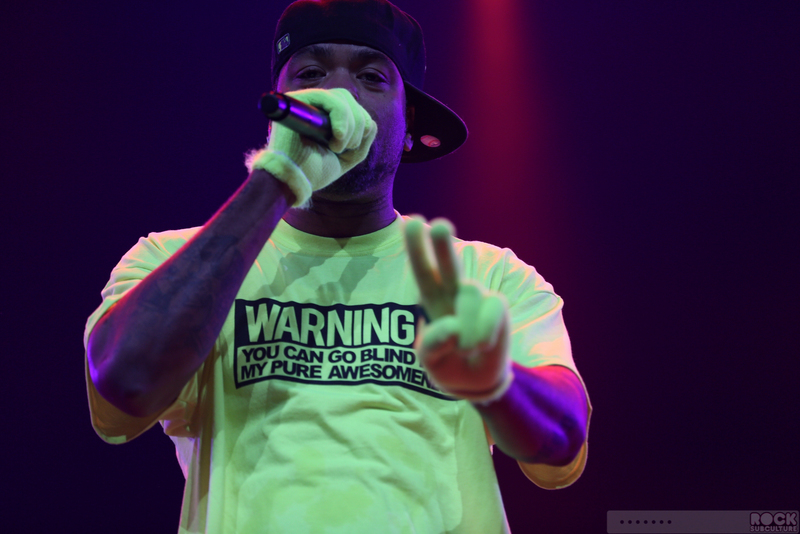 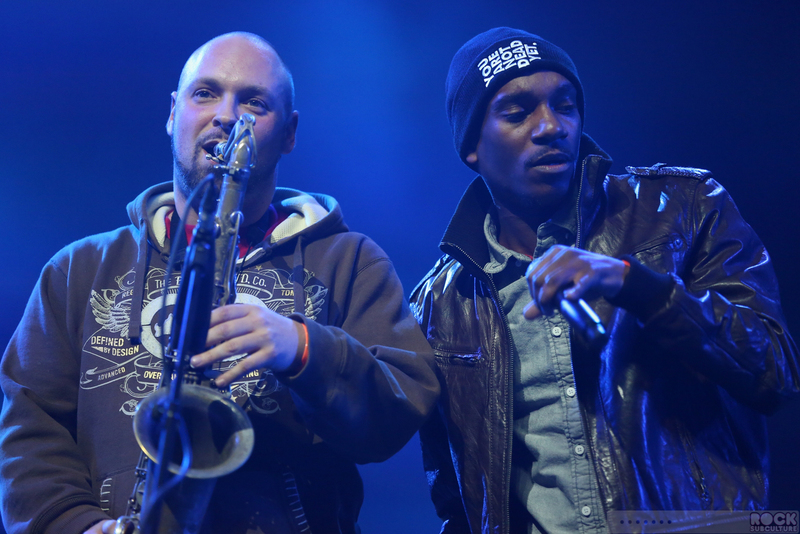 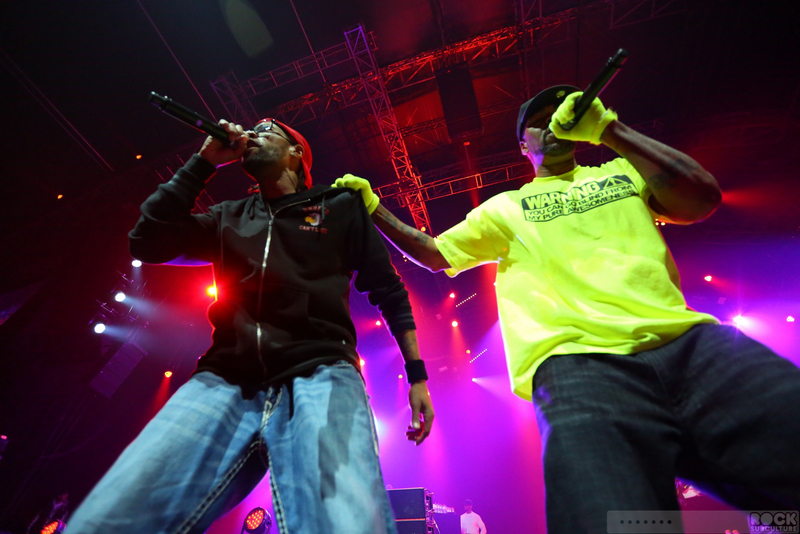 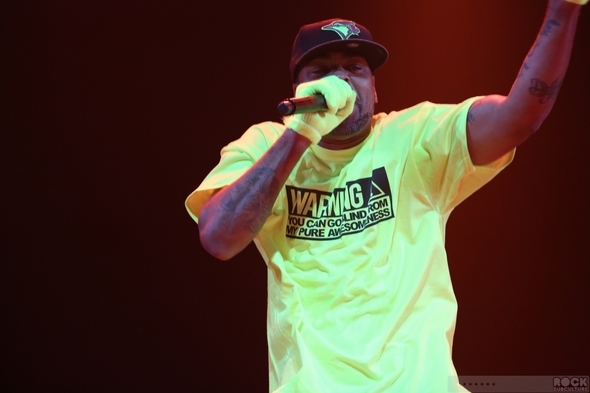 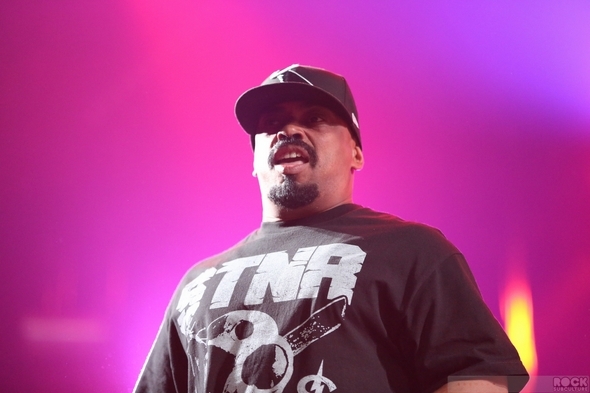 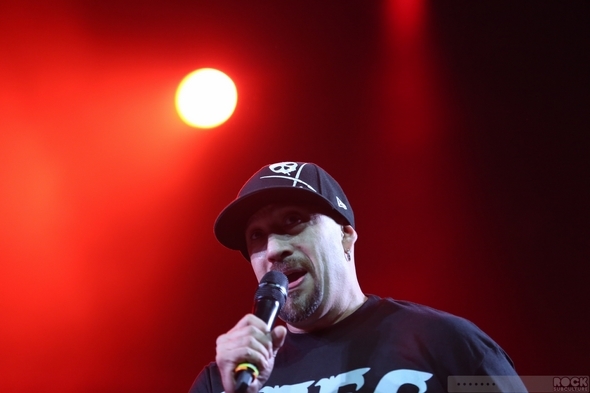 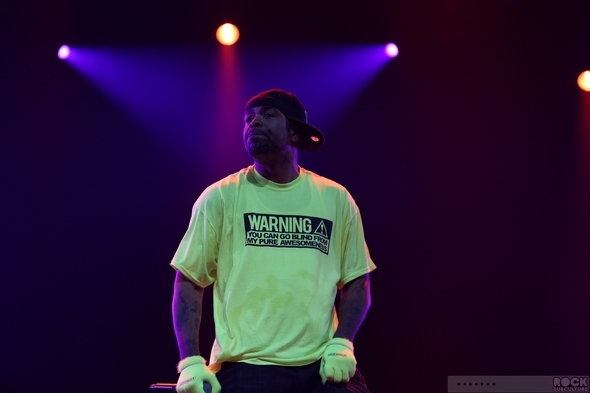 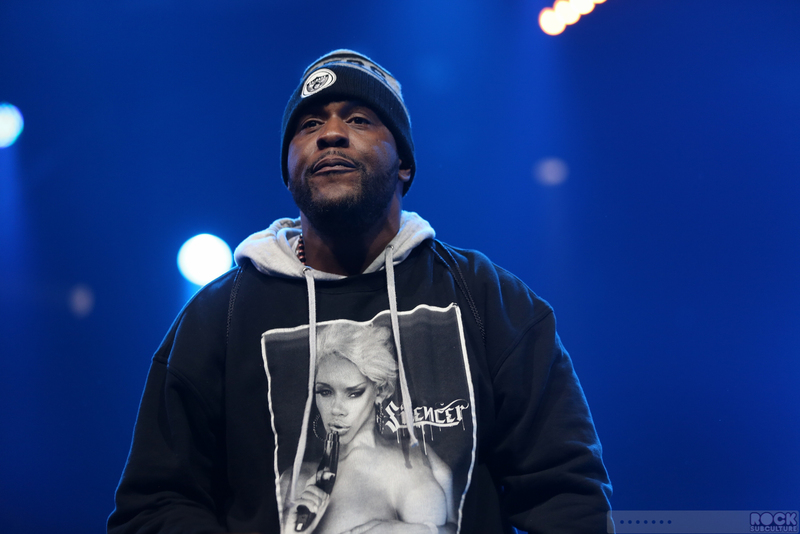 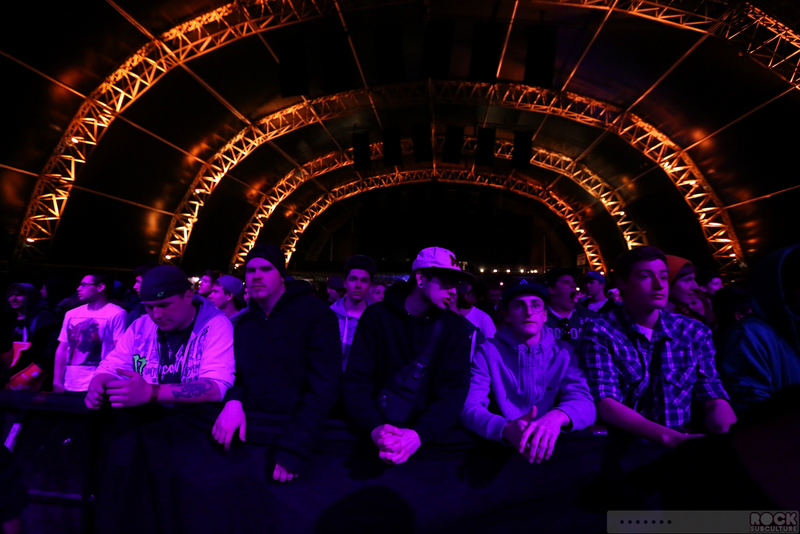 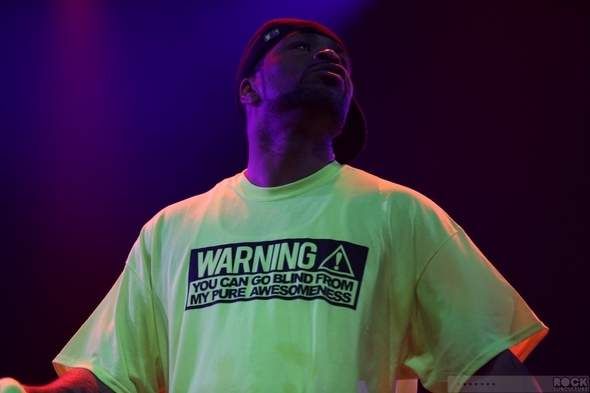 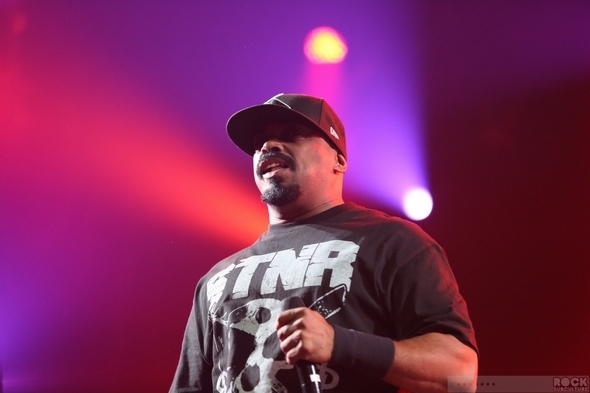 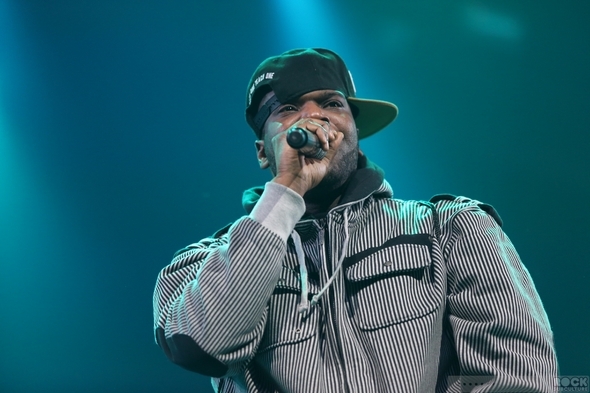 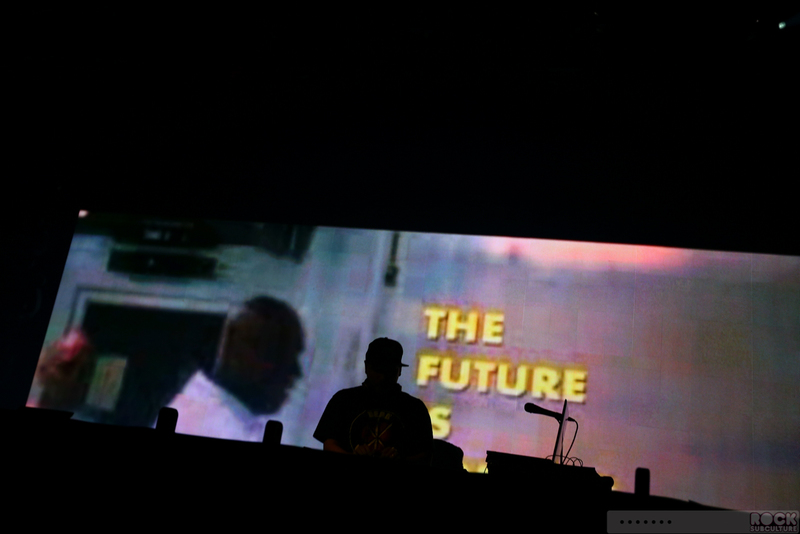 From my estimation, though both share a penchant for marijuana, Method Man and Redman and Cyrpess Hill that followed each seemed to have some of their own contingent within the audience, so for sure I would see them as co-headliners. 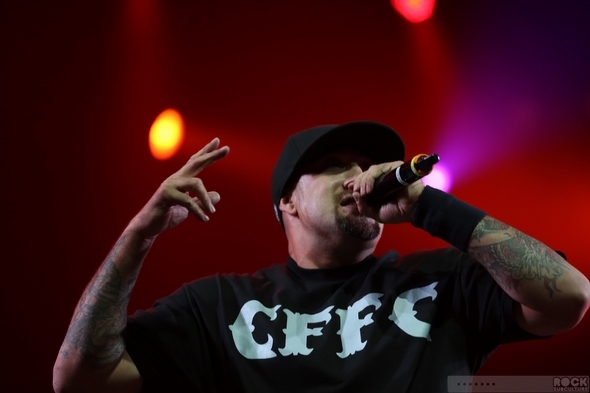 Cypress Hill is a very popular hip hop group from California, and they Cuban-American/Latino group has some over 18 million albums worldwide. Their first eponymous album debuted the same year I graduated high school – 1991 – so I remember that they were quite a hit right from the outset, and that was a time of significant shift in the music industry, as Nirvana’s Nevermind came out the same year, and while the two styles of music are very different from one another, both marked a shift away from the smooth and clean sounds of 80s New Wave and electronic music toward more raw sounds as we moved into the 90s. 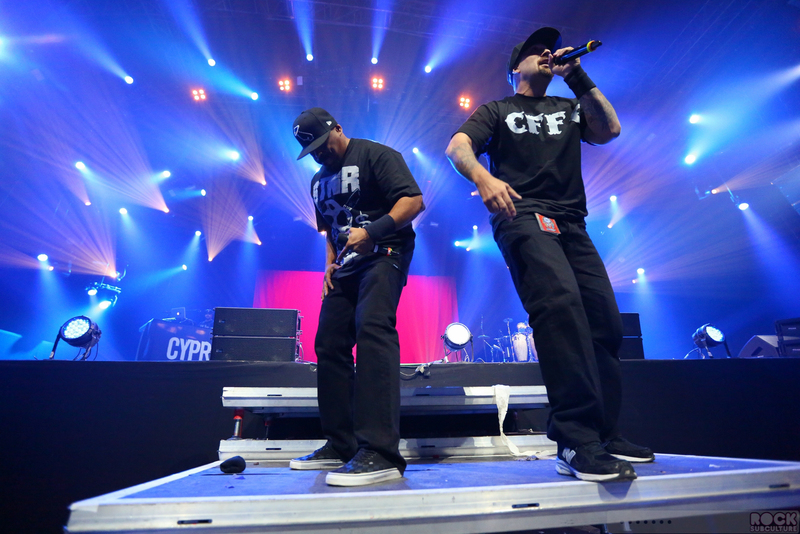 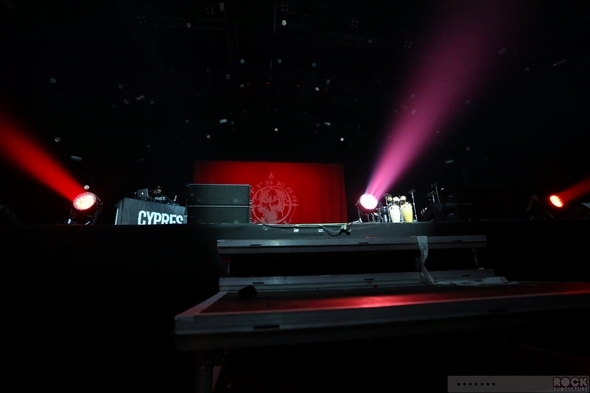 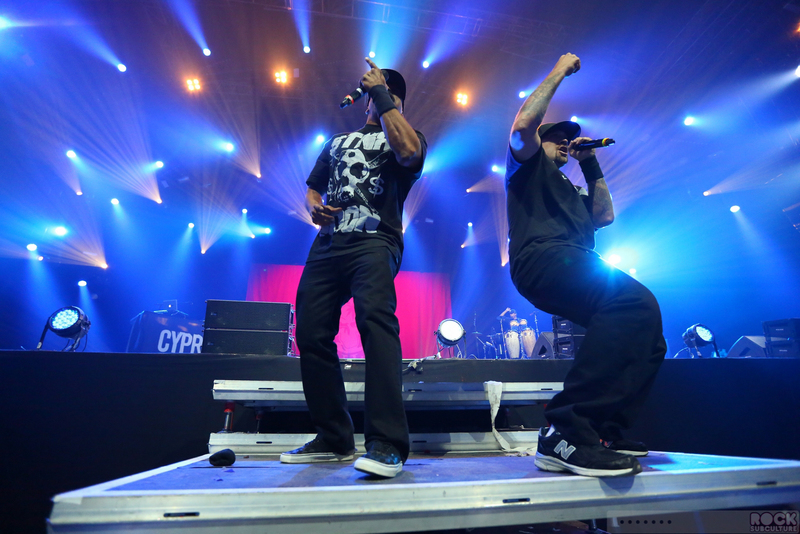 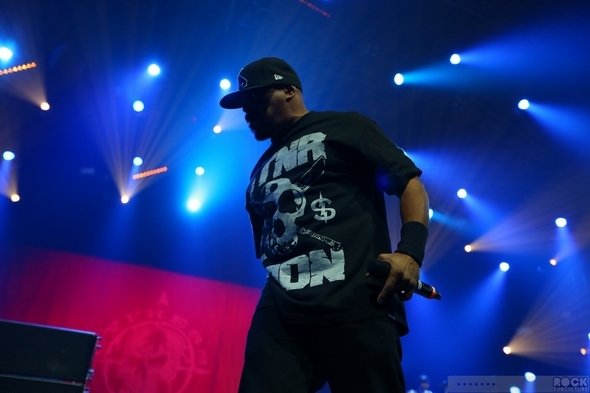 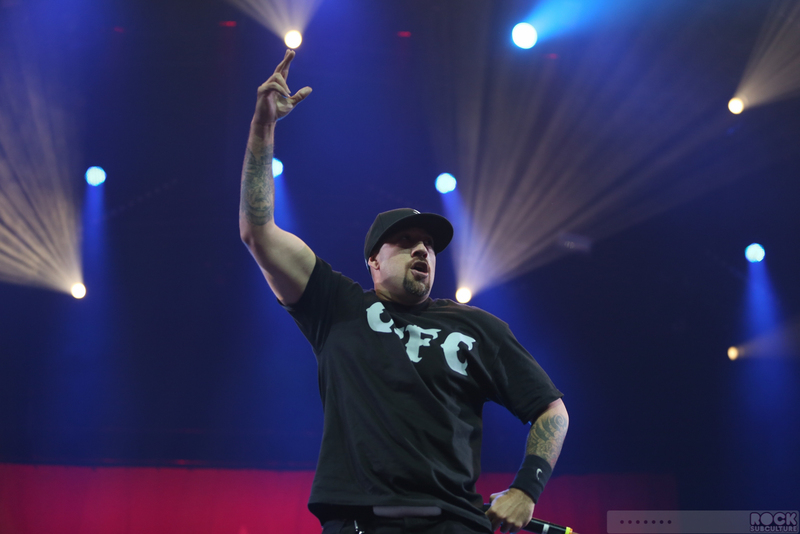 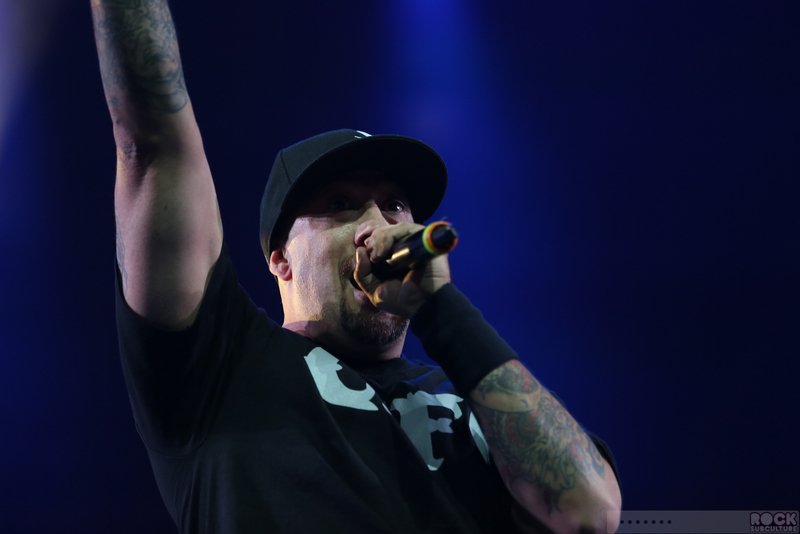 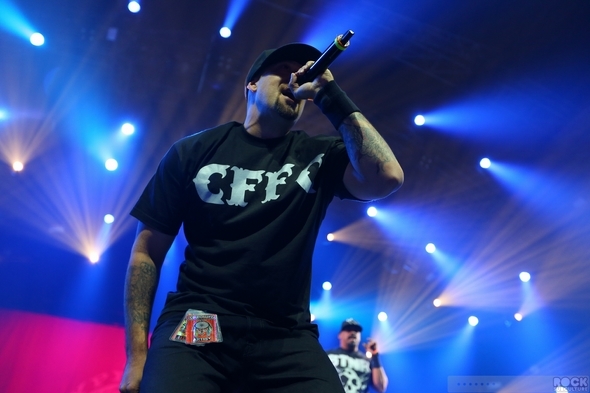 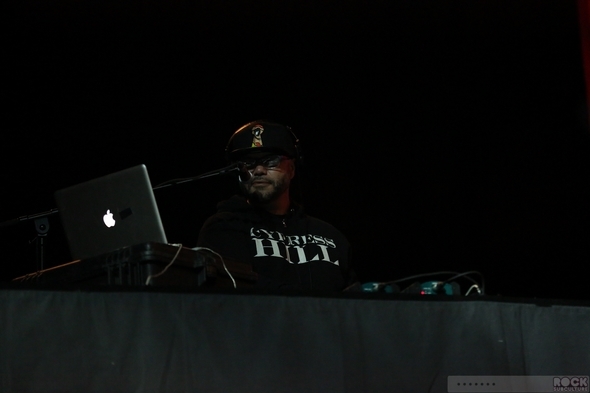 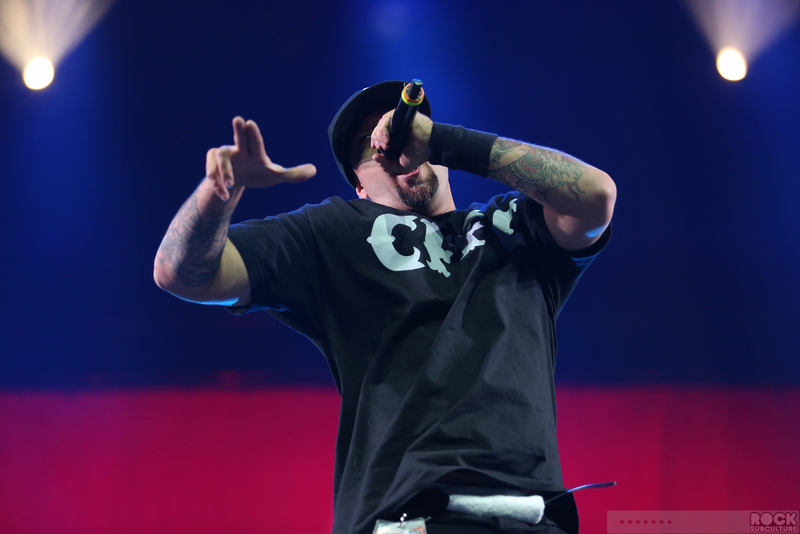 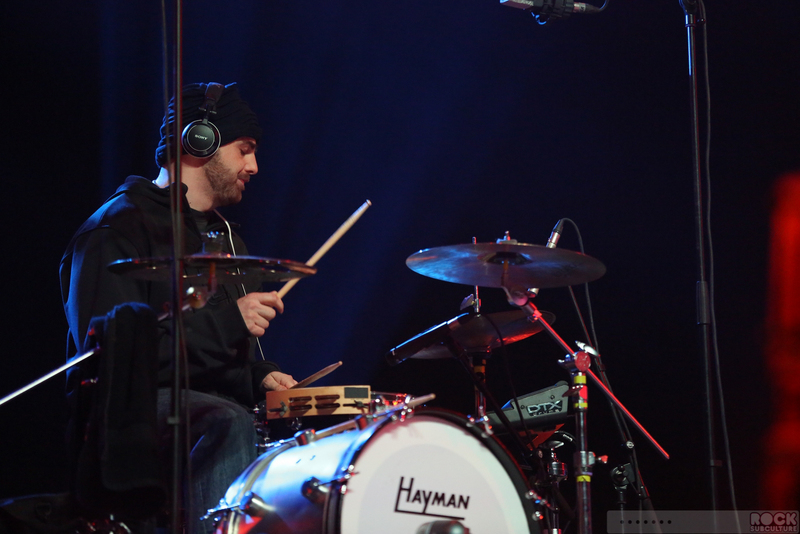 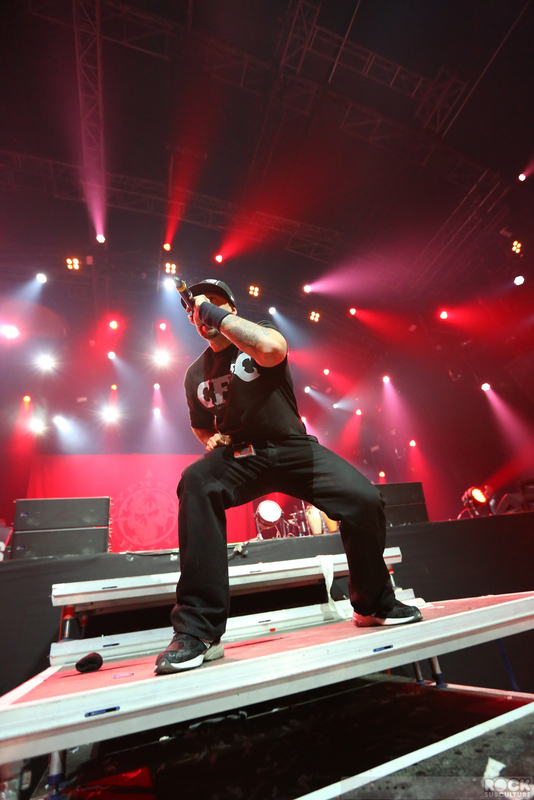 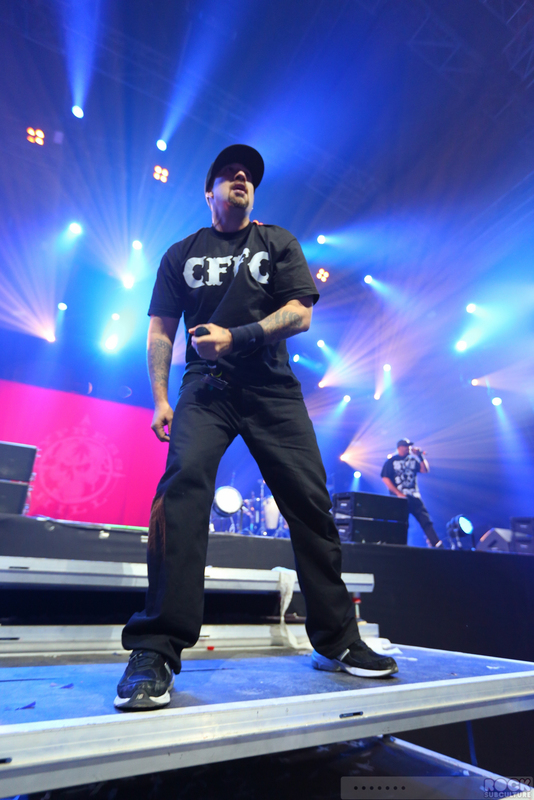 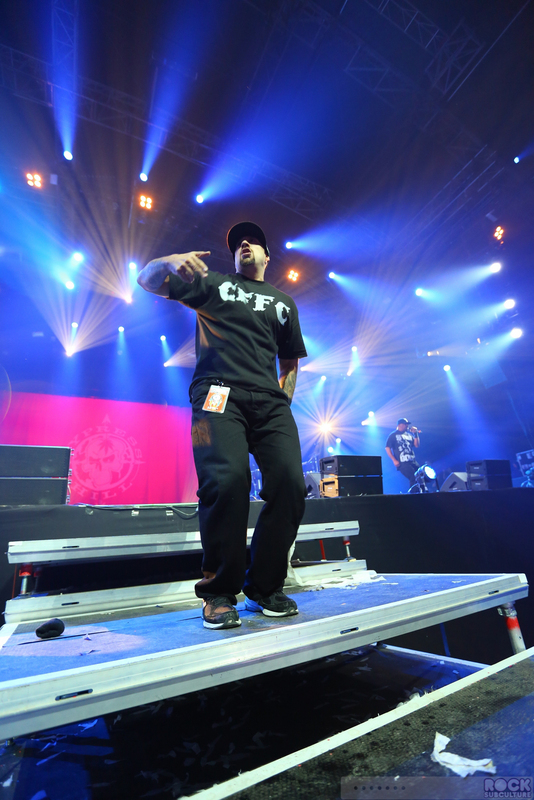 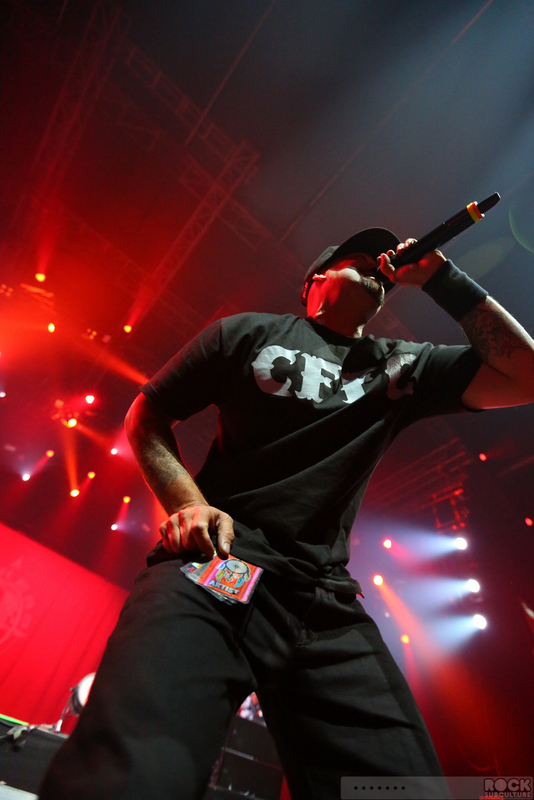 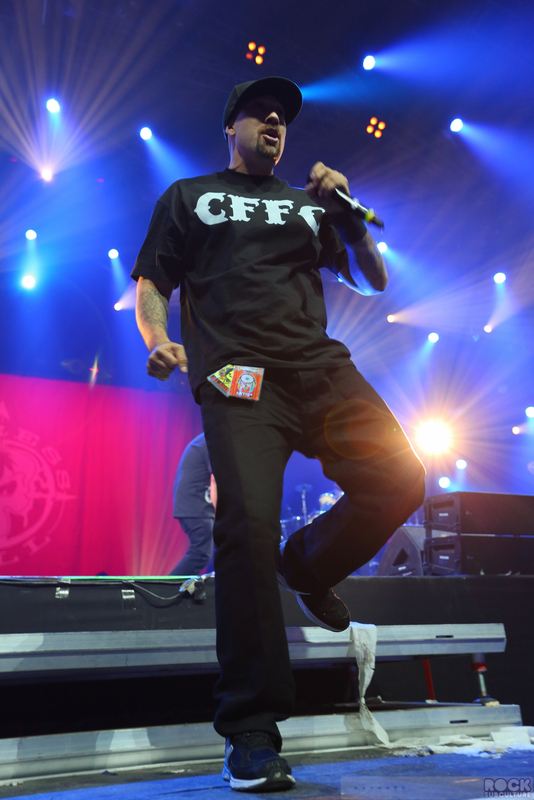 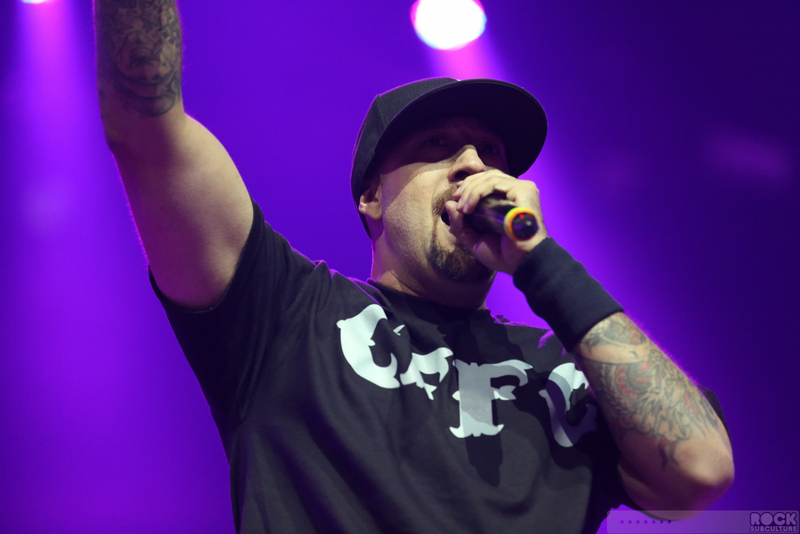 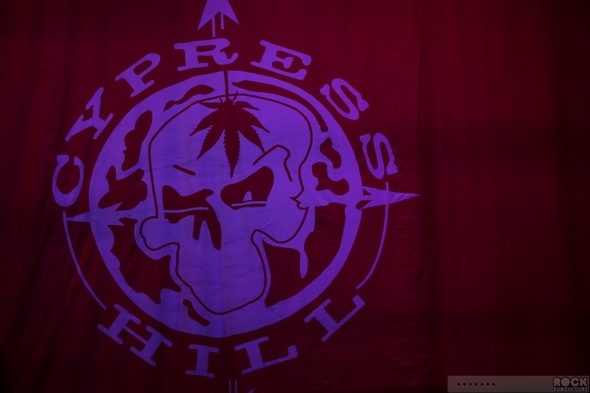 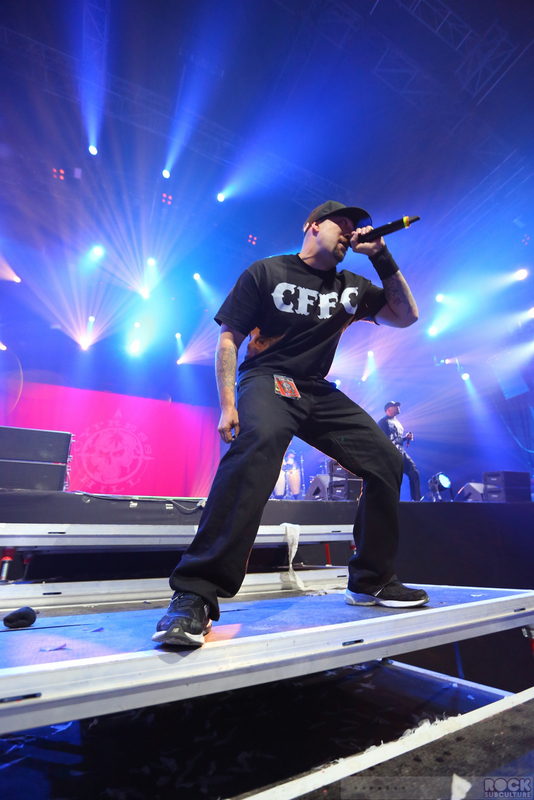 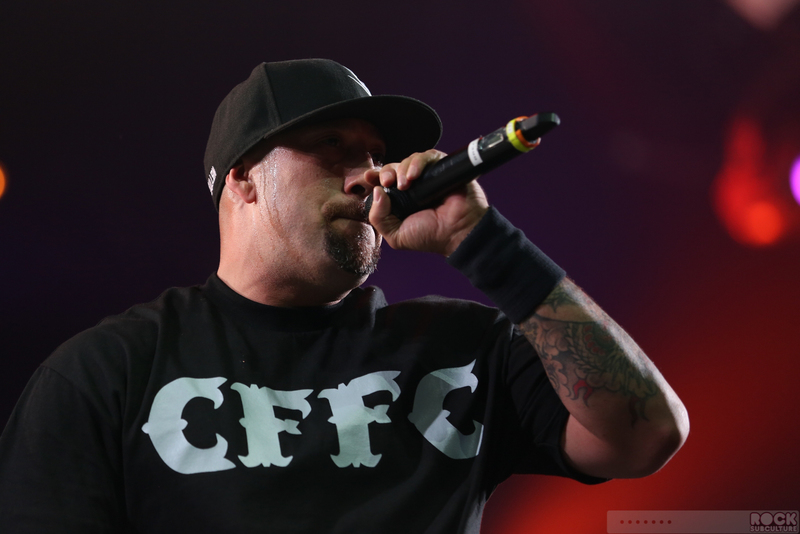 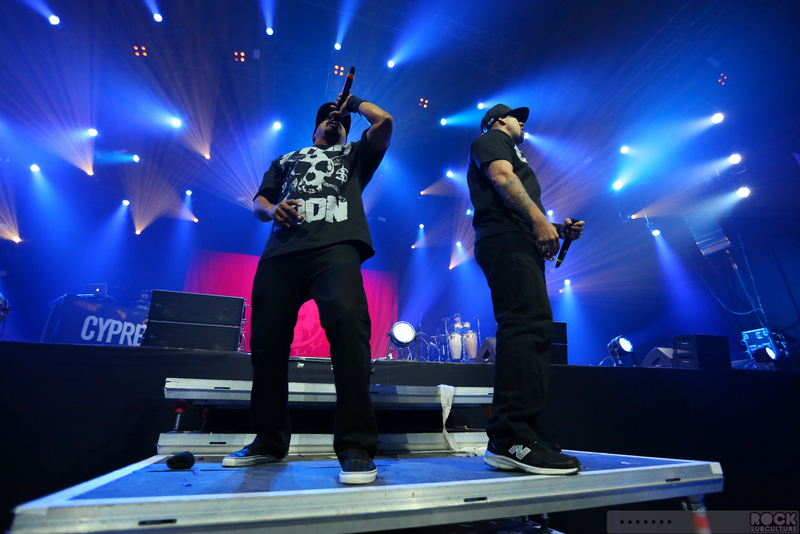 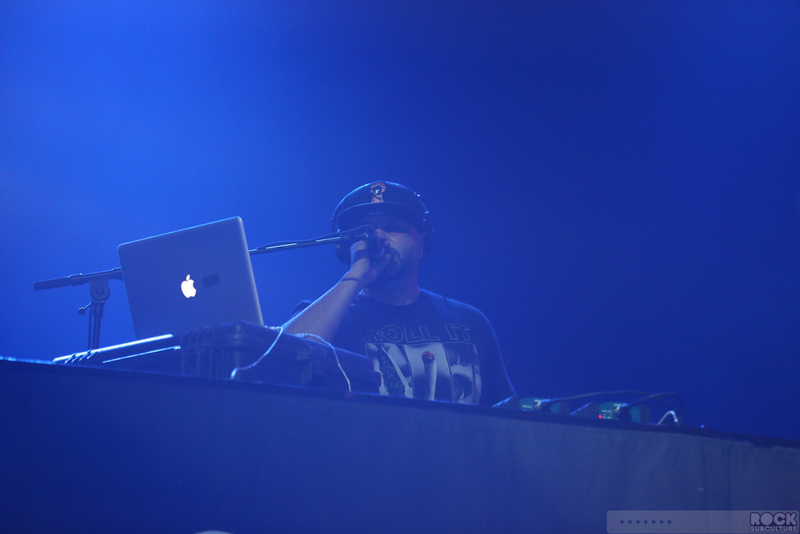 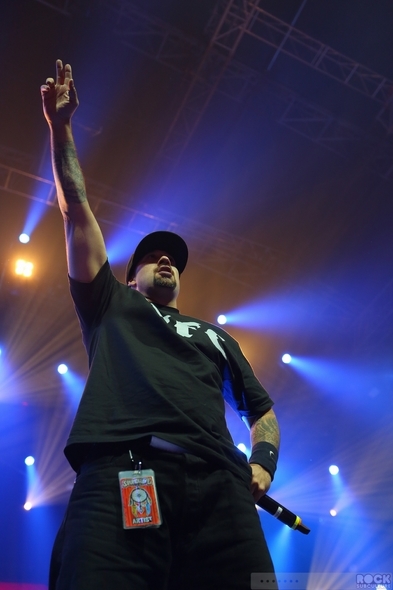 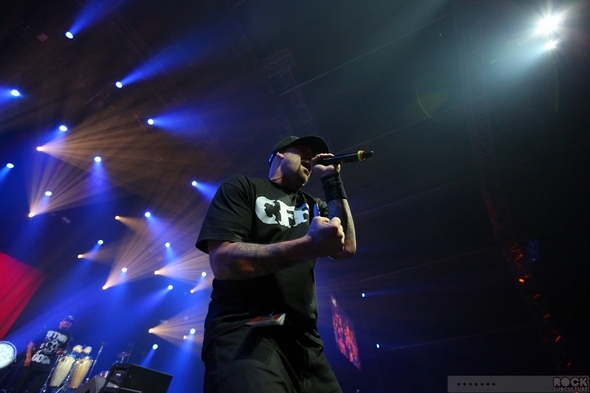 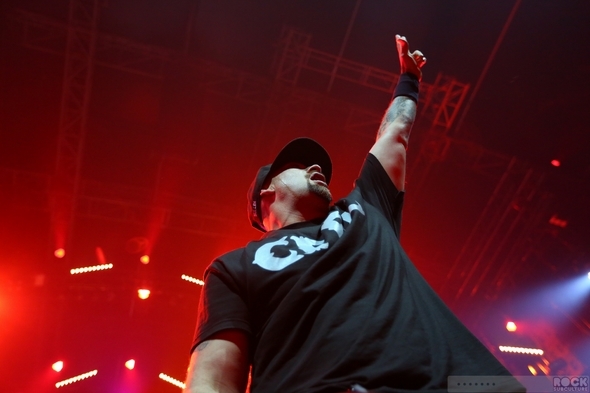 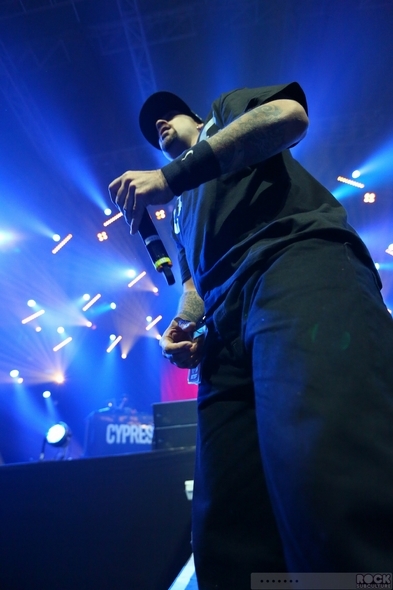 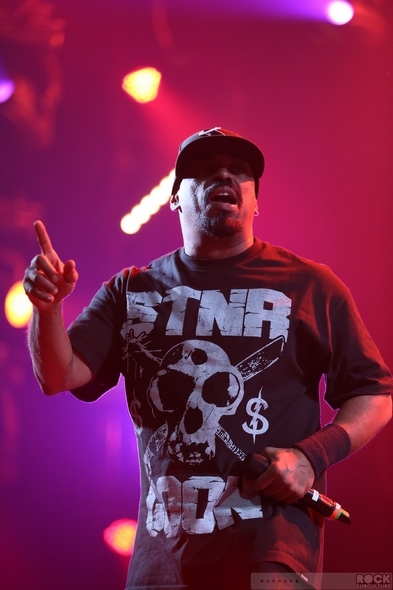 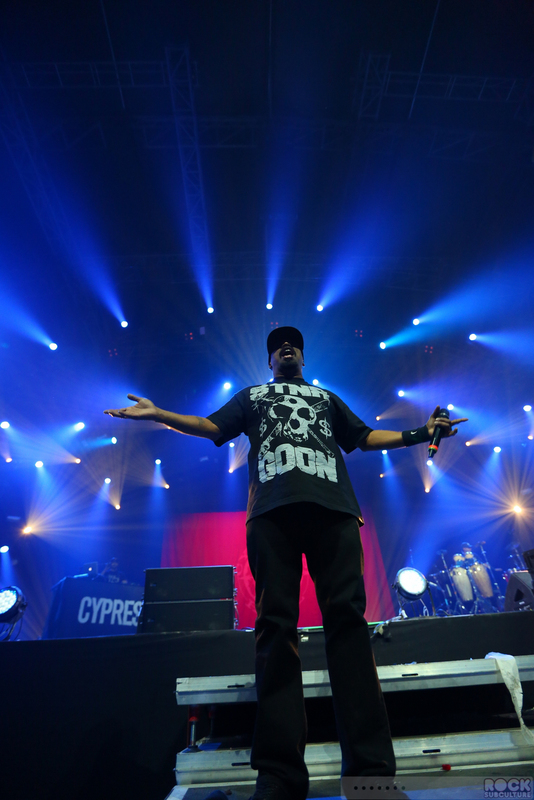 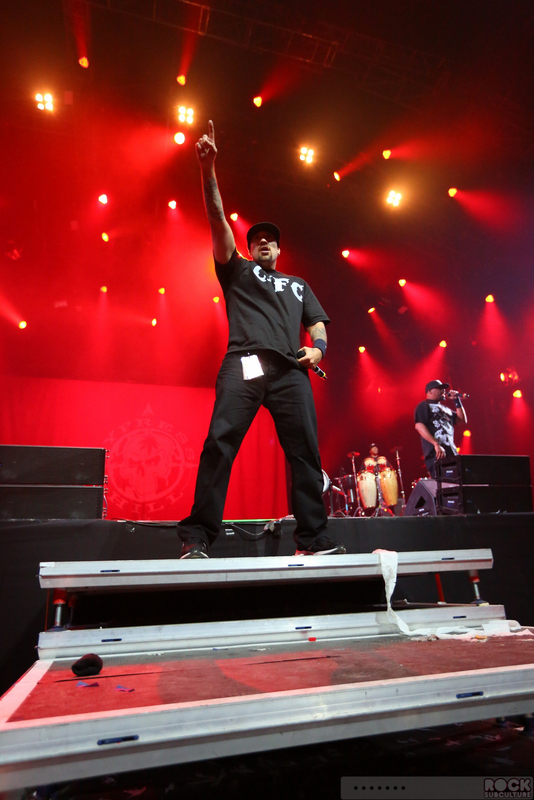 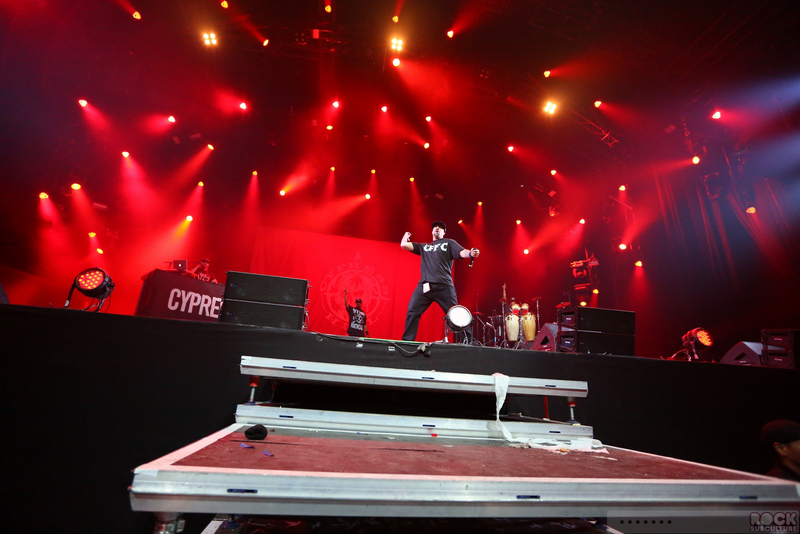 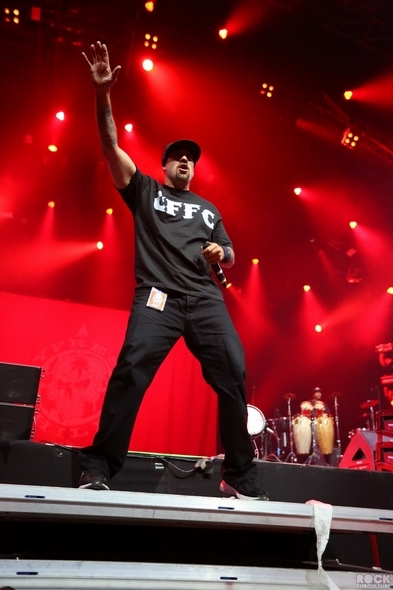 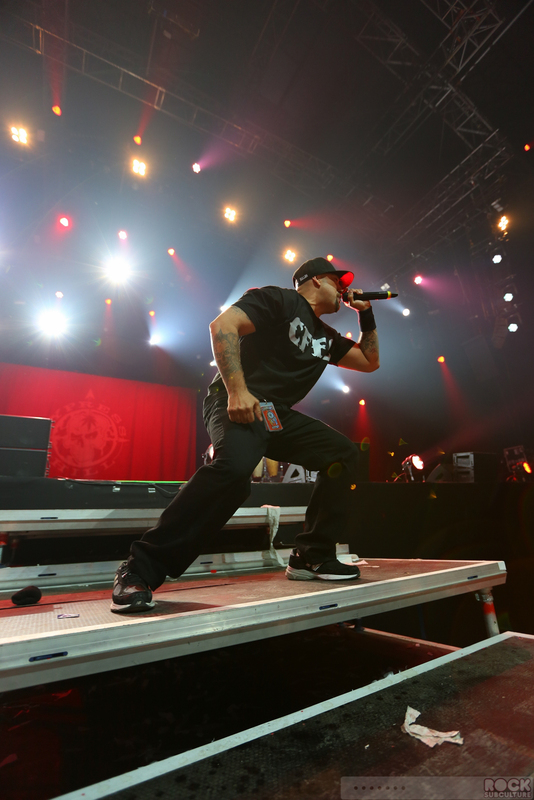 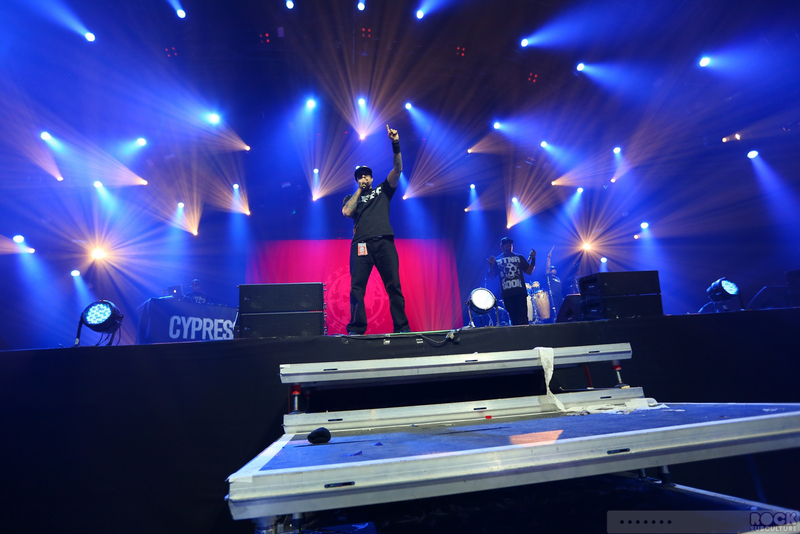 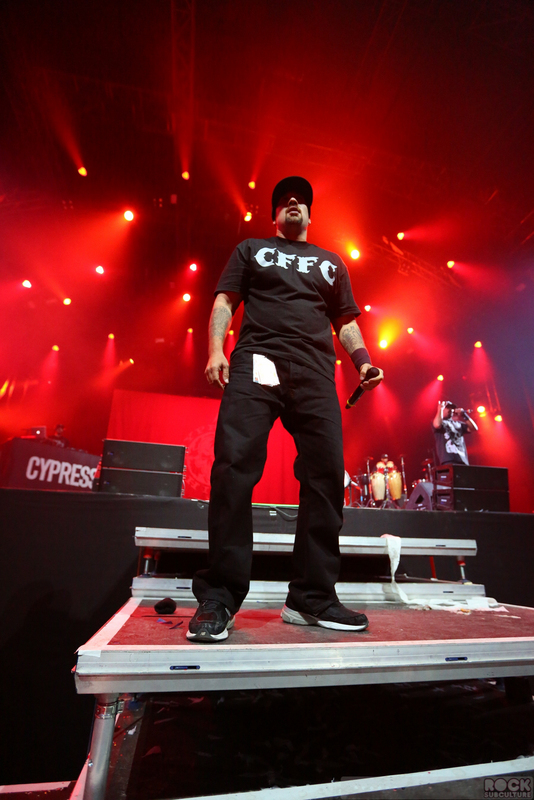 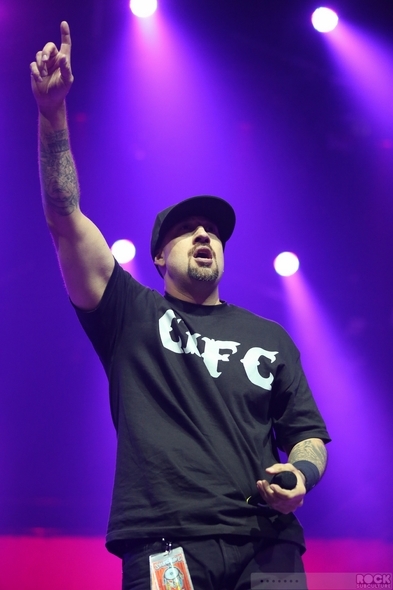 Cypress Hill has been very prolific in their career, putting out ten studio albums, most recently Cypress X Rusko last year. 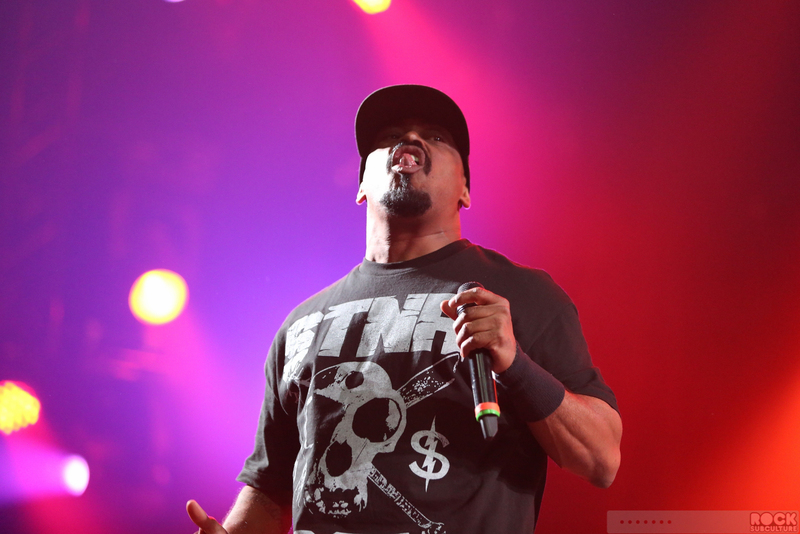 Like Method Man and Redman, they are a bit obsessed with marijuana, but that seems to be popular with their fans as well, so it is what it is, I guess. 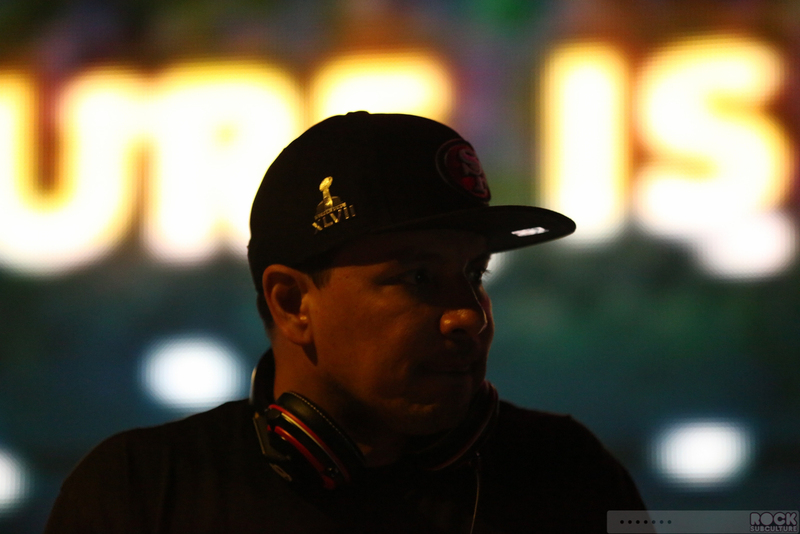 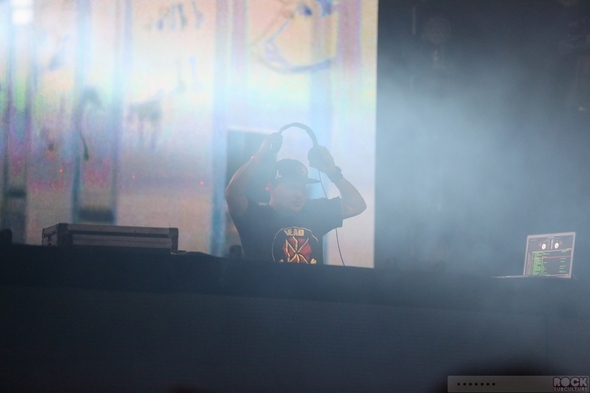 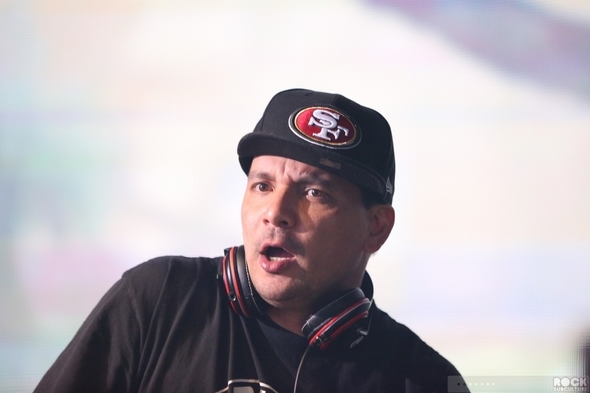 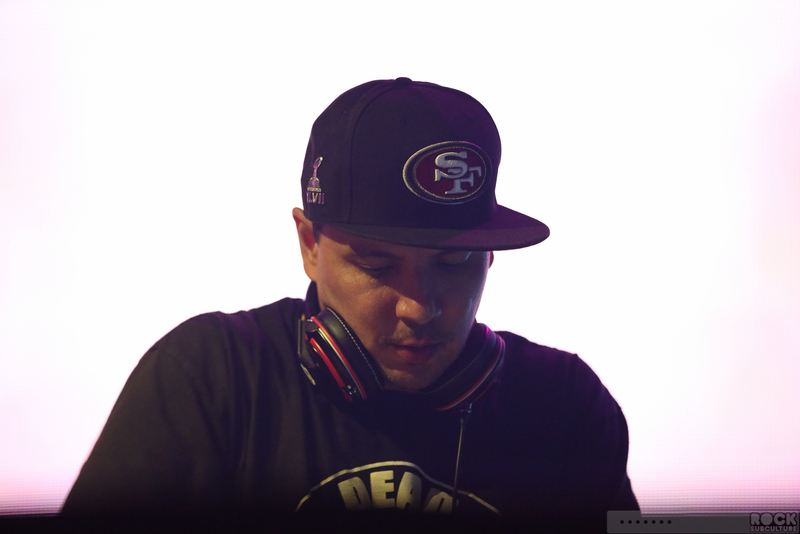 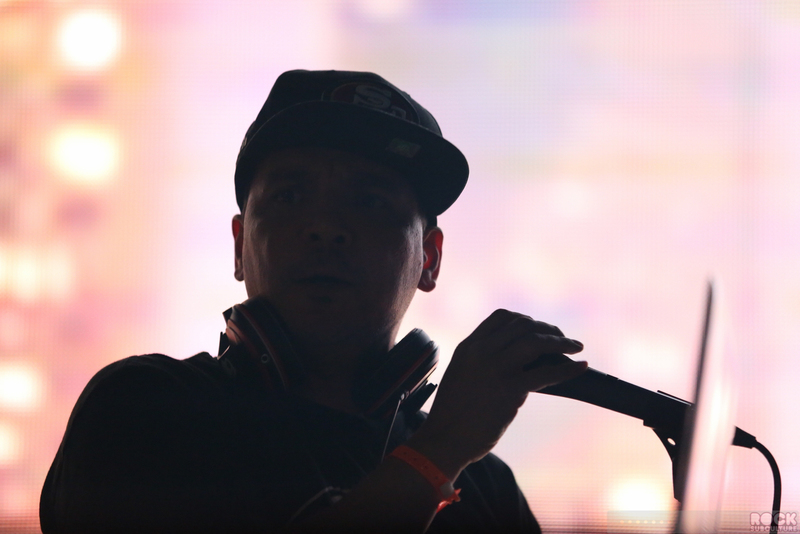 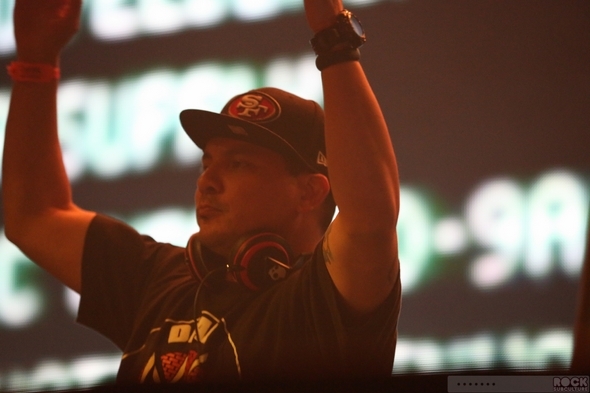 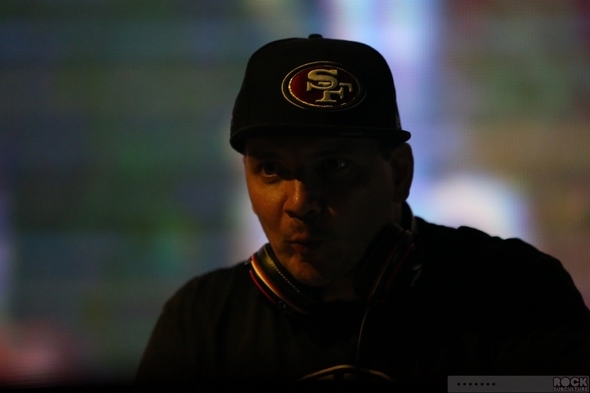 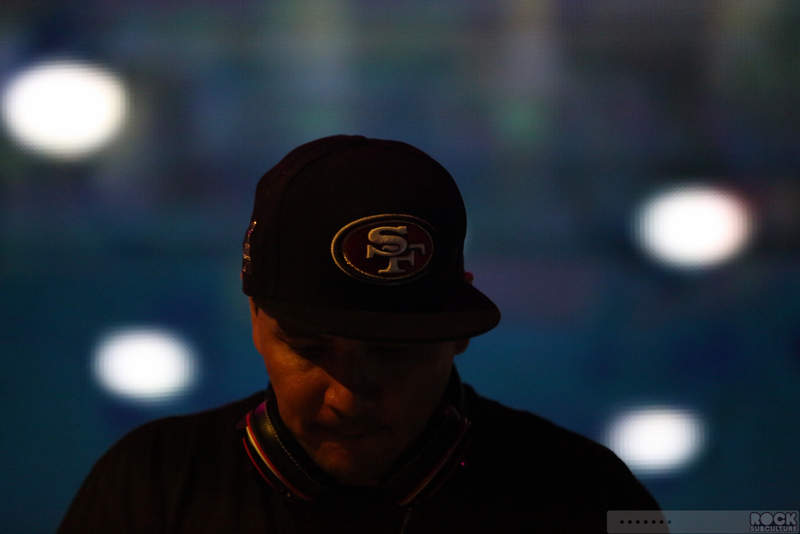 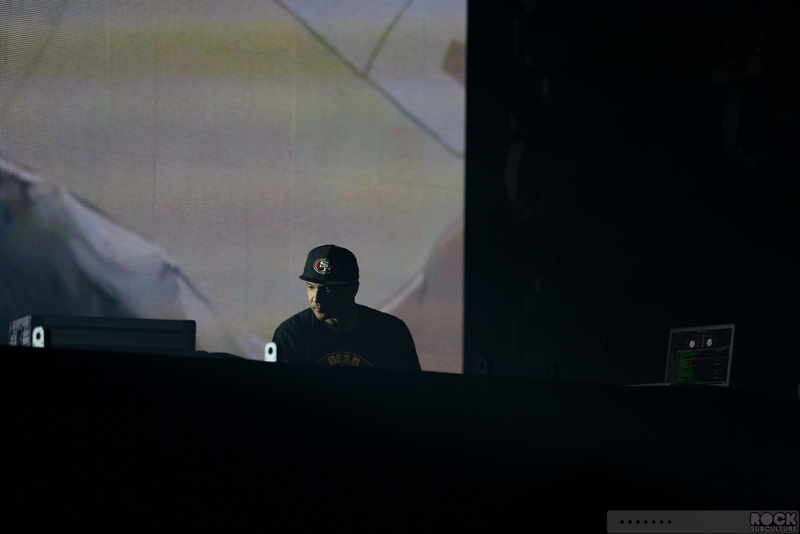 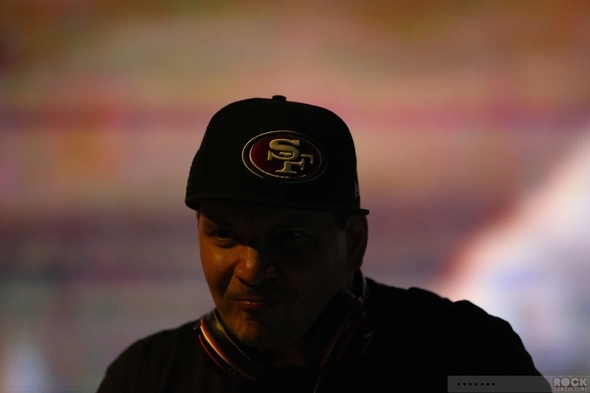 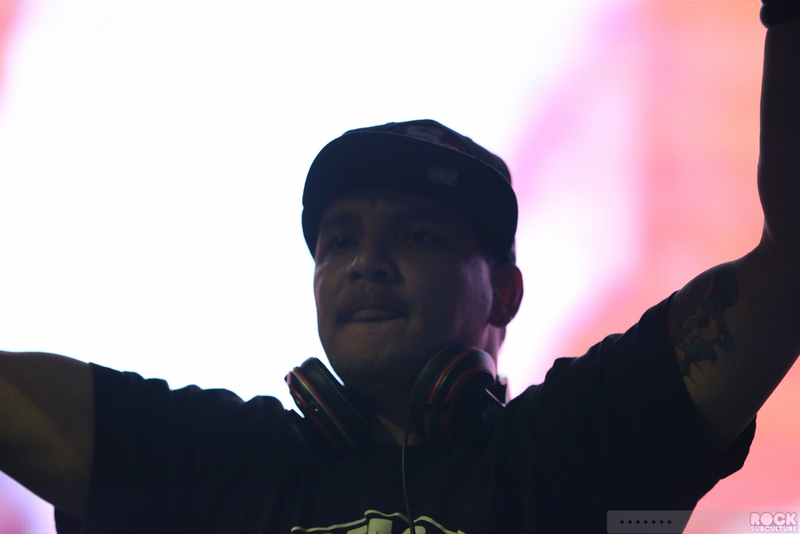 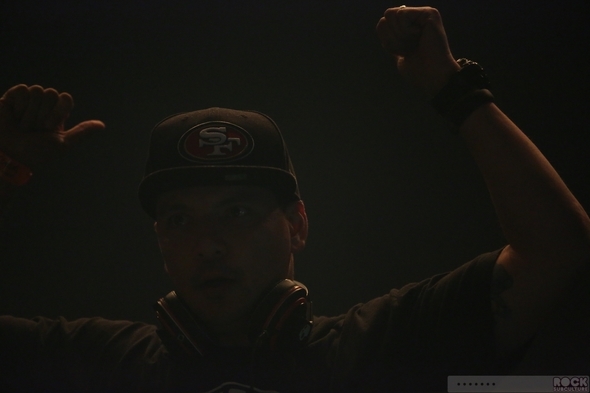 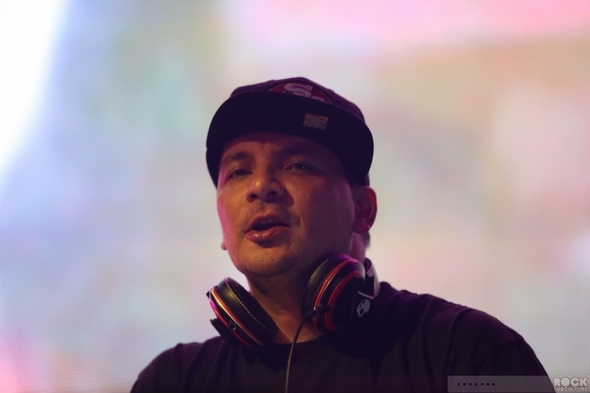 Mix Master Mike is the one DJ I was most looking forward to seeing, as I know some of his work from his association with the Beastie Boys; plus, being in Switzerland and both being from Northern California, we were practically neighbors all things considered. 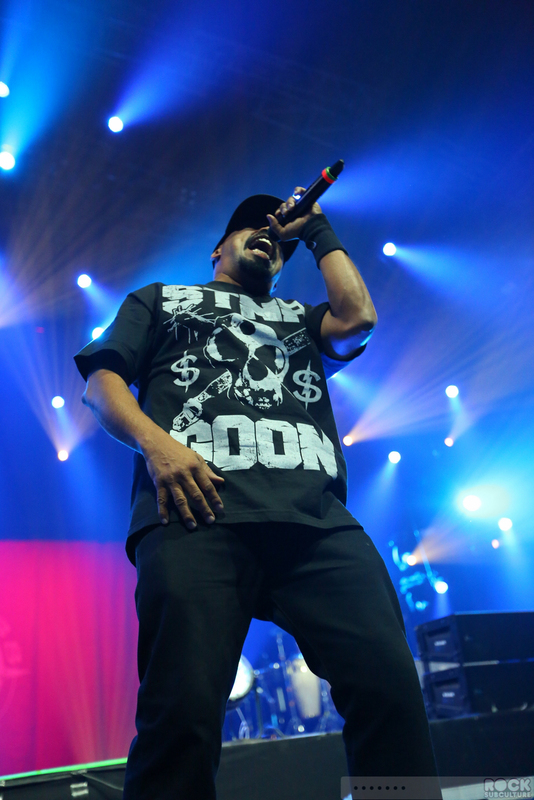 He did not disappoint; as he rocked The Tube he sucked in the audience from the Cypress Hill show that ran over just before, and filled the place to capacity with awesome mixes and an entertaining visual show via the large screen behind his raised DJ area.